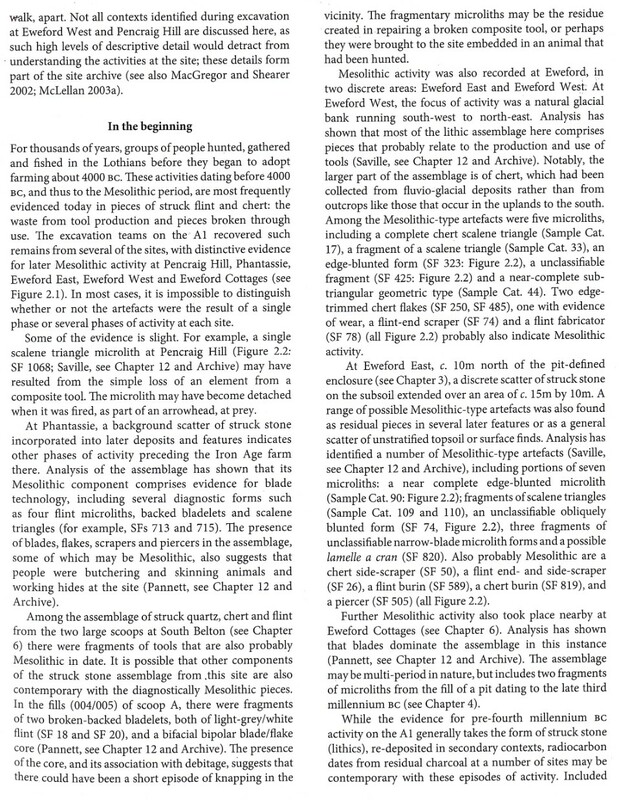 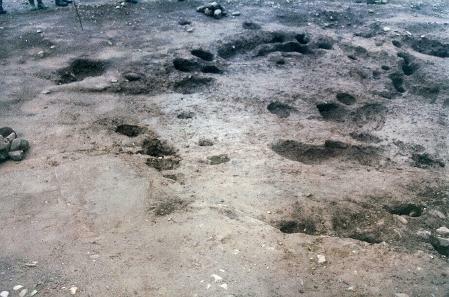 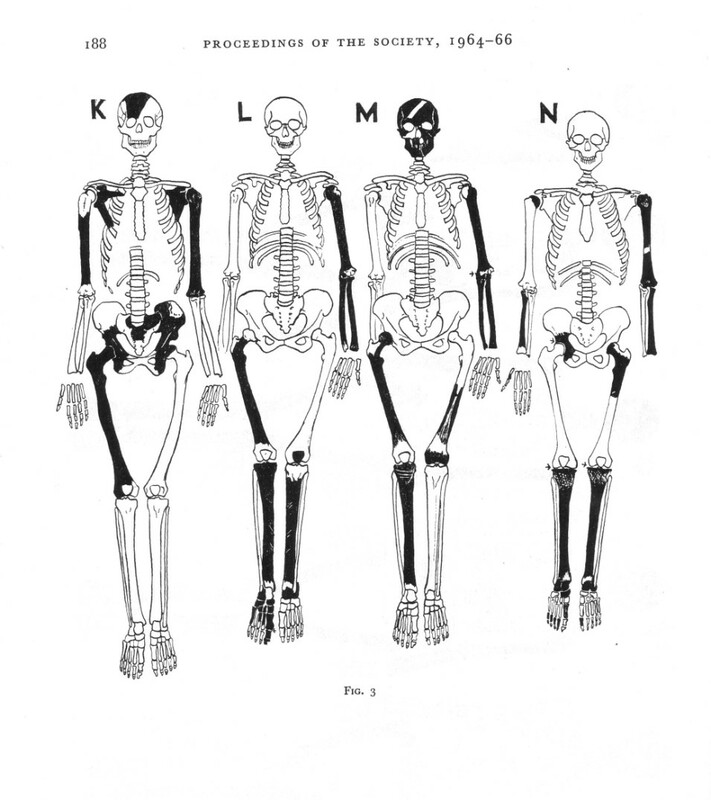 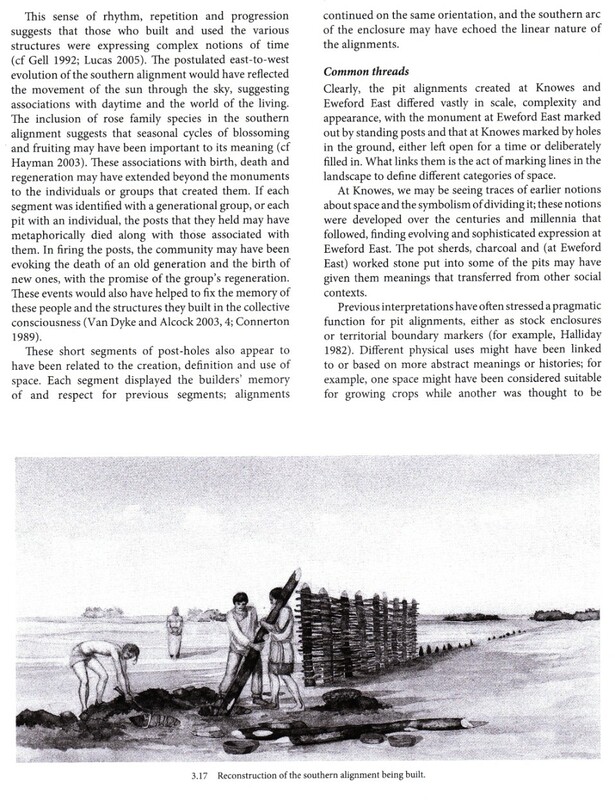 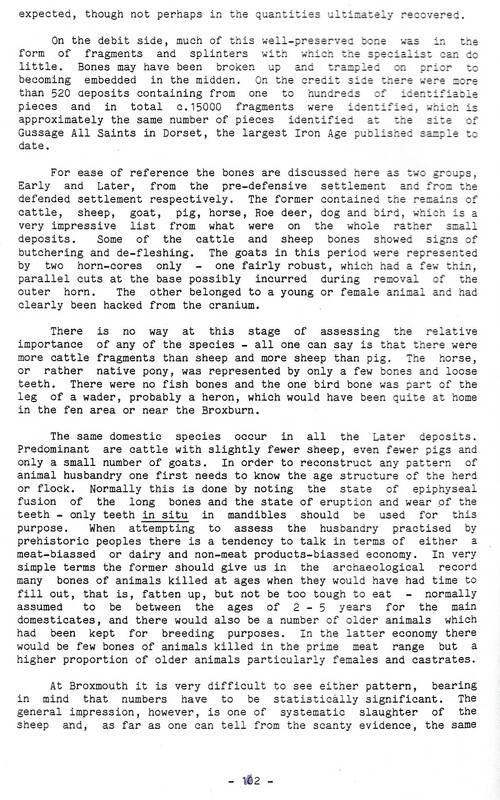 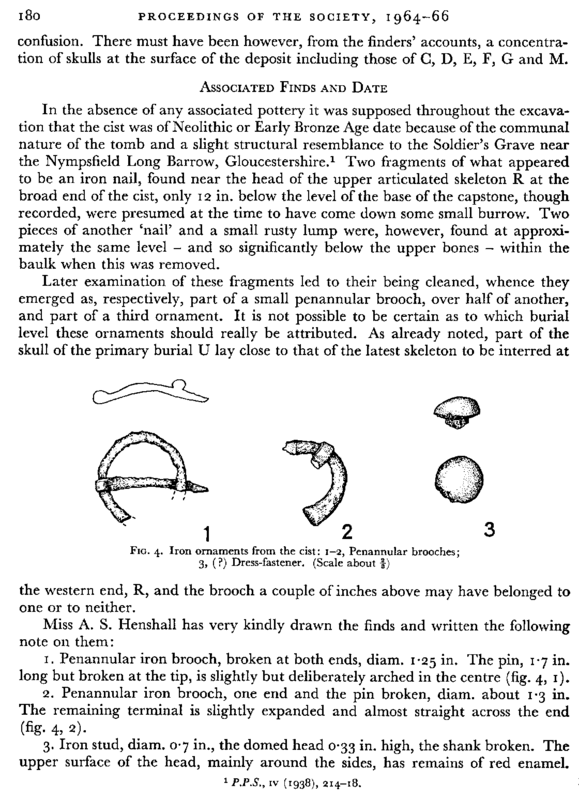 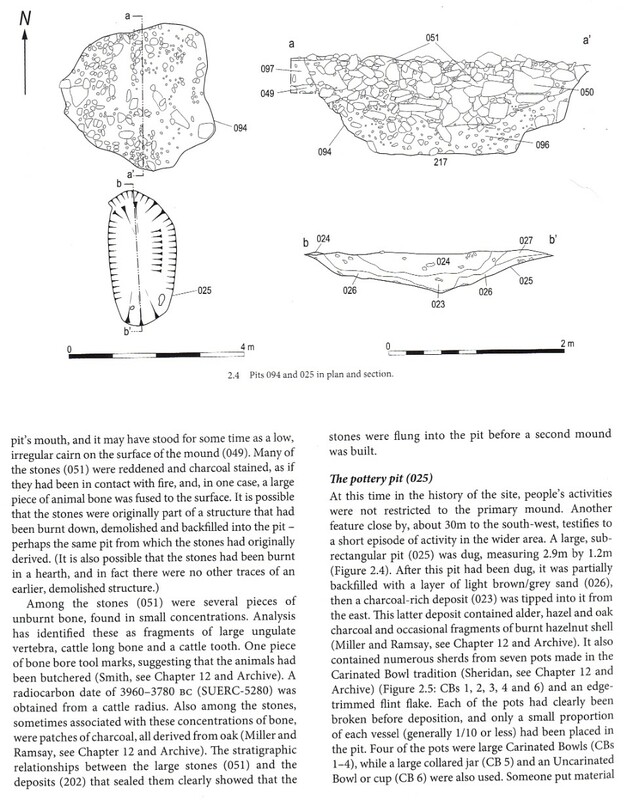 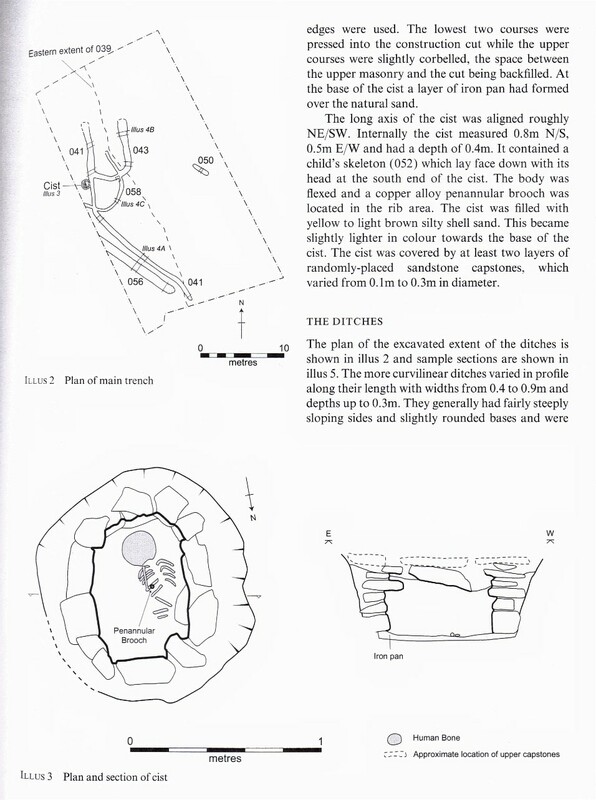 Below is the Mesolithic site from 8,064 BC. 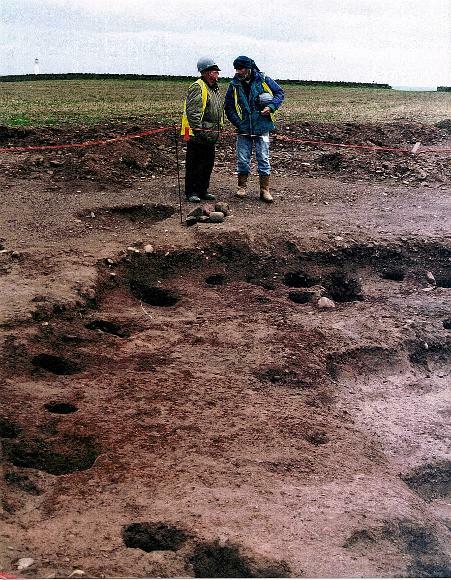 Scotland's oldest house just off the A1 at East Barns outside Dunbar. 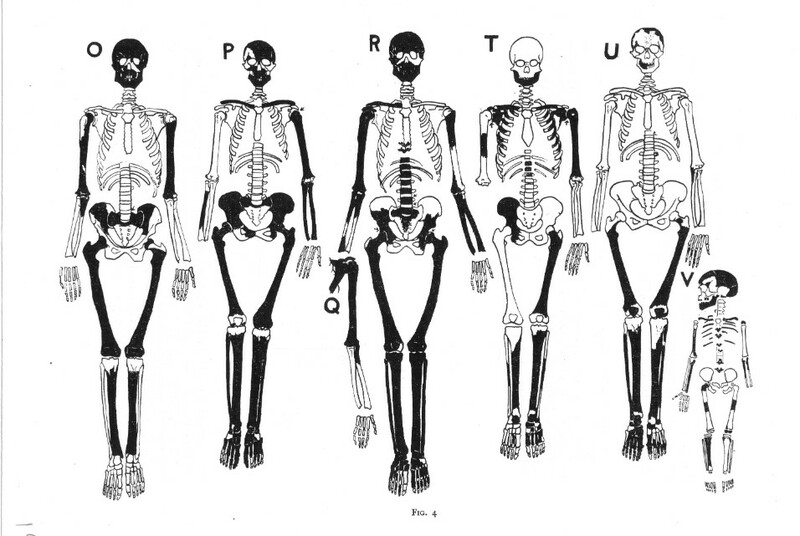 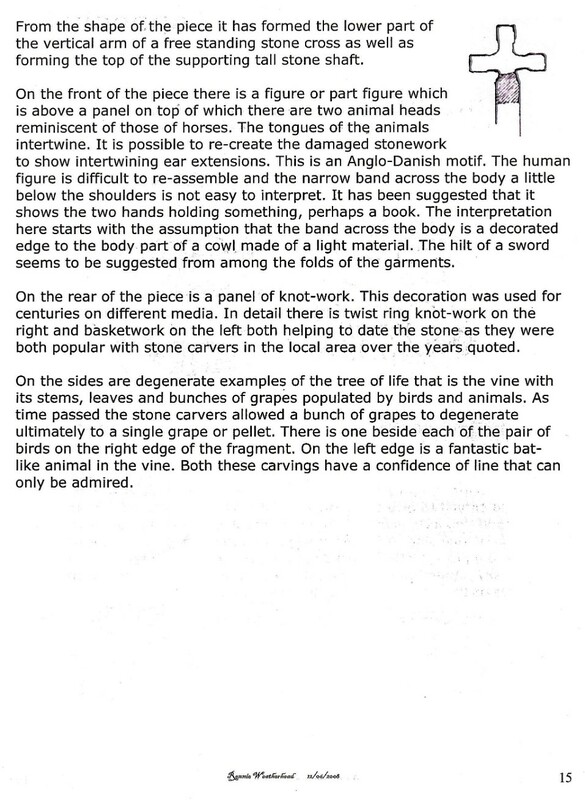 This is all that is left for you to see. 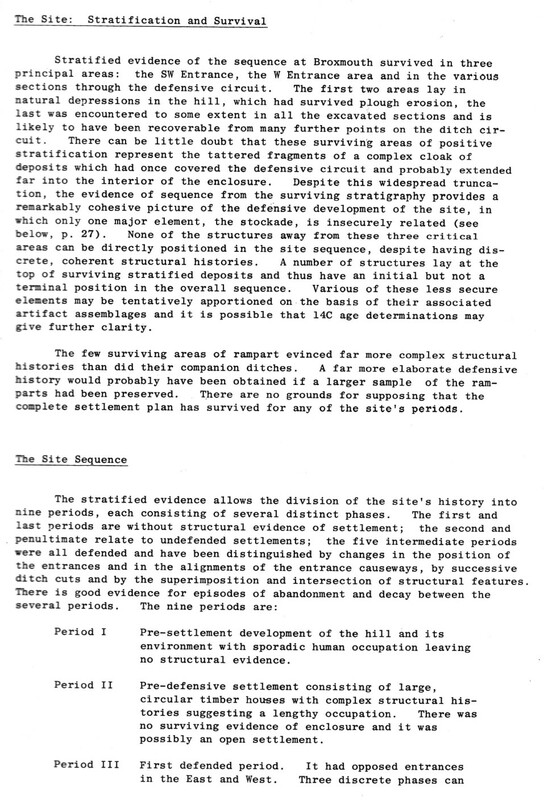 It is now a quarry over 200 ft deep. 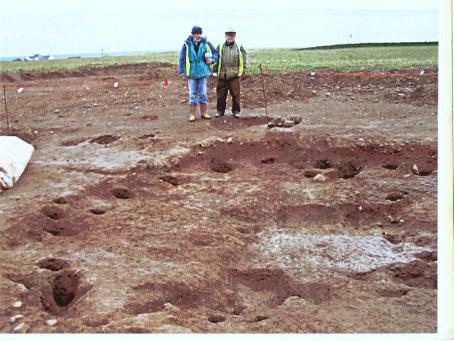 The Bellpots site, like those SE of what is called "Samoya", the banking (which was part of the Kirkill leading up to the old church) adjacent to the middle or East Links Road some prominences* around Lochend/Hallhill and possibly investigate further the ancient tracks heading from the SW to the Great Loch, & try to delineate the extent of the" necropolis" on the lower lying links at Winterfield ( see previous ) these if excavated over a reasonable period would make quite fascinating "working" archaeological locations. 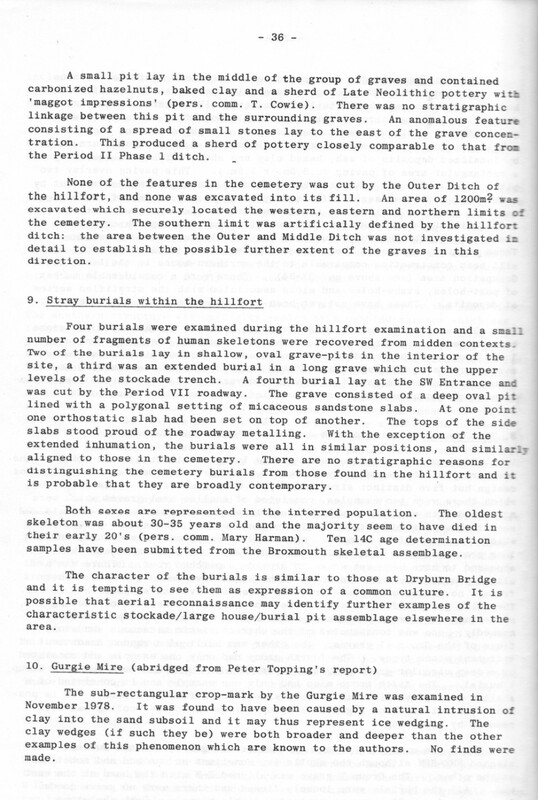 Bellpots with its position near where the Hedderwick burn disgorges into the ancient Tyne has yielded a multitude of finds from the early 1950's through to the 70's which were never really recovered. 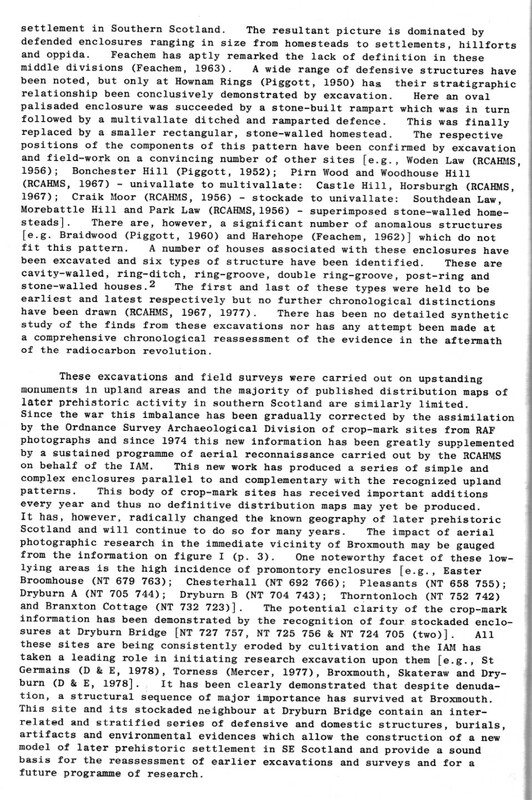 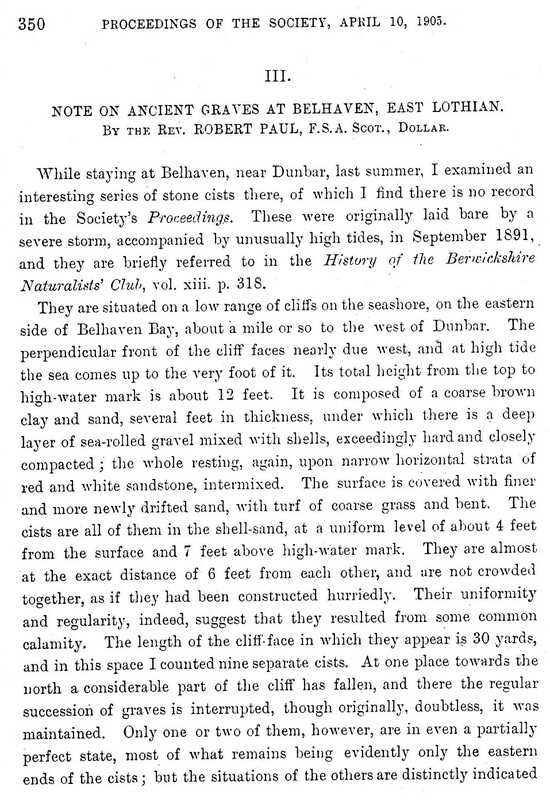 There was even a retired teacher from North Berwick who spent many-a-summer intimately researching and recording the area. 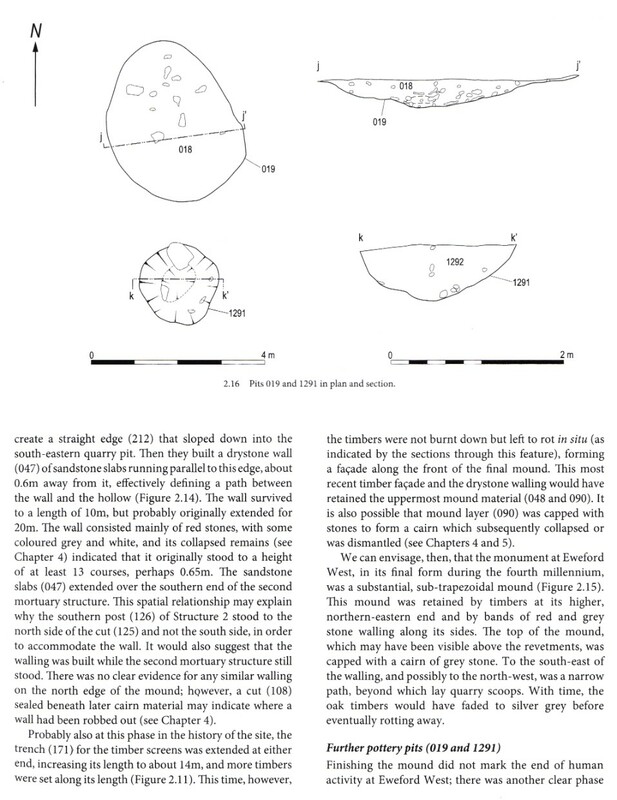 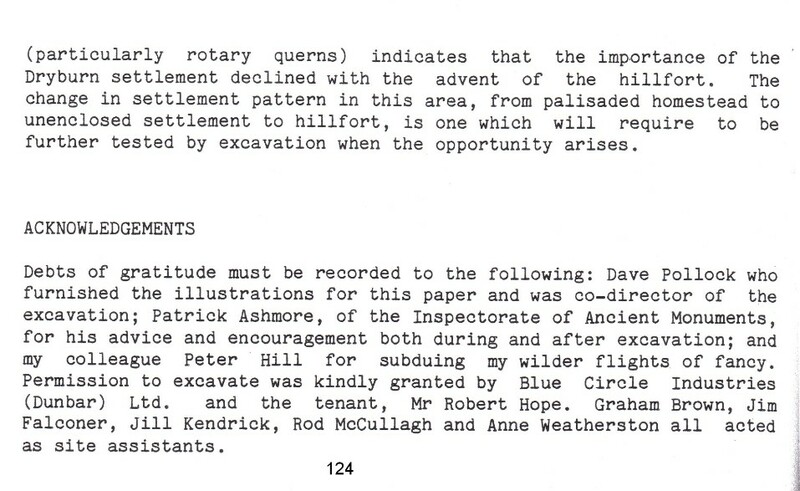 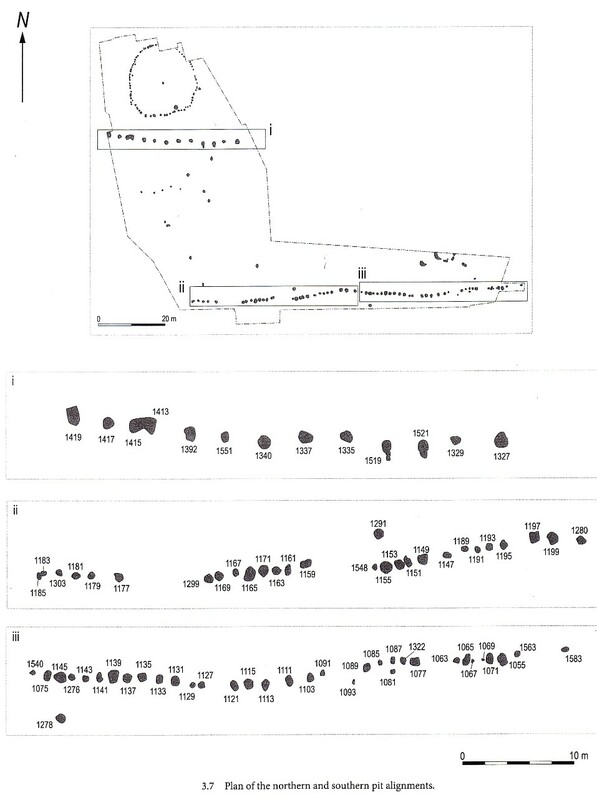 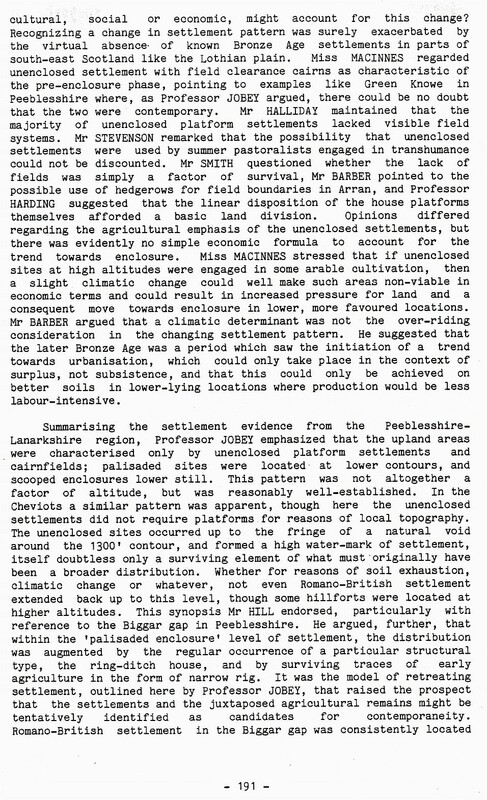 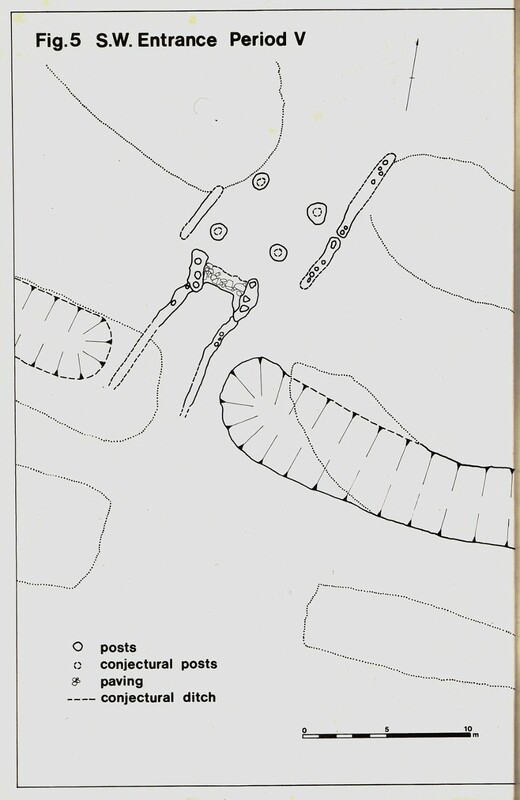 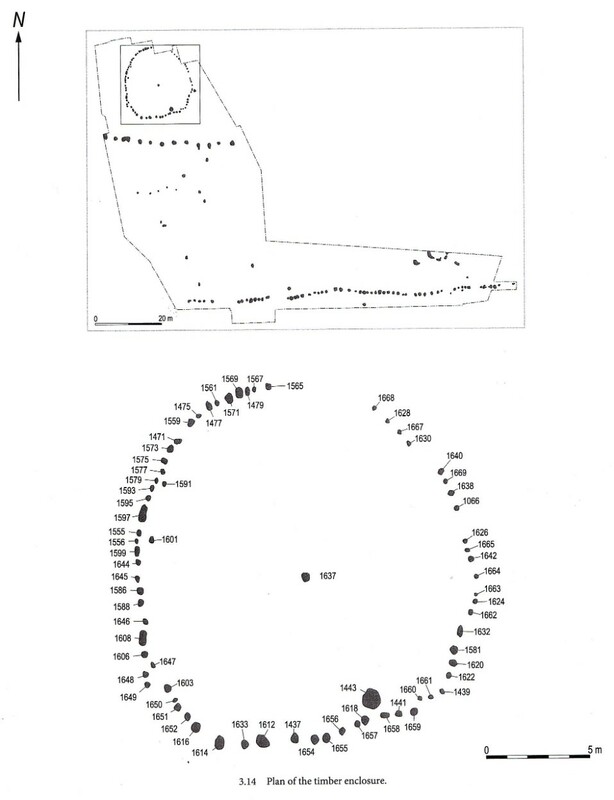 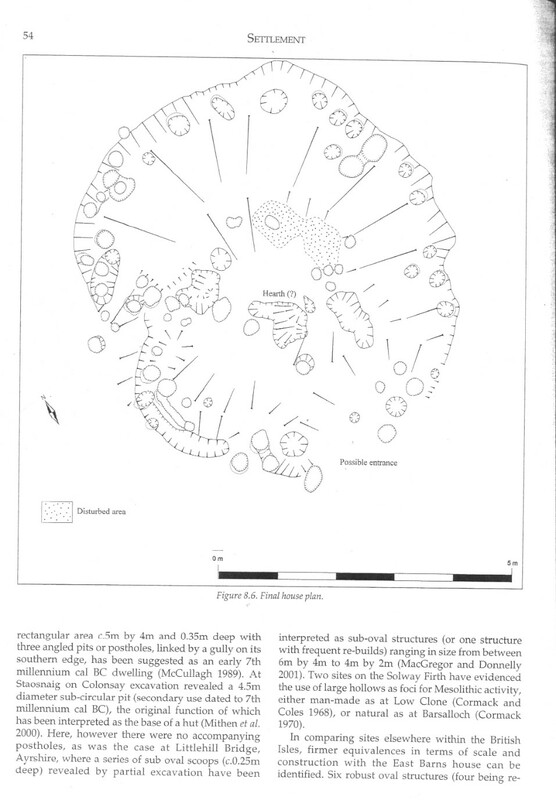 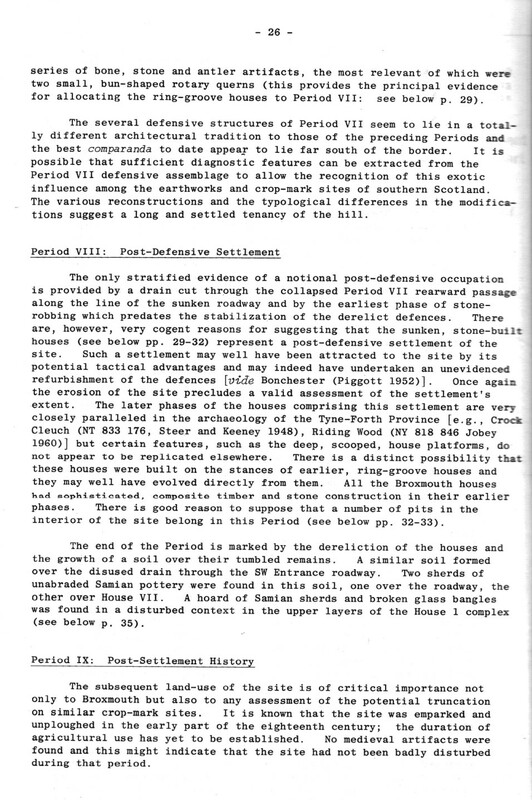 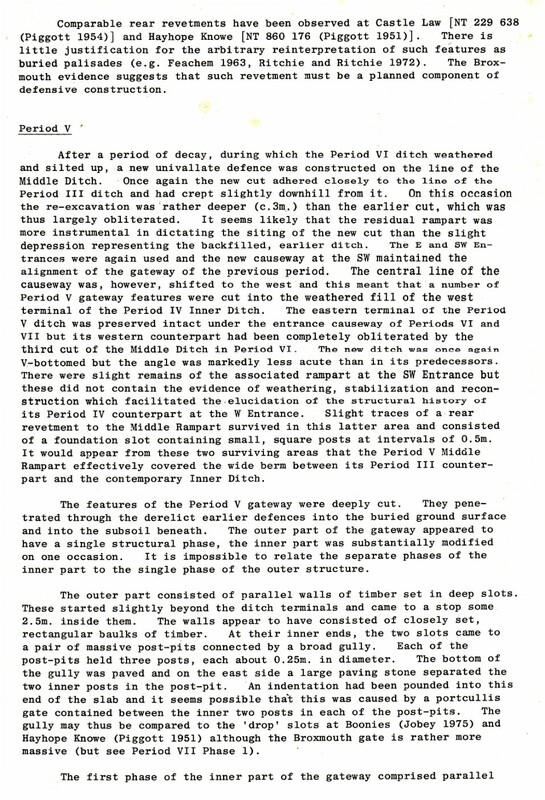 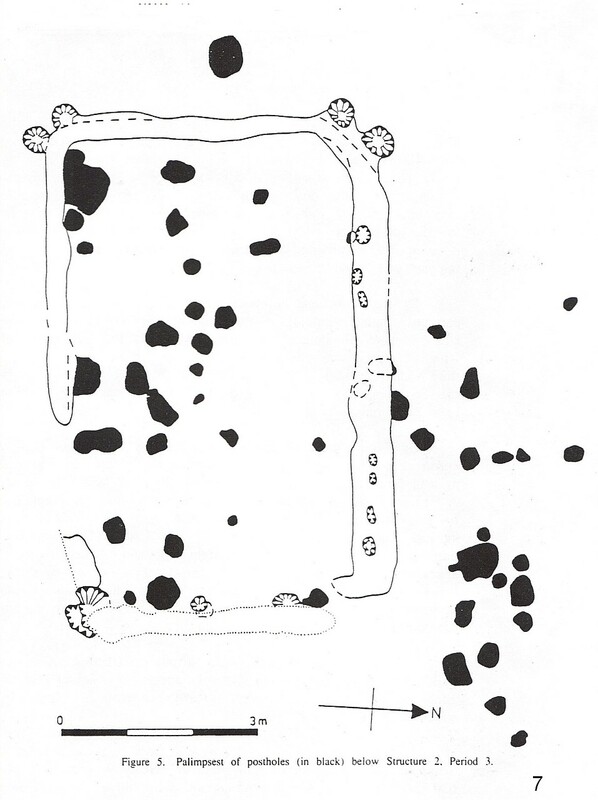 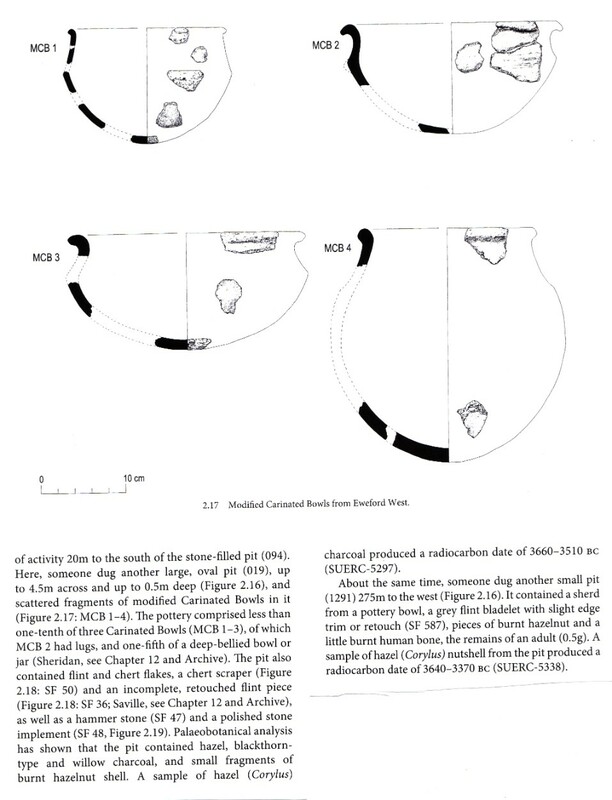 * The circular grove of yews, one third of which are up to 400 years old, inside the estate boundary wall at Hallhill steading - NT 673778- would have appeared to have had some preliminary archaeological investigations in the past six months perhaps this should be continued into the medium term. 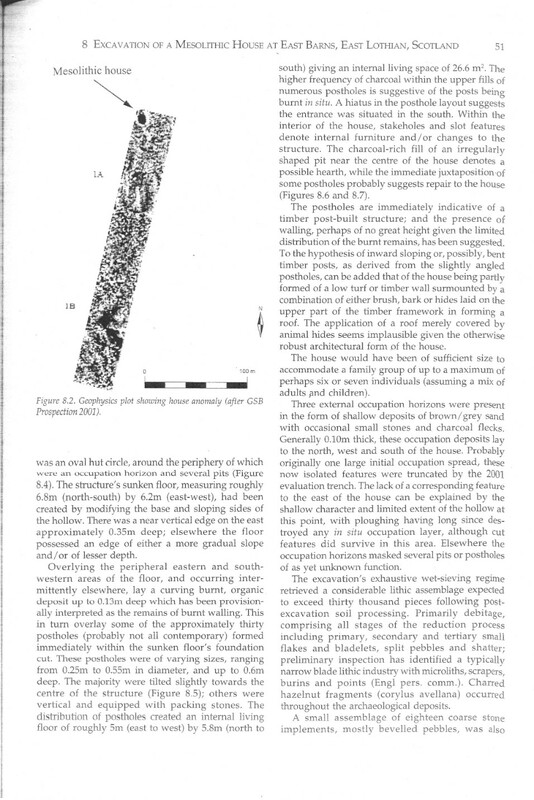 Especially when one considers the Romanesque - style ramrod straight raised track running due south from this feature for quite a distance parallel to the nearby brooklet. 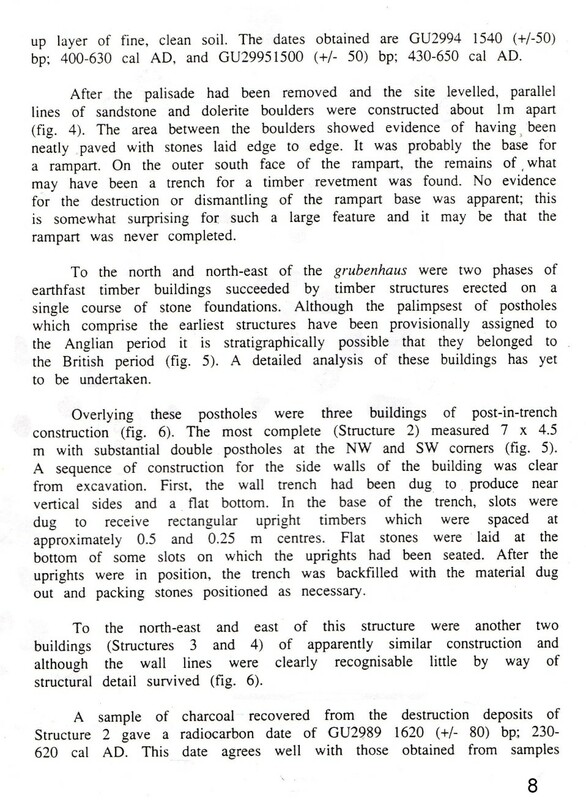 Also coincidentally less than half a mile due west there is evidence of an Anglian graveyard which may prove quite interesting. 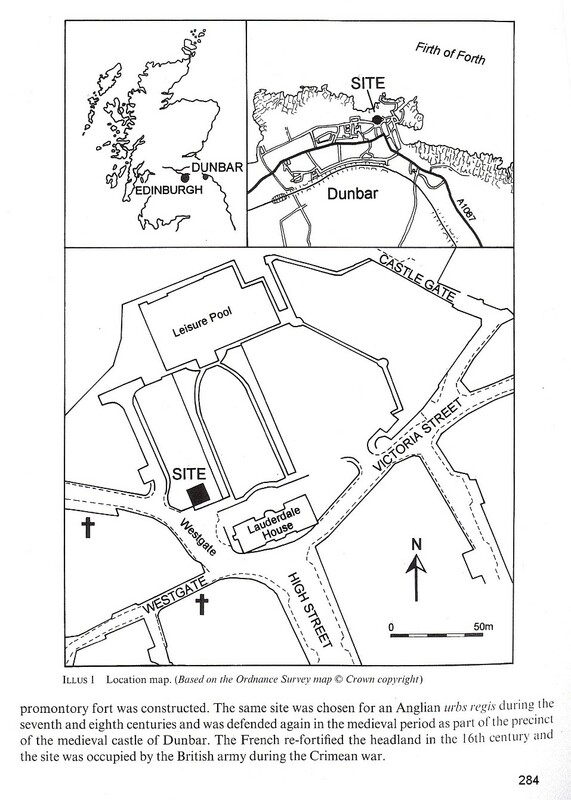 in layman's terms is a quarter-of-a-mile due South East from Lochend House and a hundred metres from the Spott Road wall to the East of Lochend Woods southern extremity. 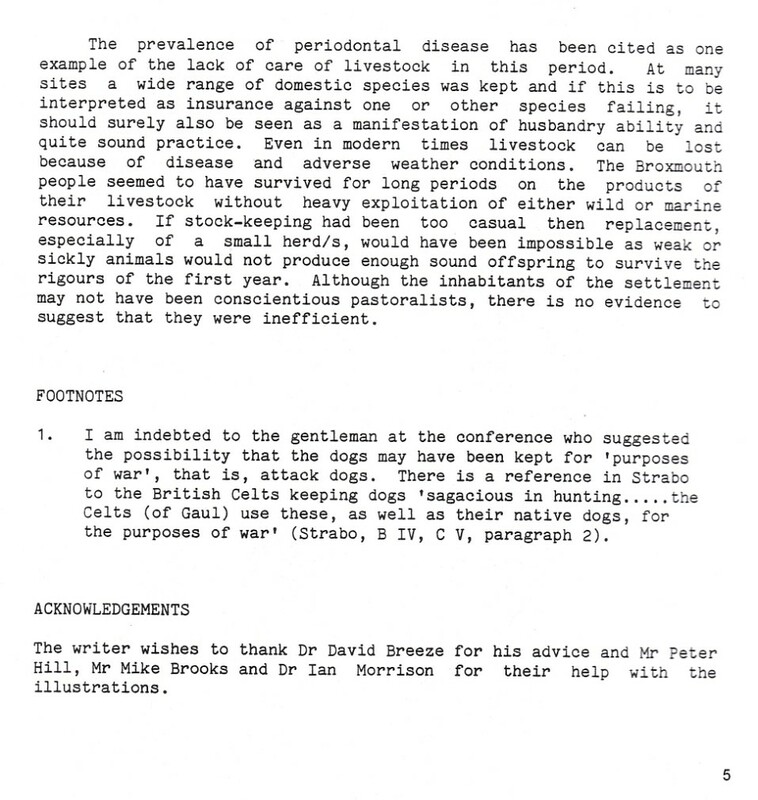 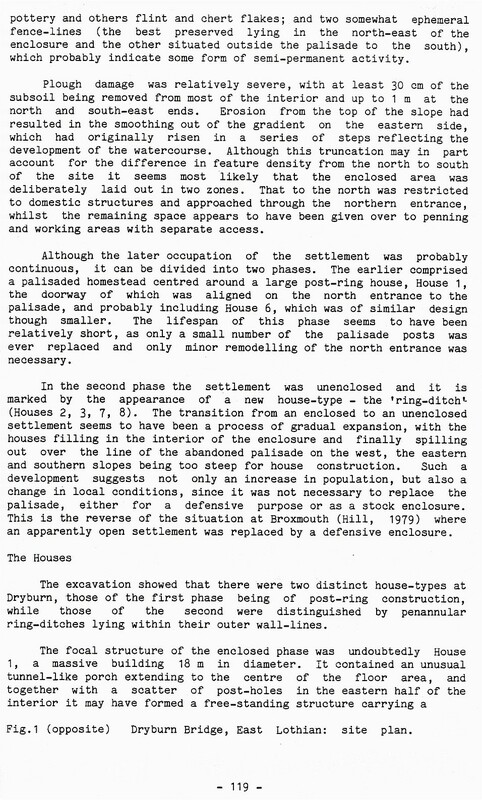 However if the present occupiers of 32 Wilson Place hear distant strains of R. Dean Taylor's 3rd UK hit they'll know why! 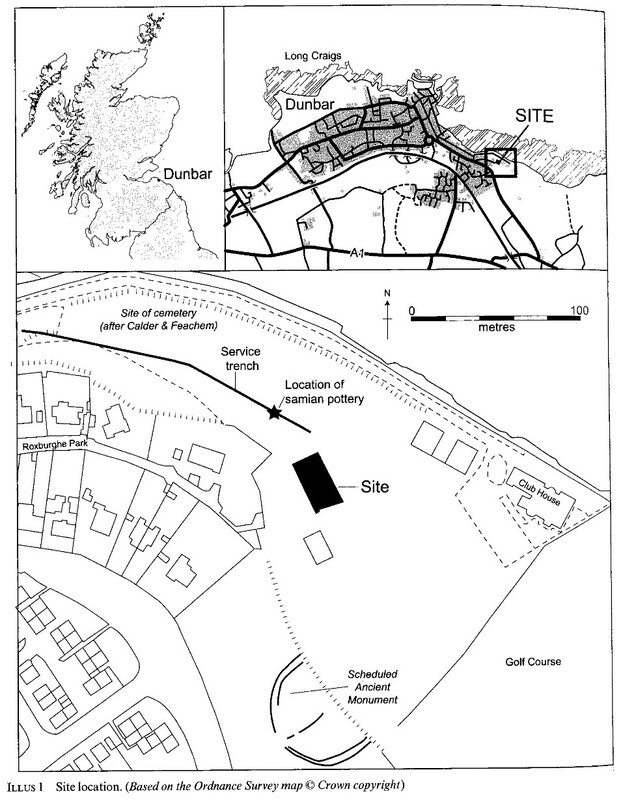 i) NE of Lochend Kennel's West of Damheid propinquitous to the railway line. 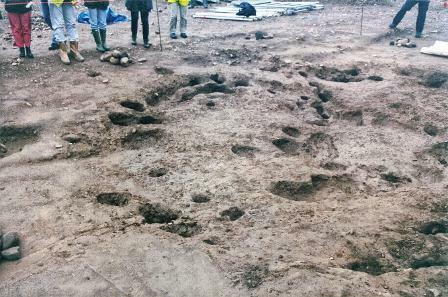 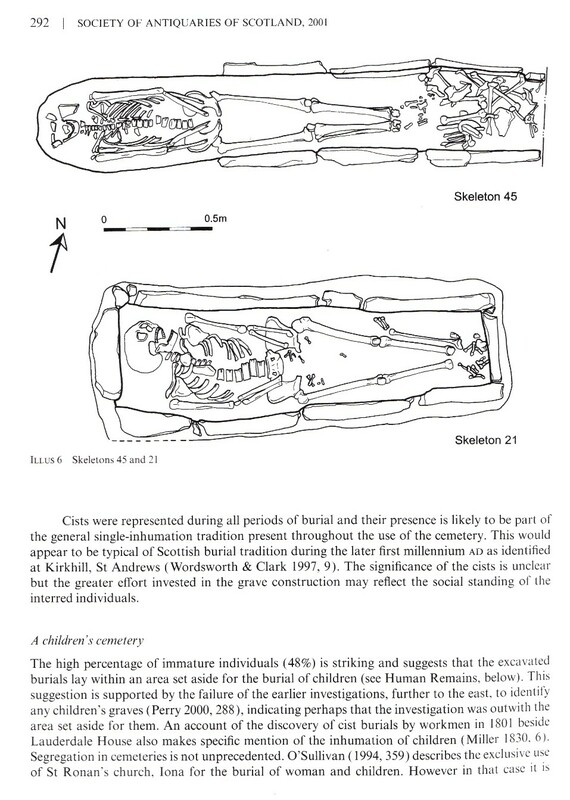 ii) Circa 400 metres South of Hallhill steading and the Anglian burial ground in Staneyholes & within 80 metres West of Lochend's boundary wall. 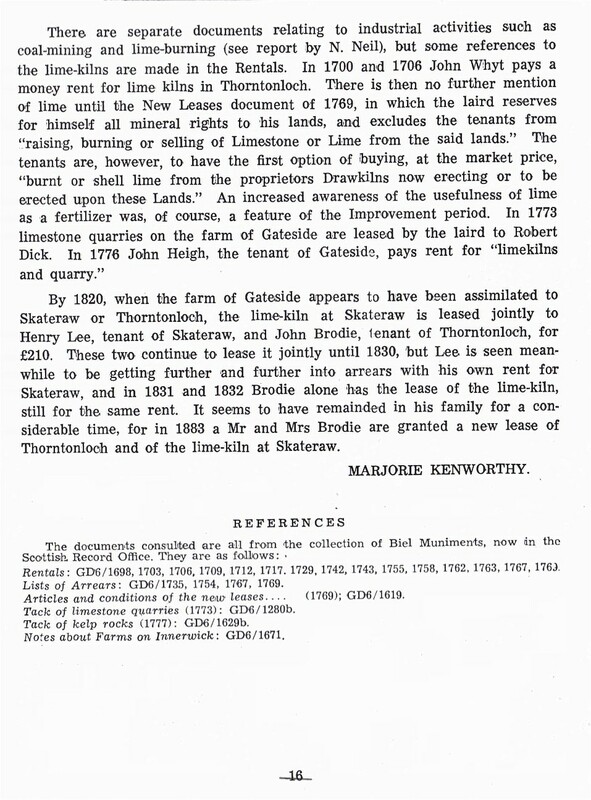 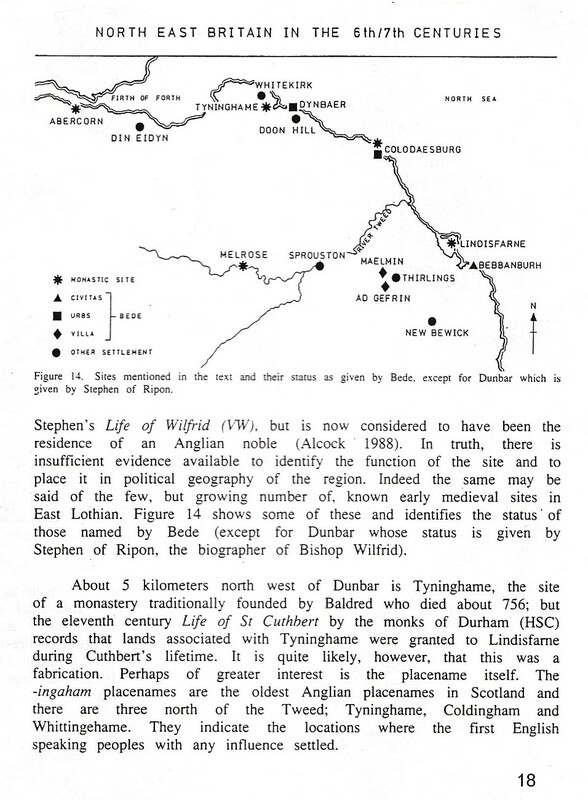 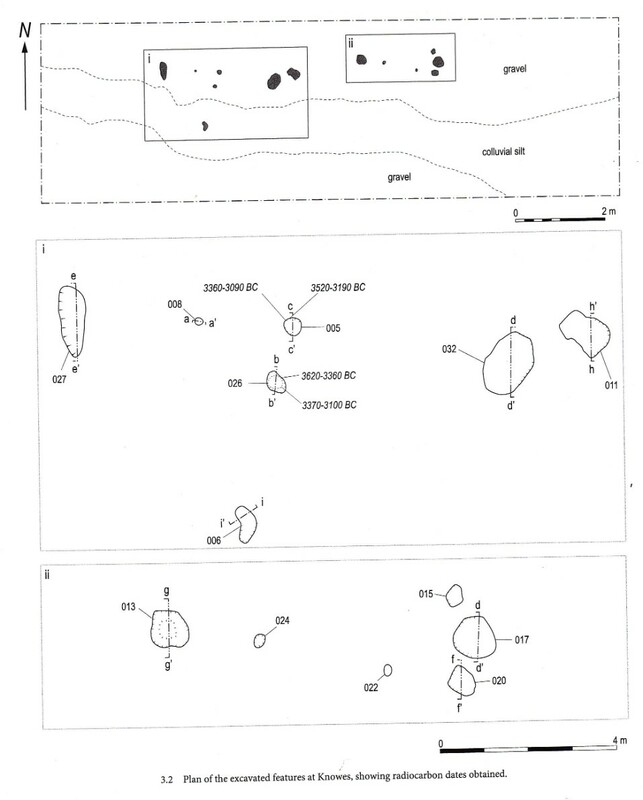 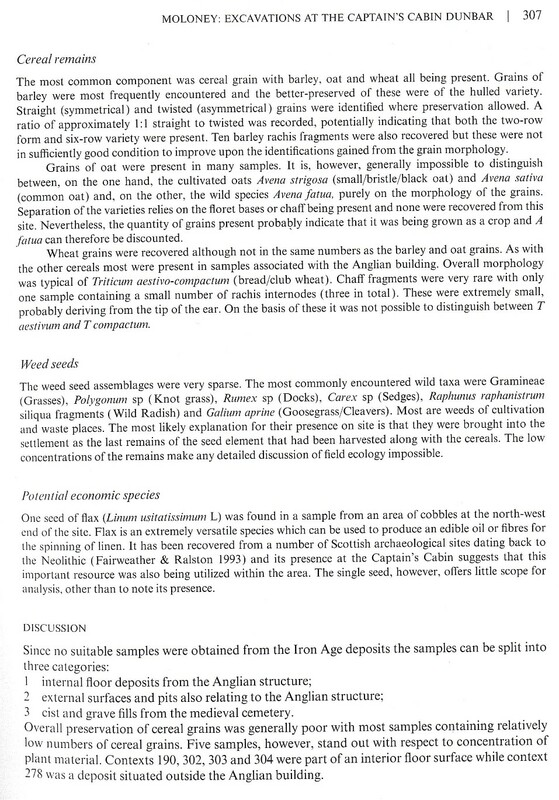 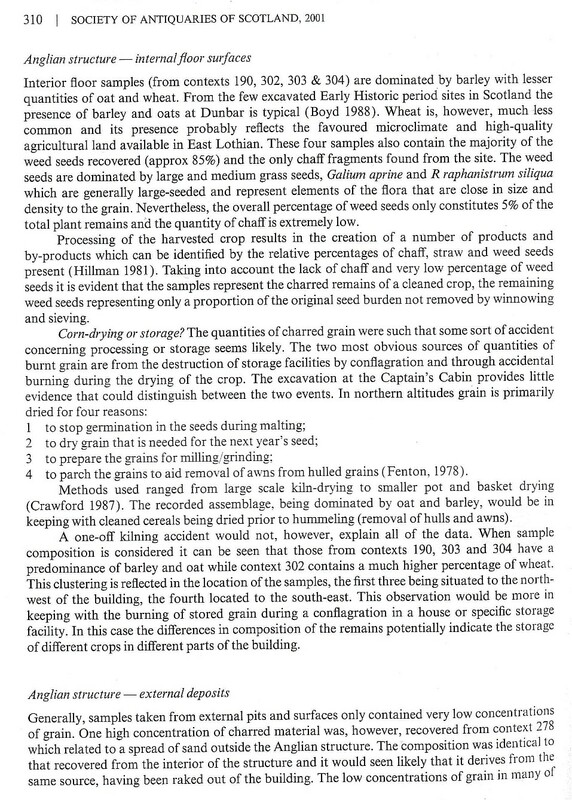 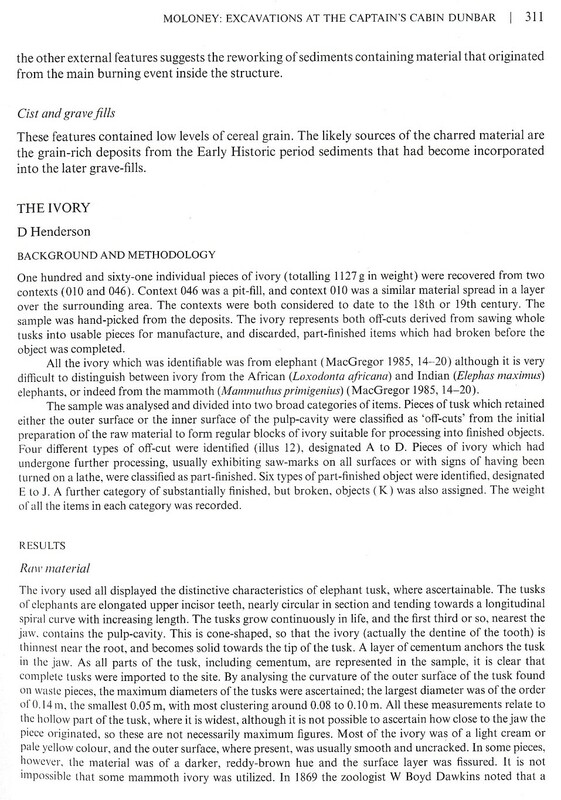 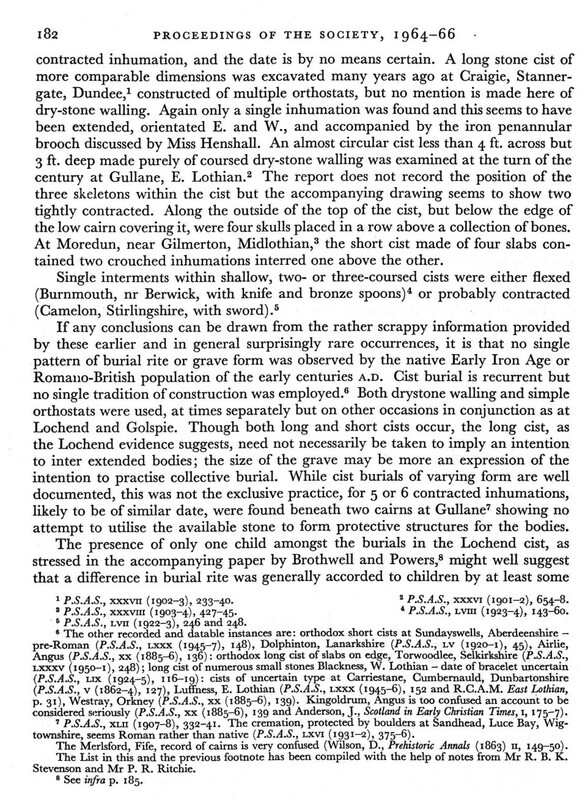 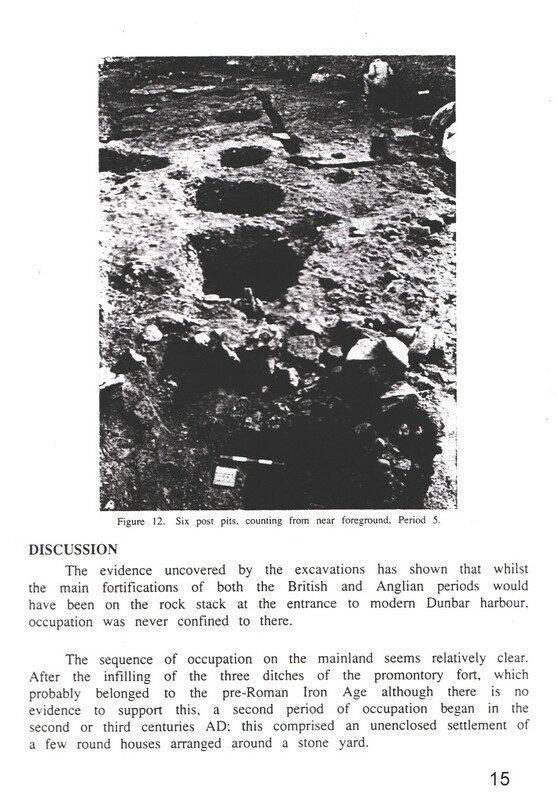 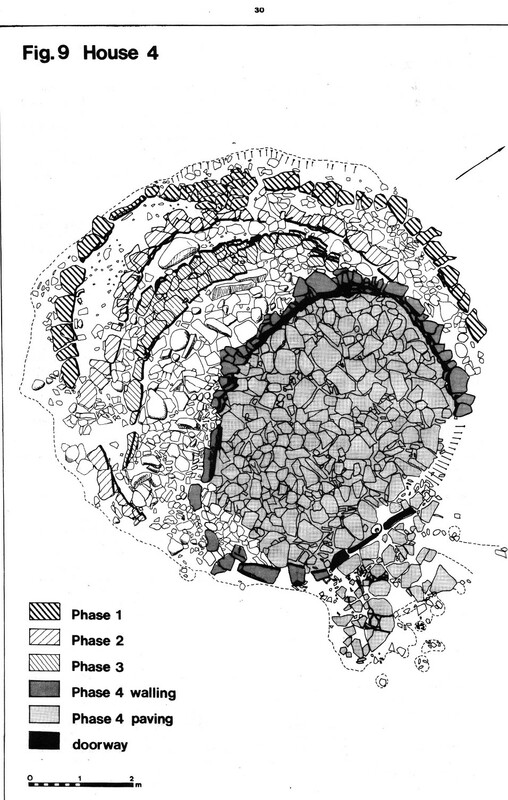 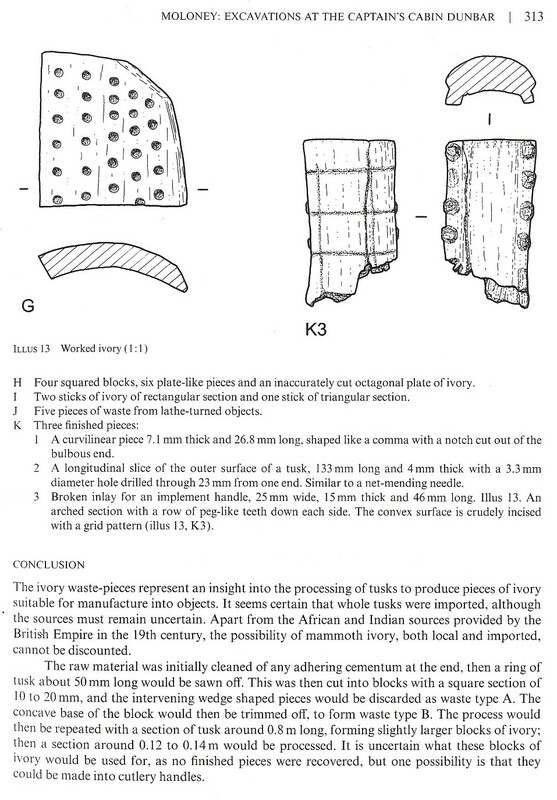 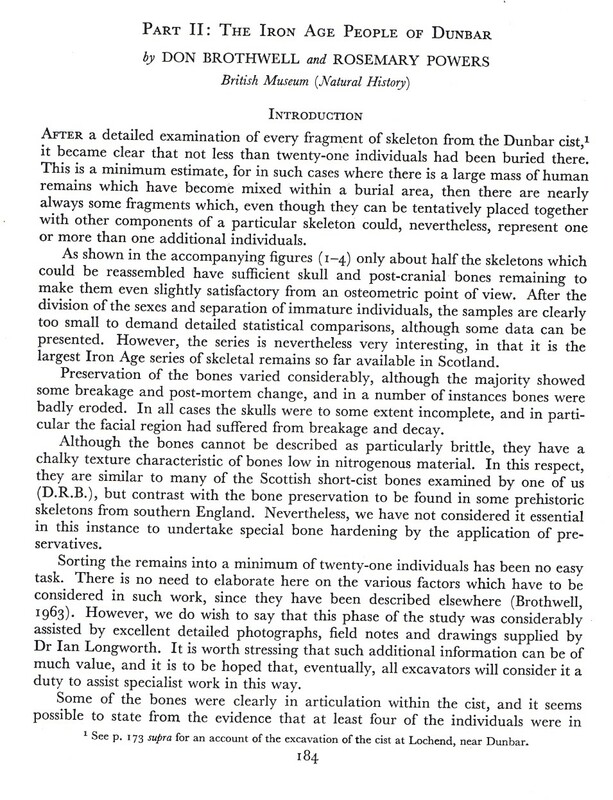 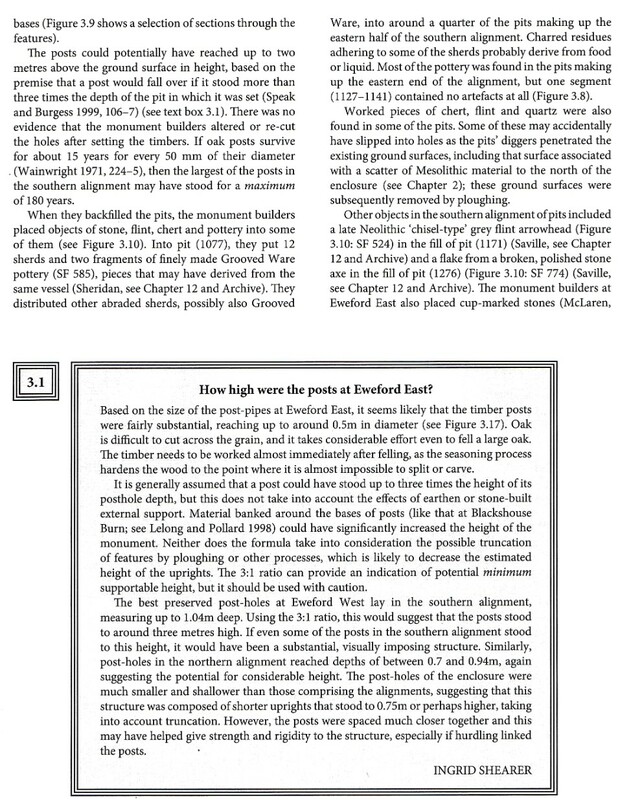 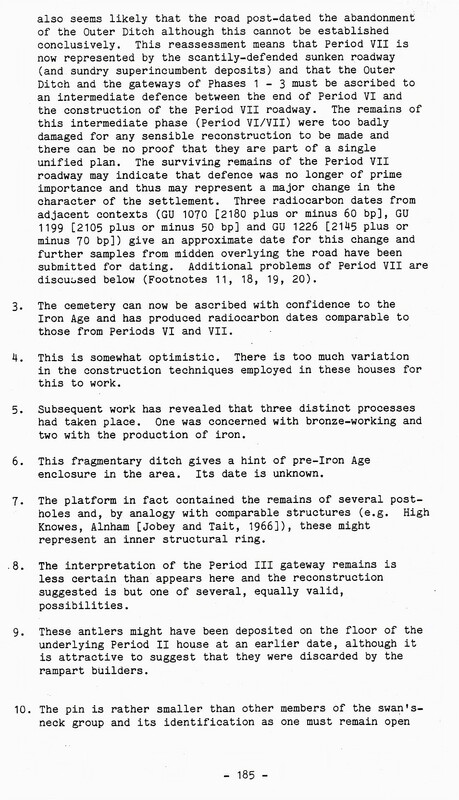 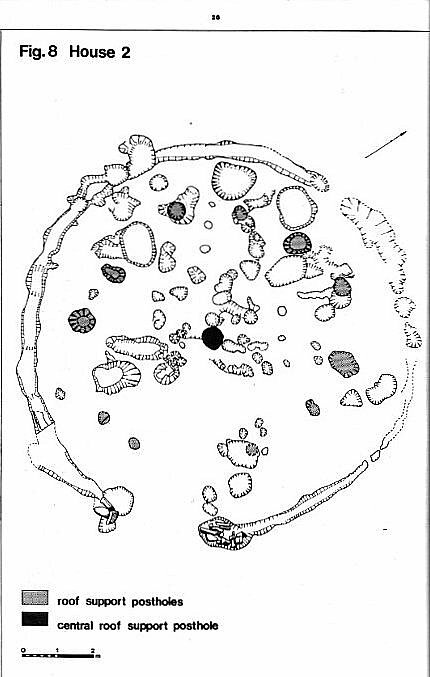 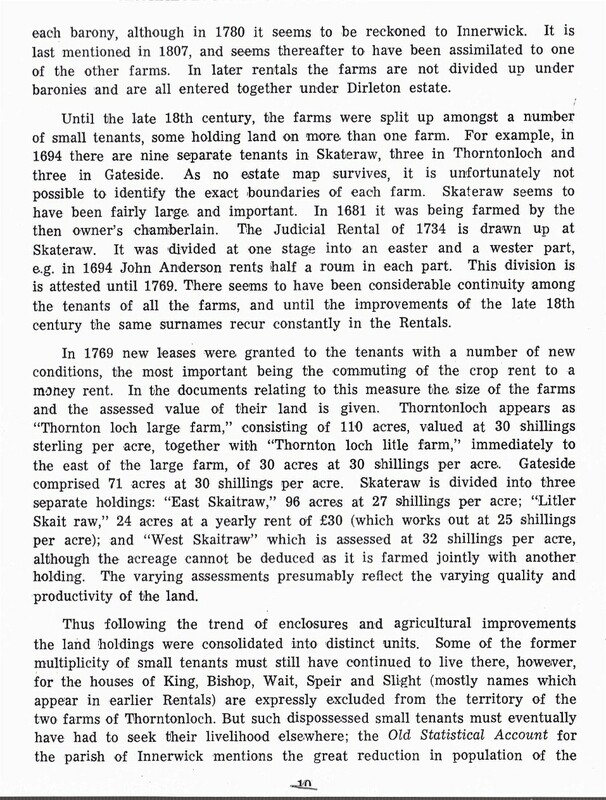 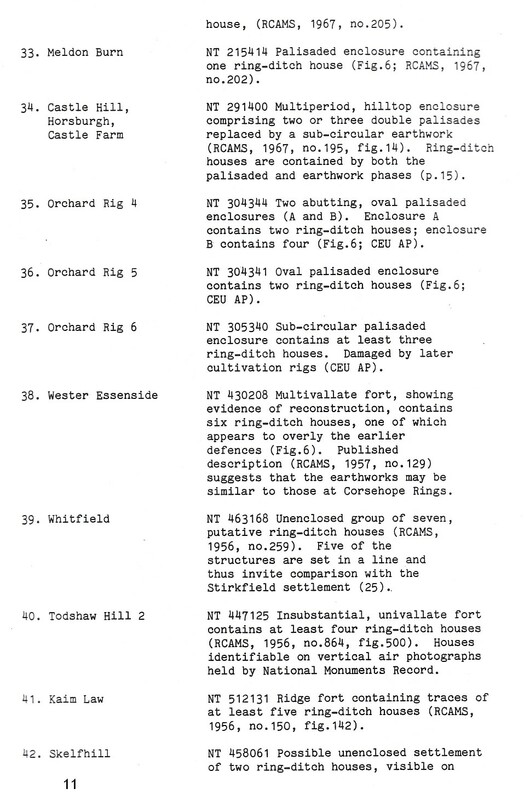 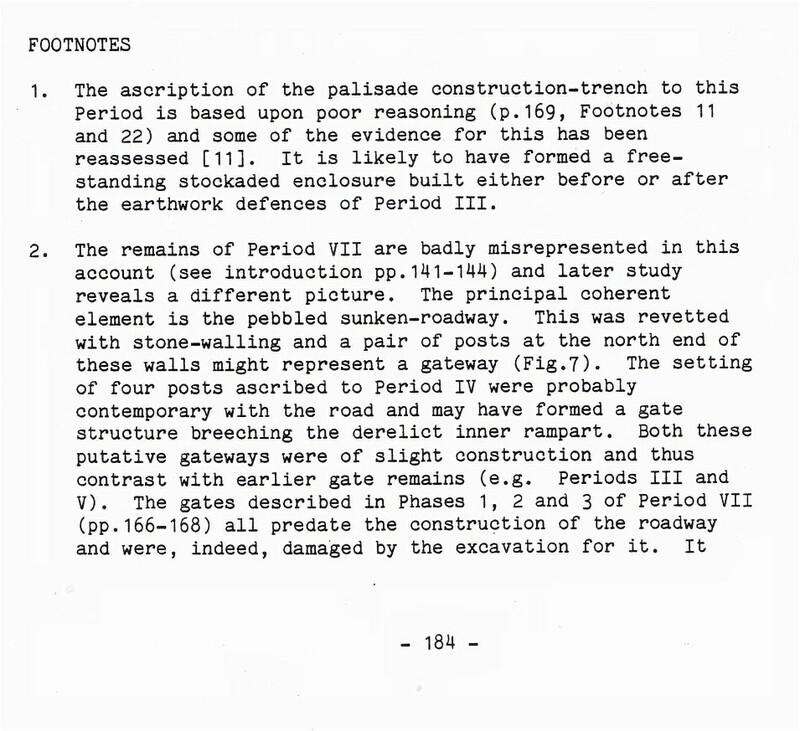 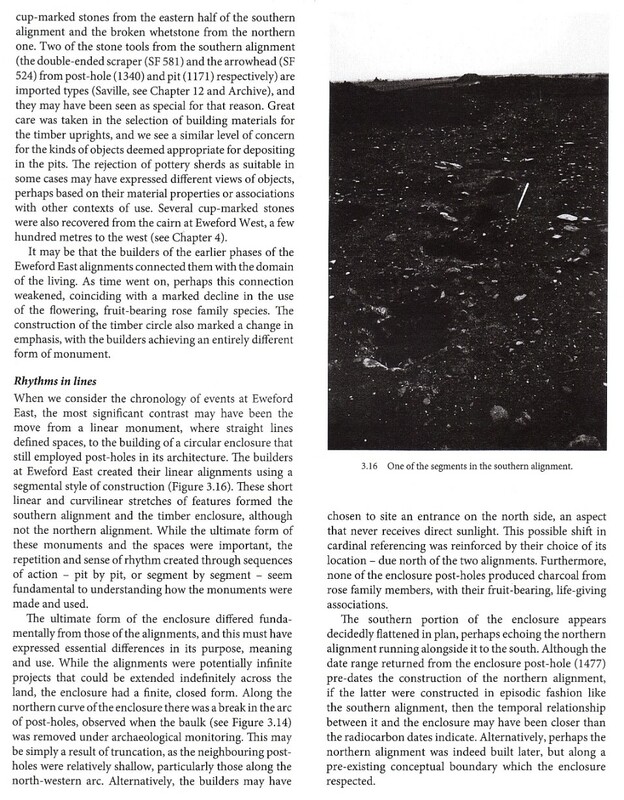 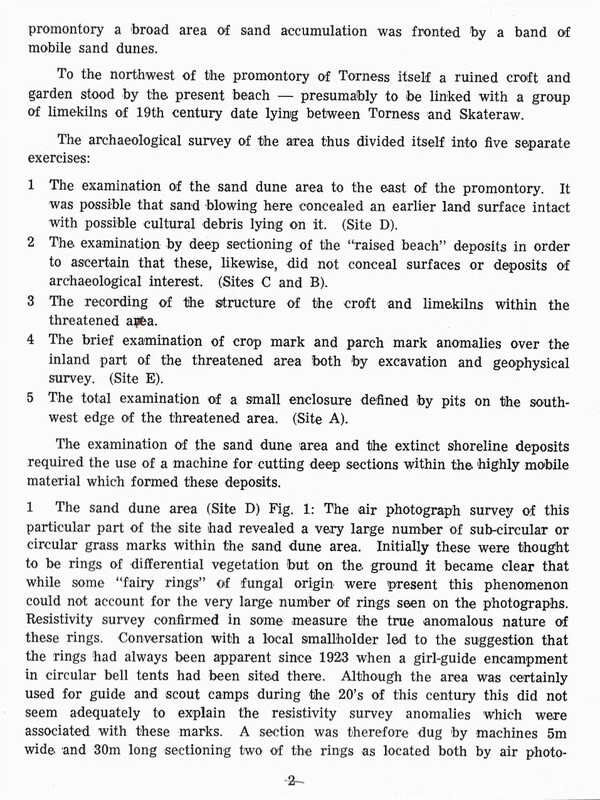 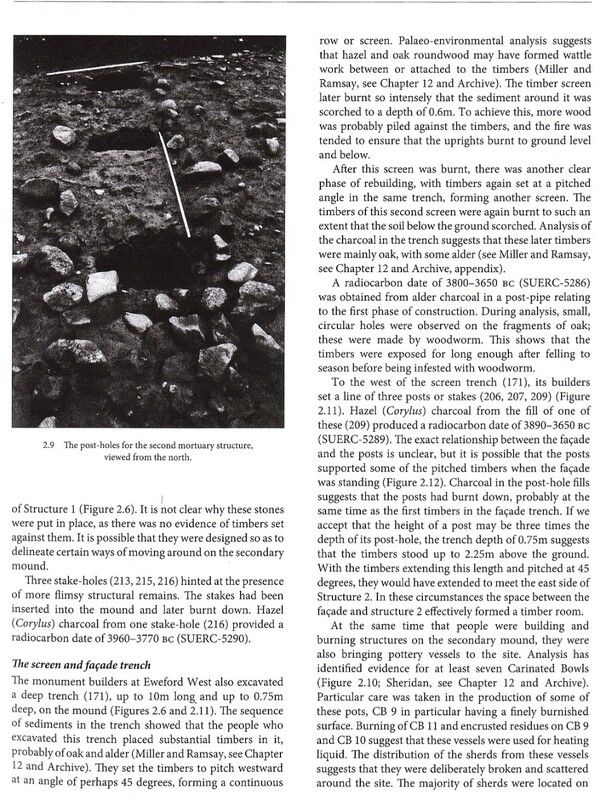 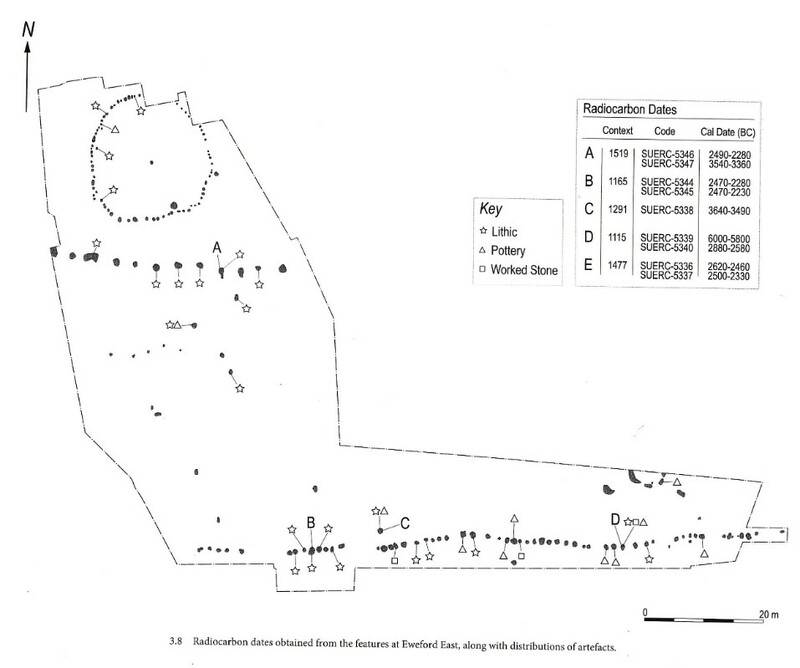 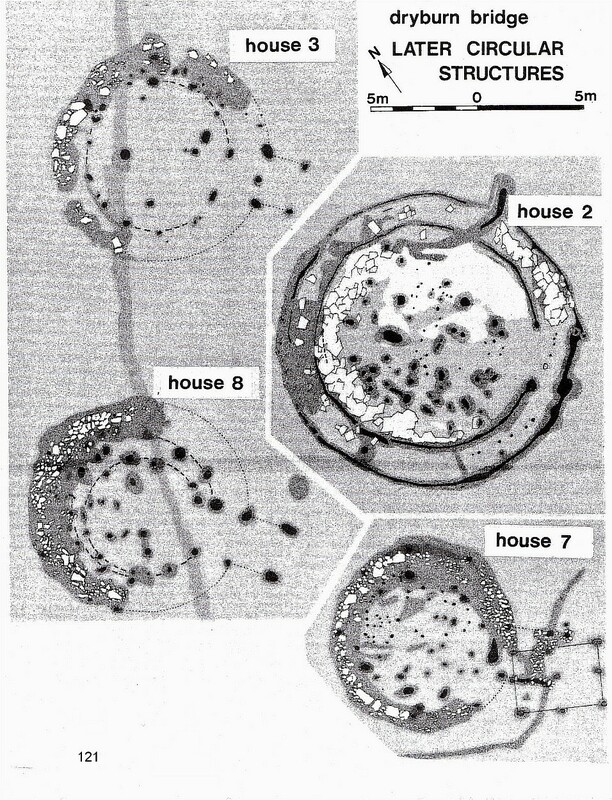 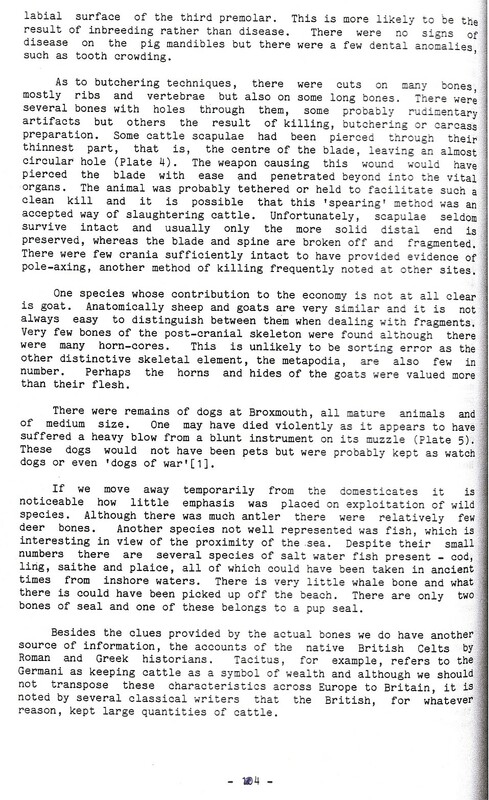 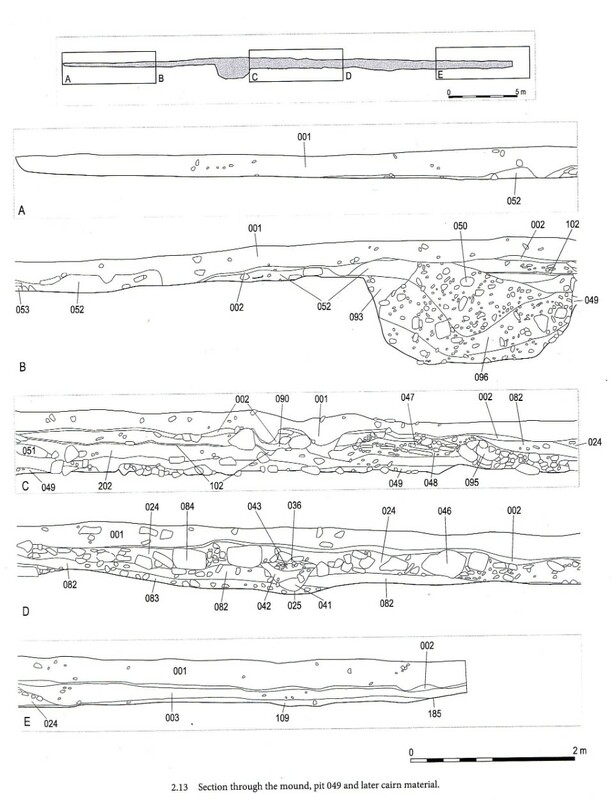 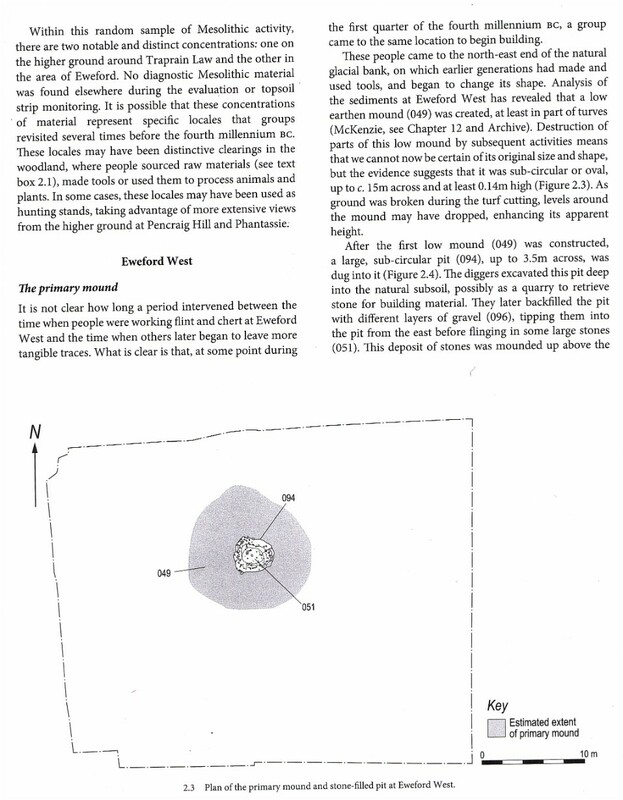 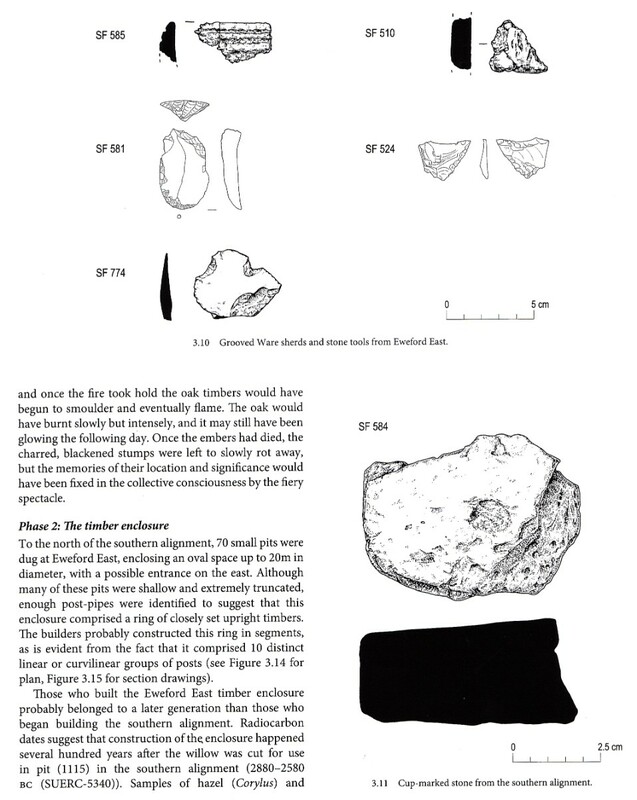 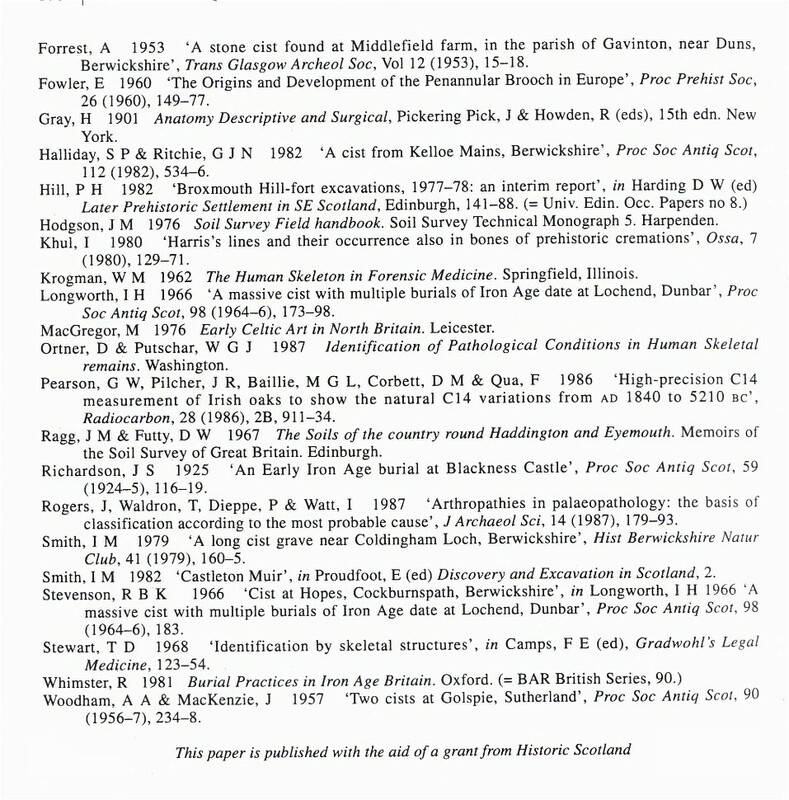 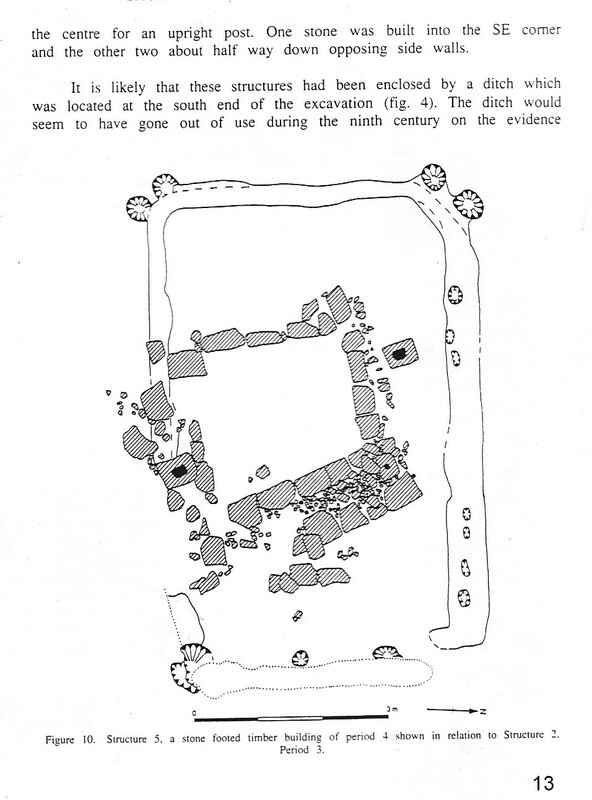 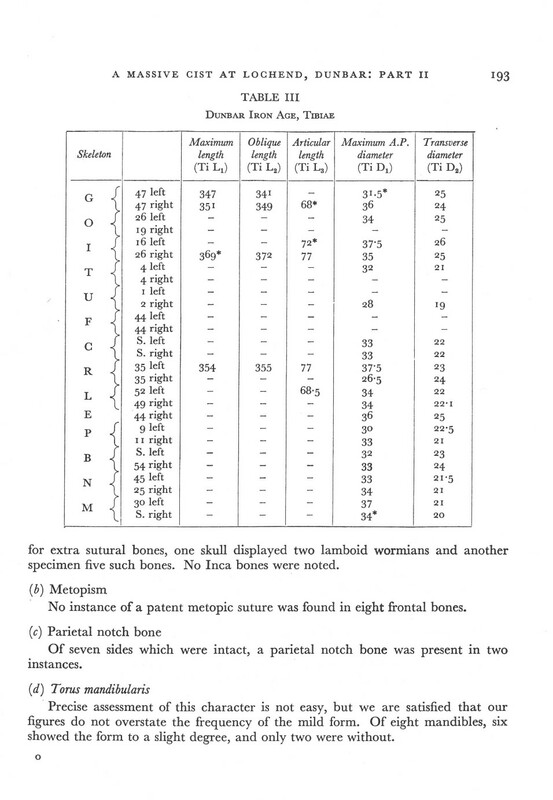 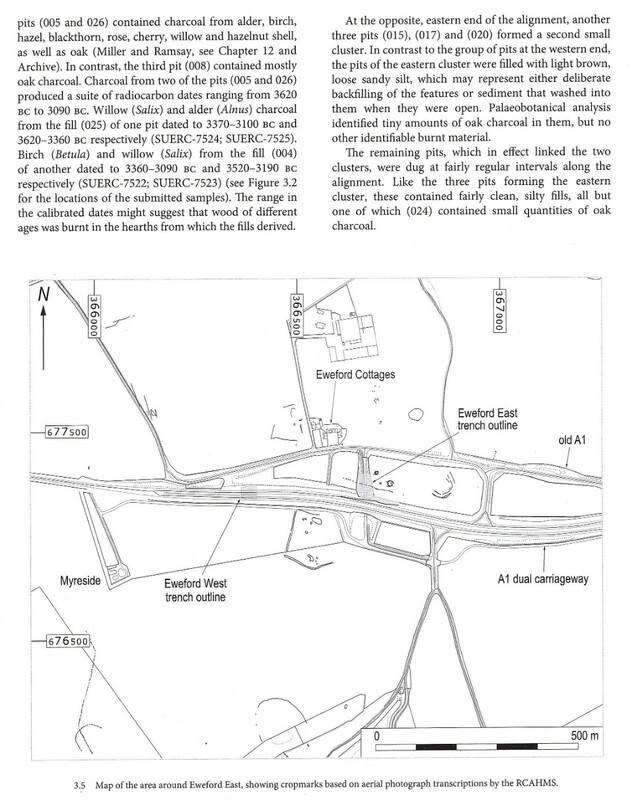 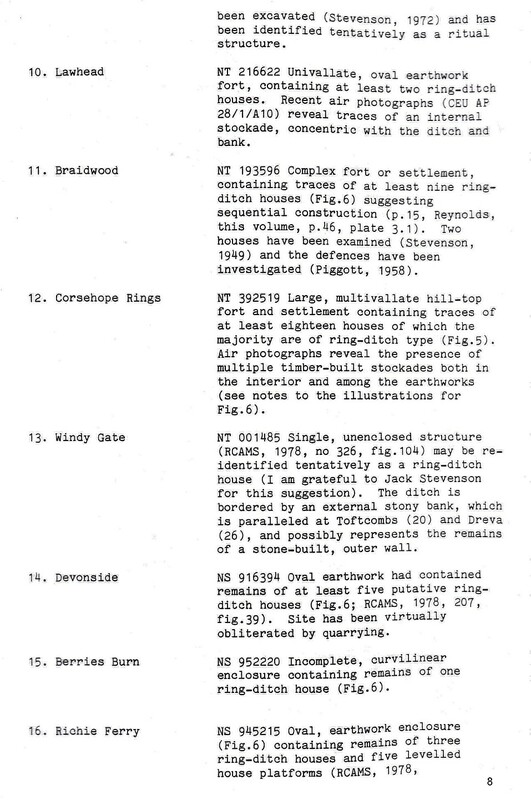 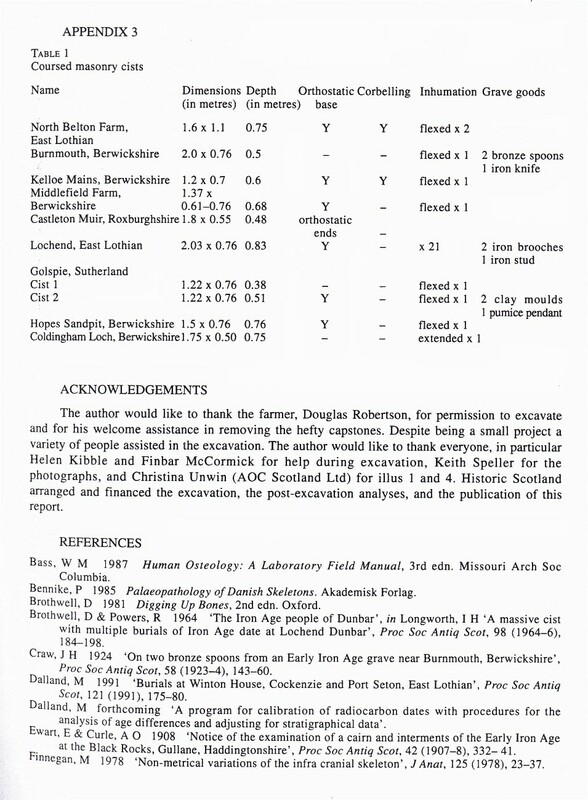 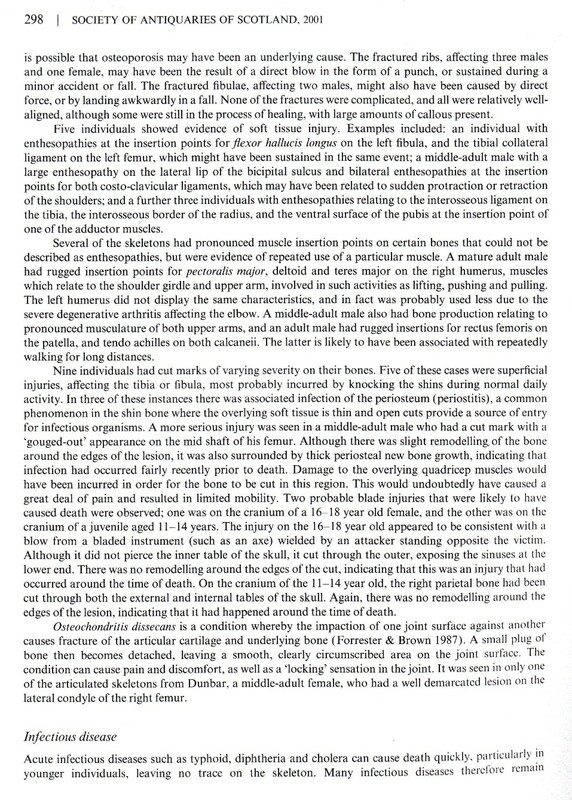 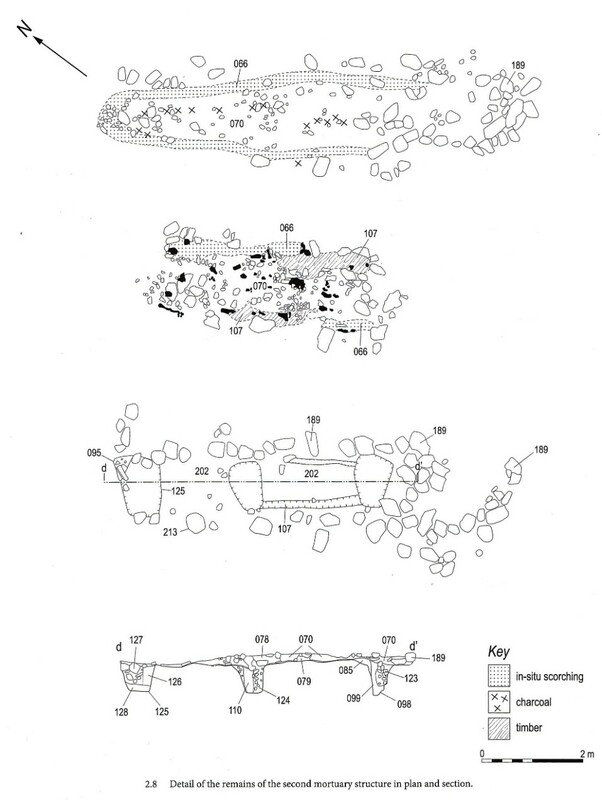 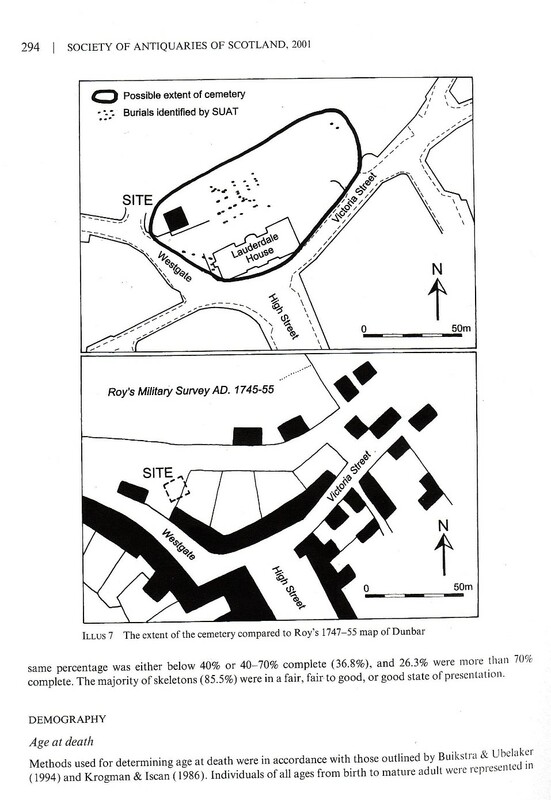 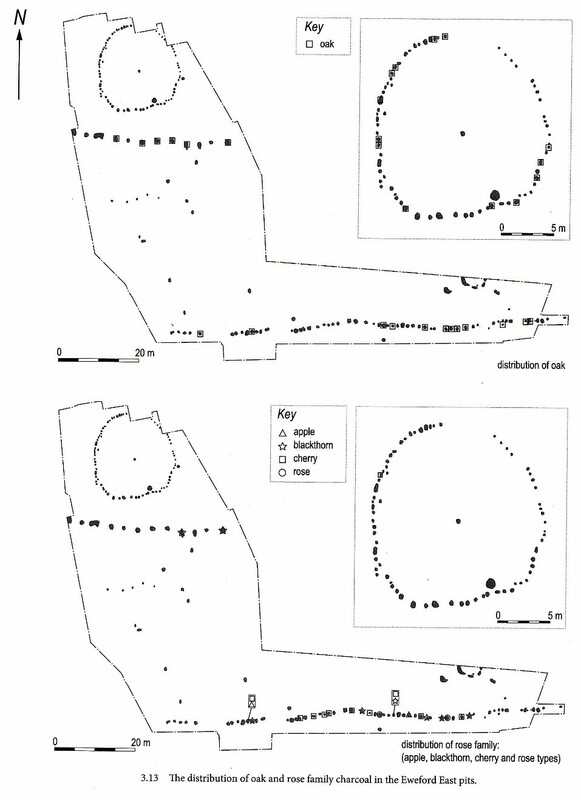 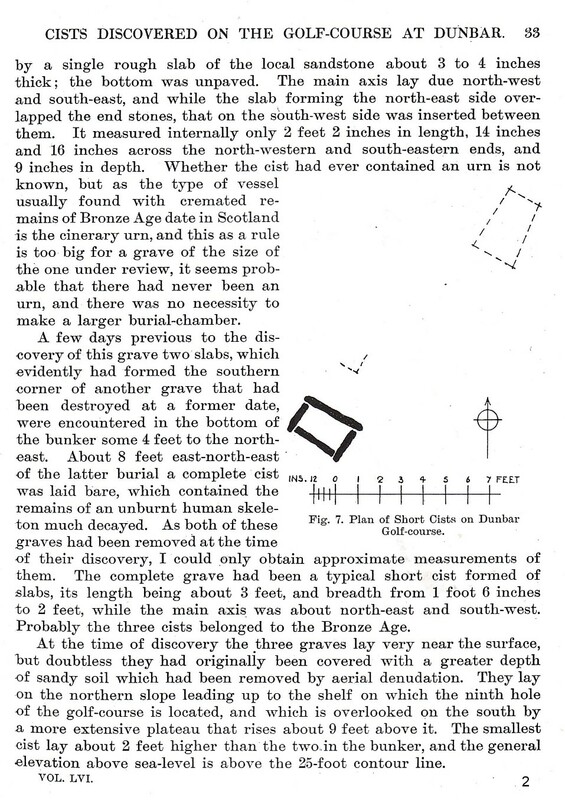 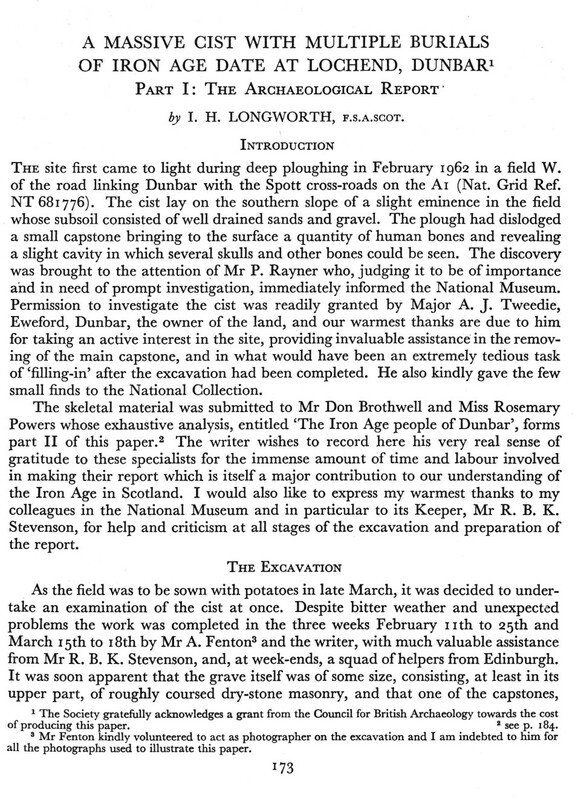 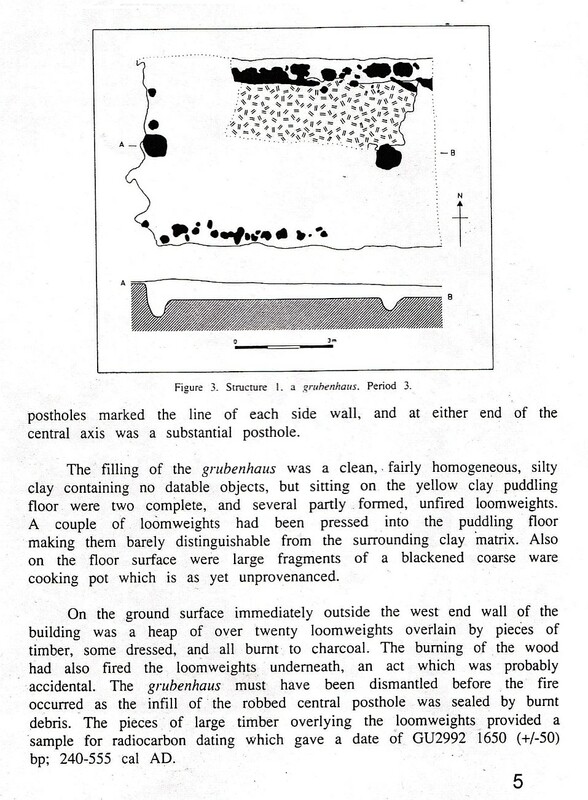 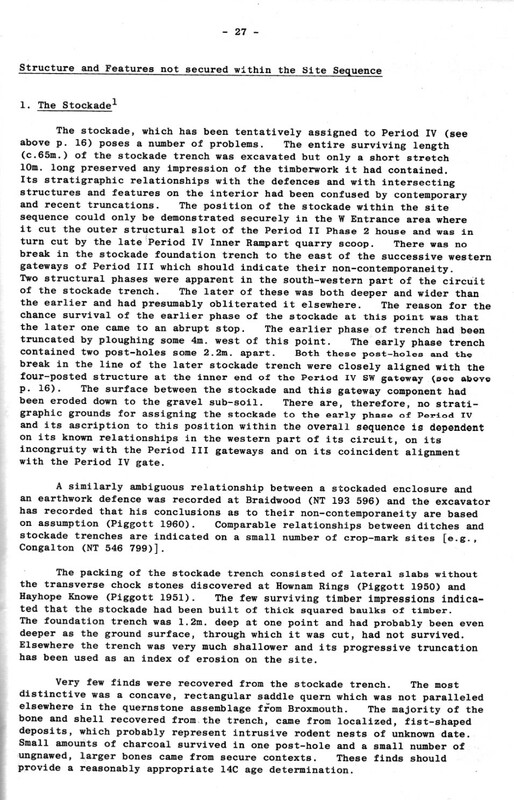 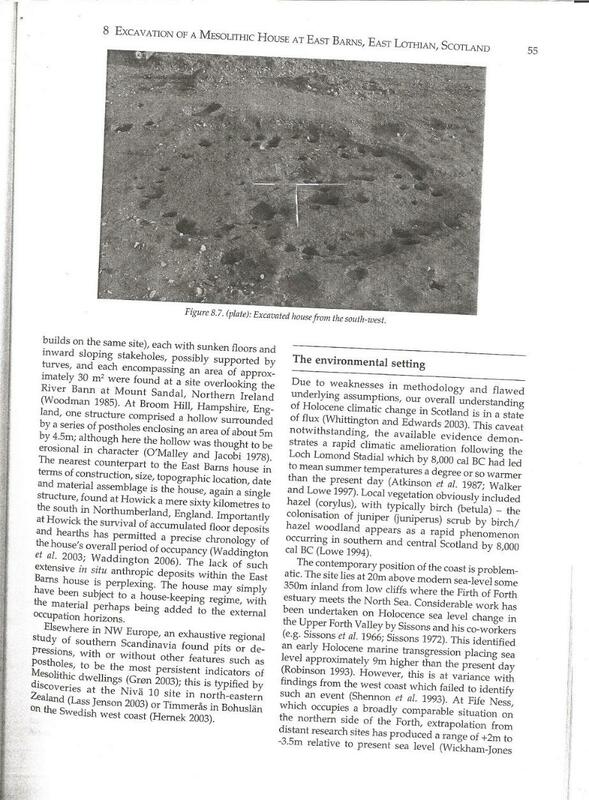 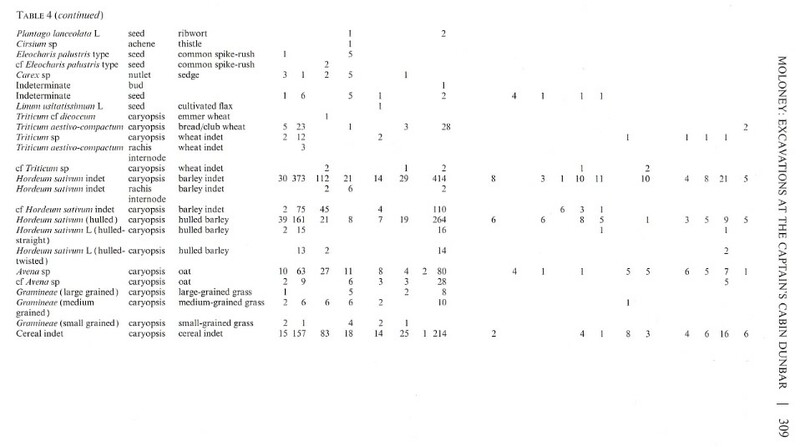 iii) Sundry recorded ( & unrecorded ) sites close to Eweford. 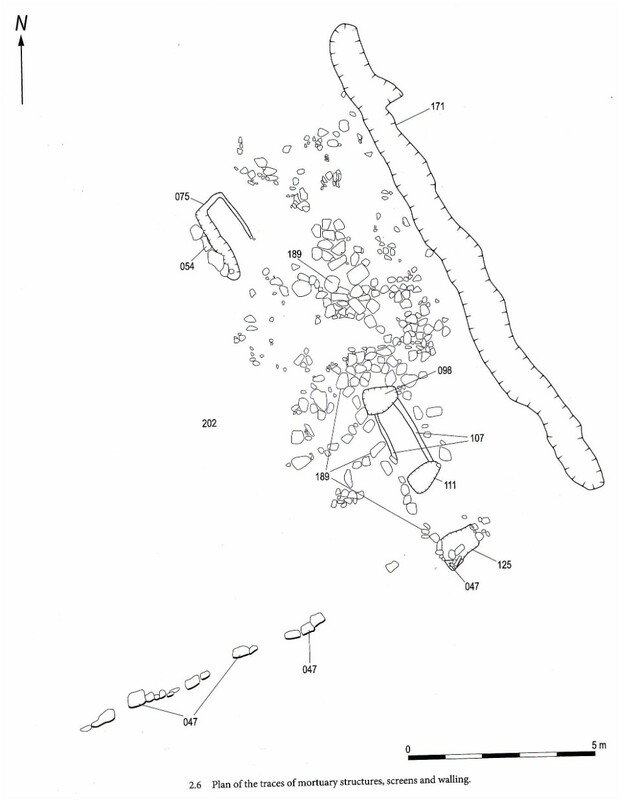 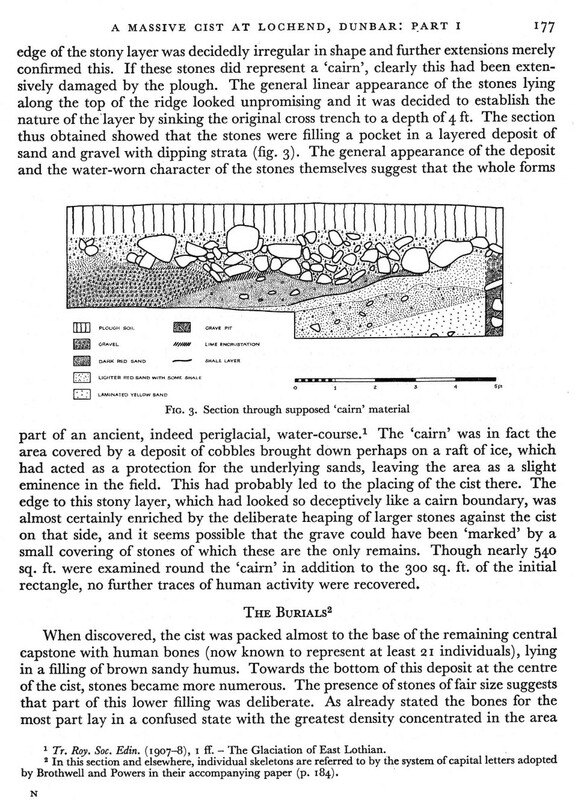 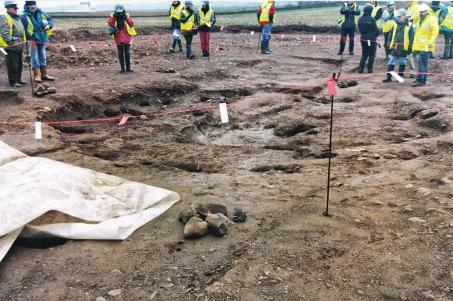 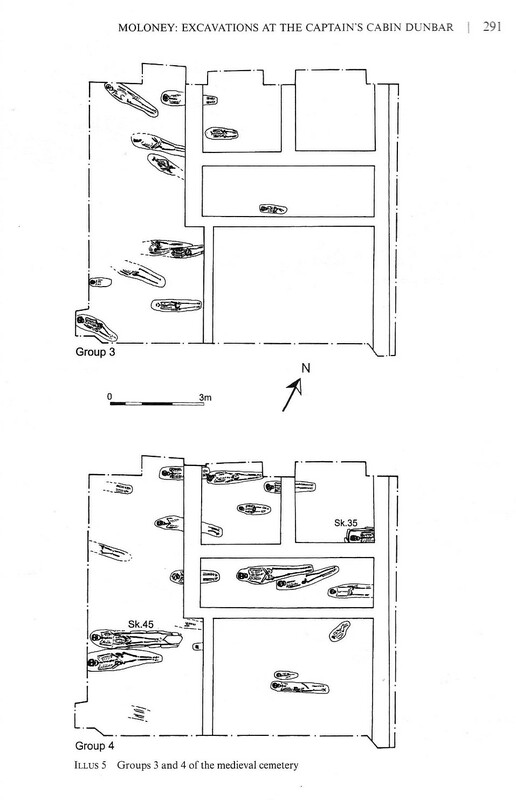 Nothing so far East of the Spott road-the As(sociated) Da(iries)site excavation drew a blank. 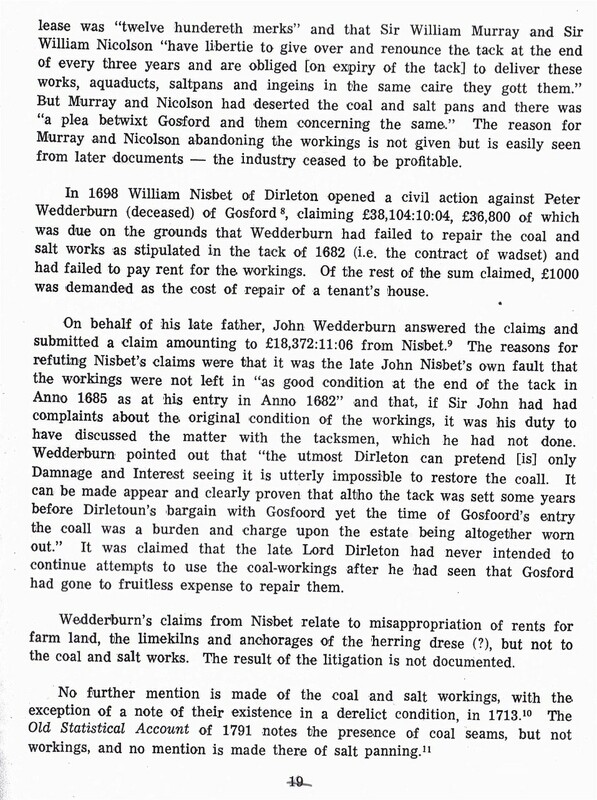 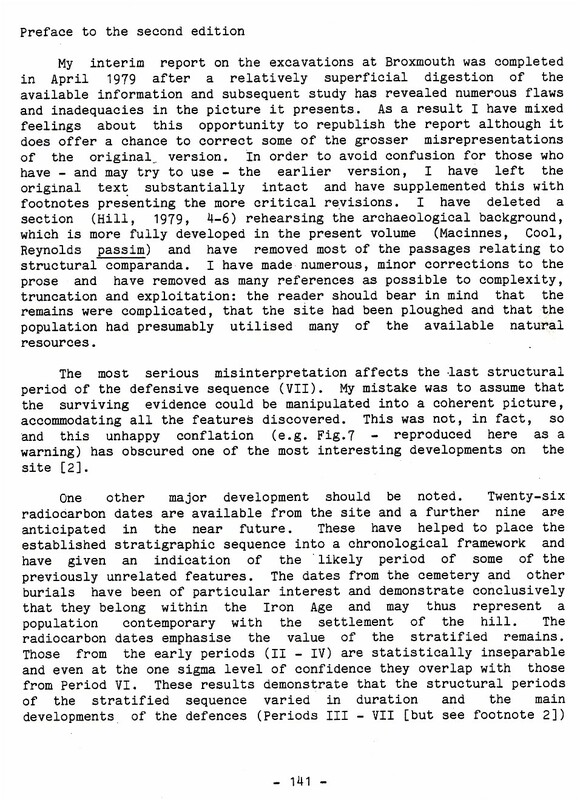 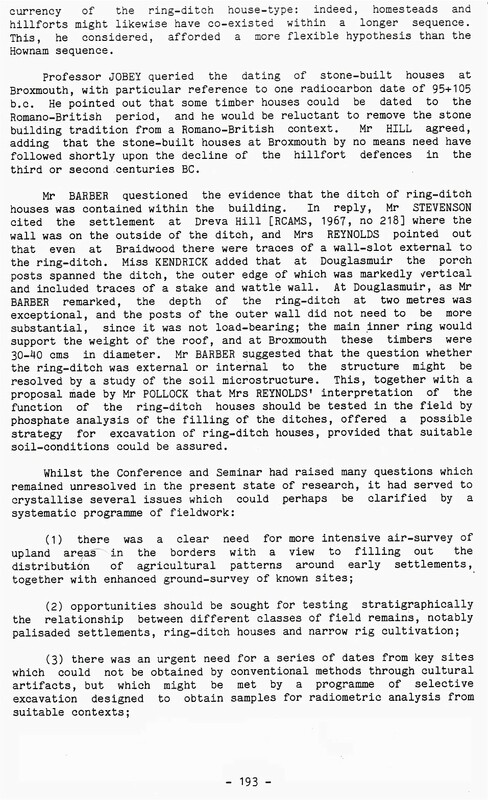 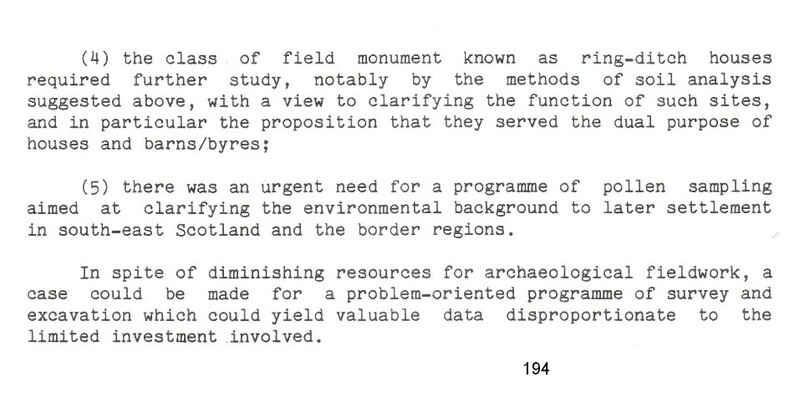 However pressure by farmers,in the dim and distant past & present day developers dictated it was better not to disclose any unearthed remains as this would be an hindrance to production. 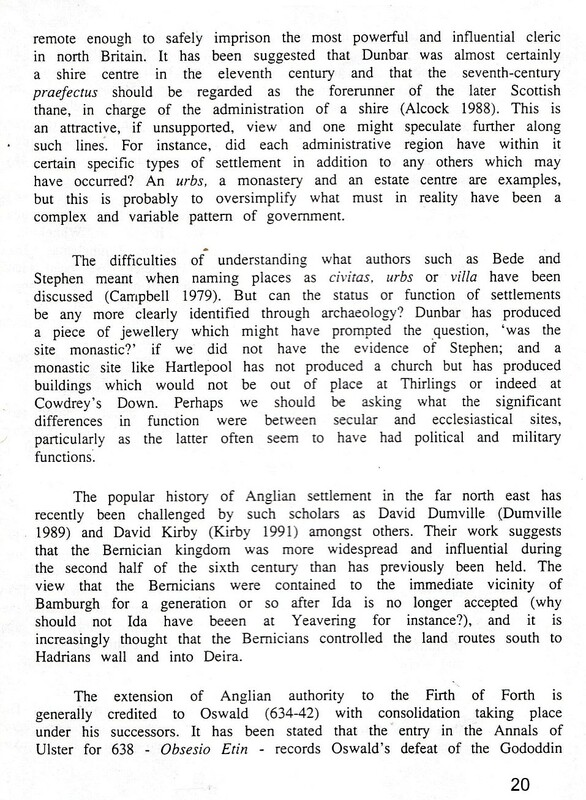 One might postulated that ancient settlers lives, deaths, cultural ideals and atavistic influences might govern their longings' to being close to their Great Loch. 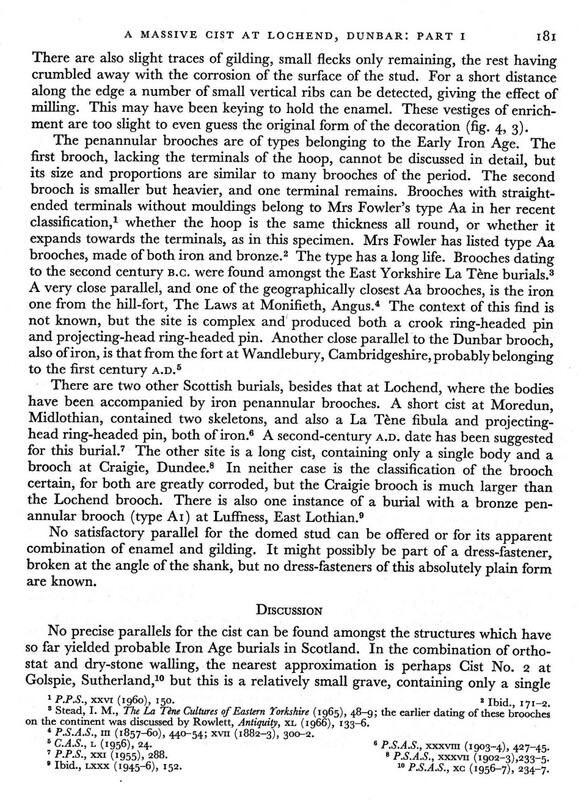 This loch stretched to an area of half a square mile in an area governed by today's 20 foot contour. 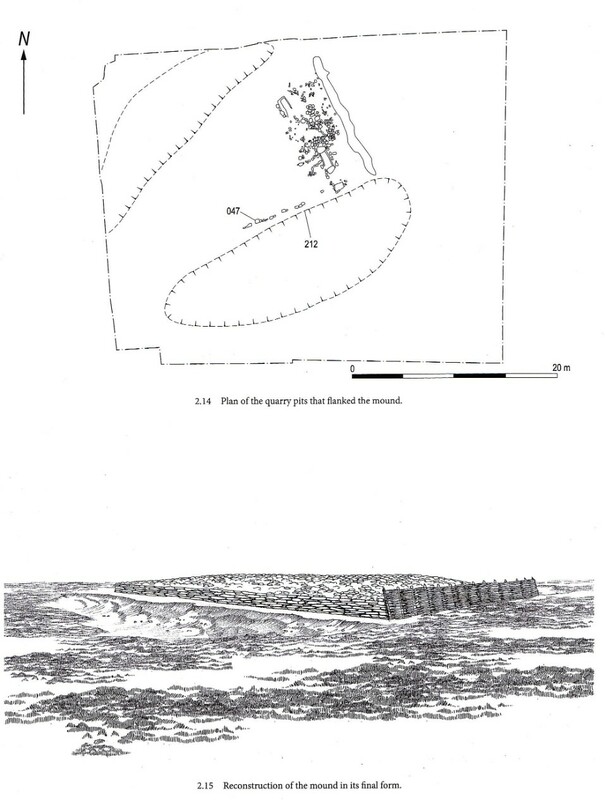 Our new windswept Hallhill Primary school would, if built 2 millennia ago would be near the centre of this expanse of water and submerged within. 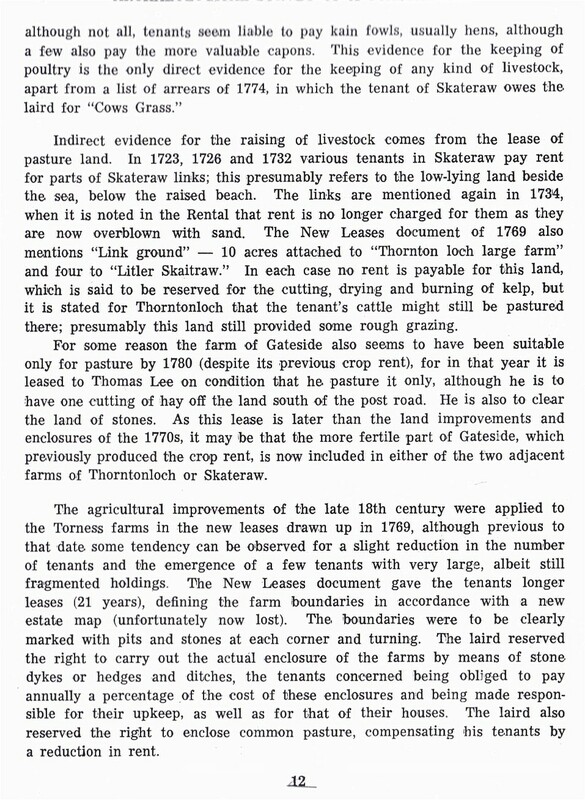 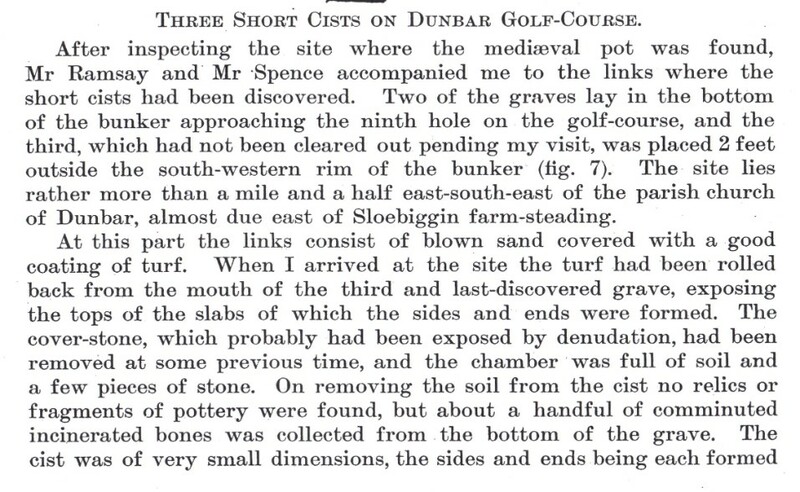 Recently some confusion has arisen apropos the area to the South, just outside the perimeter of the golf course, in the Deer Park on ground for which Dunbar golf club reputedly paid £1.2 million for. 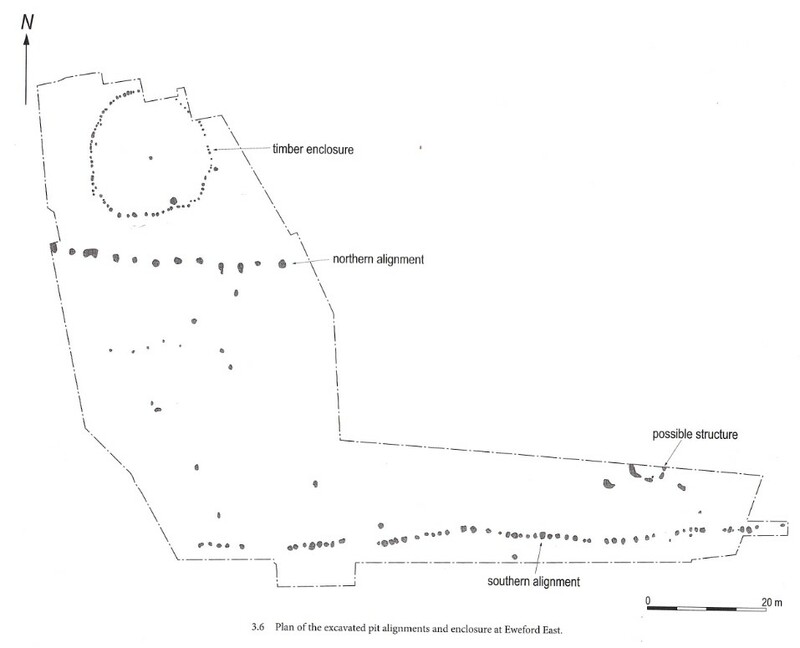 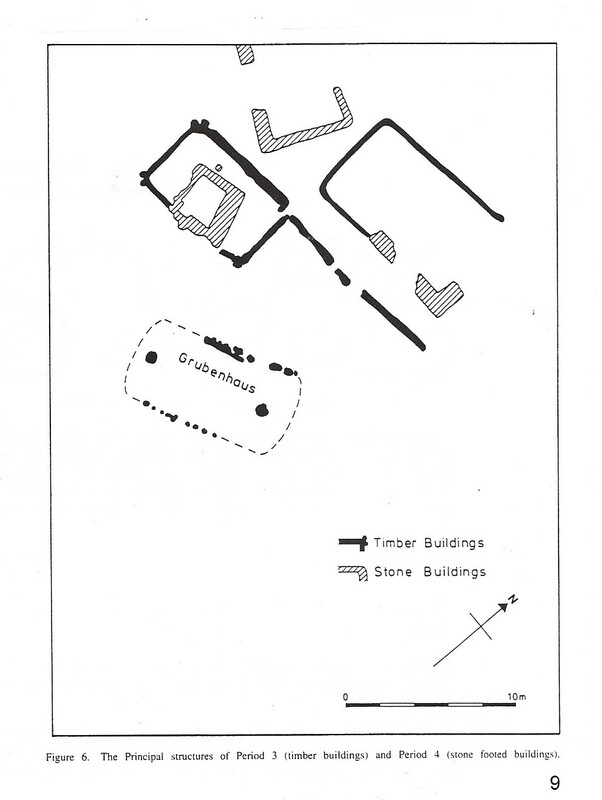 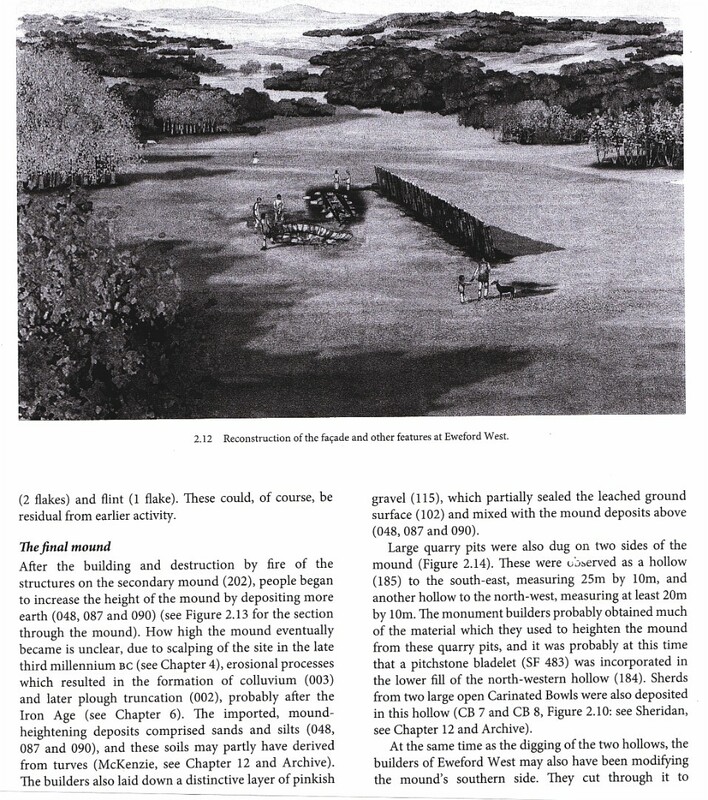 The area was classed as "as scheduled ancient monument" not* Samoya Monument because the aerial photographs indicated crop-marks and the possibility of a bronze age defended settlement. 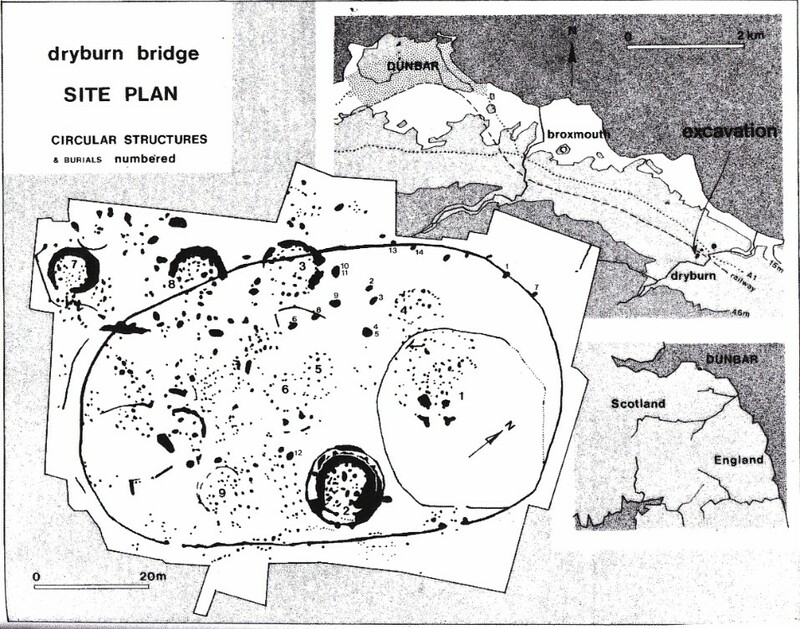 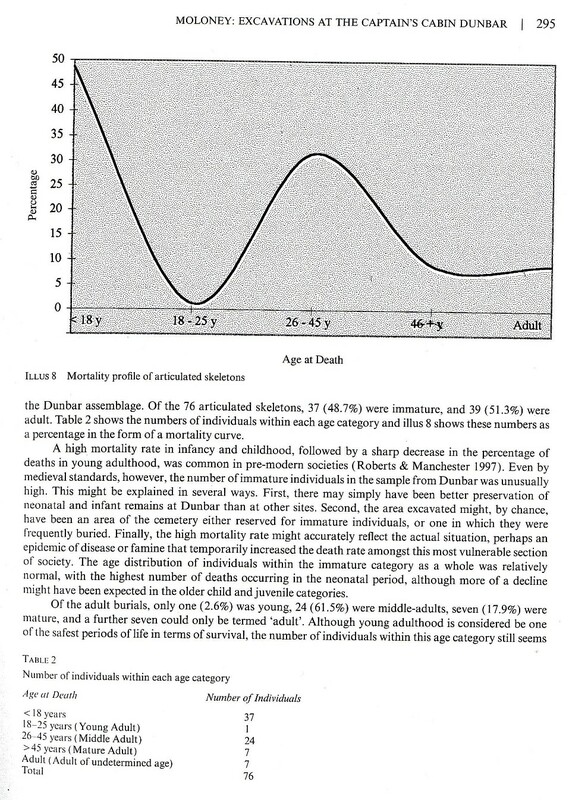 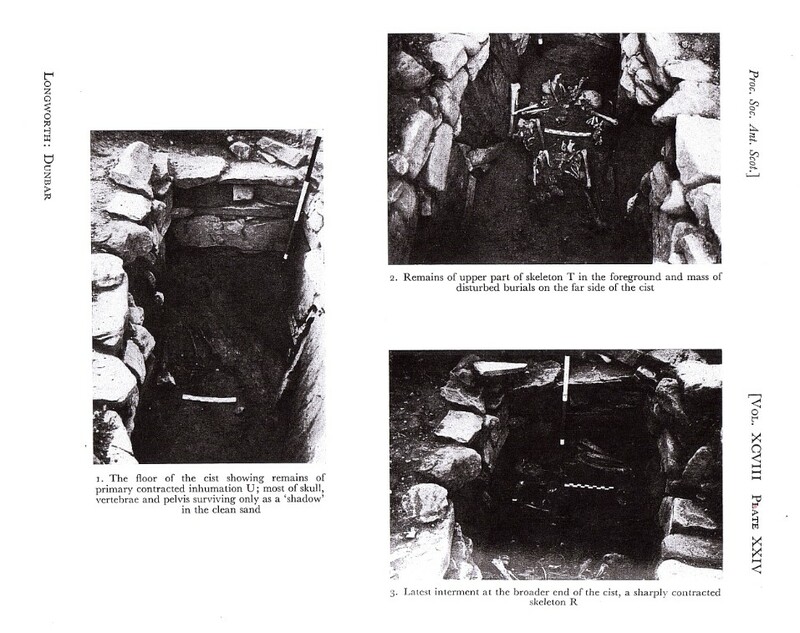 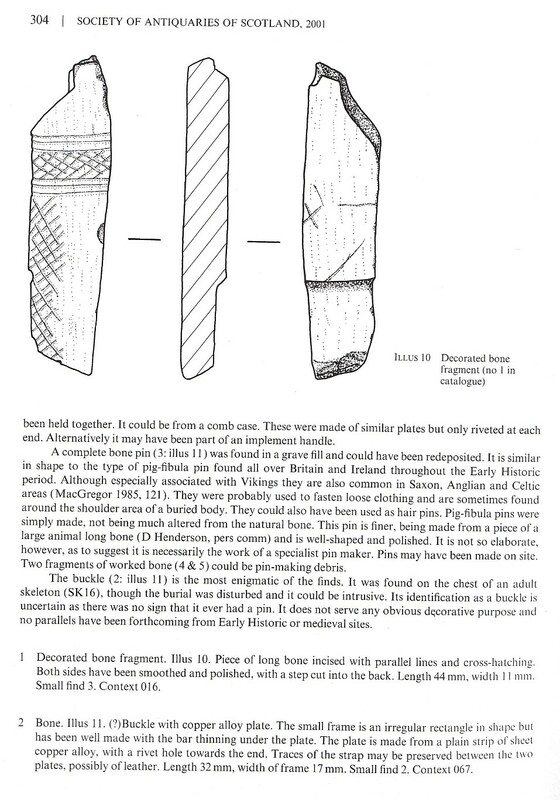 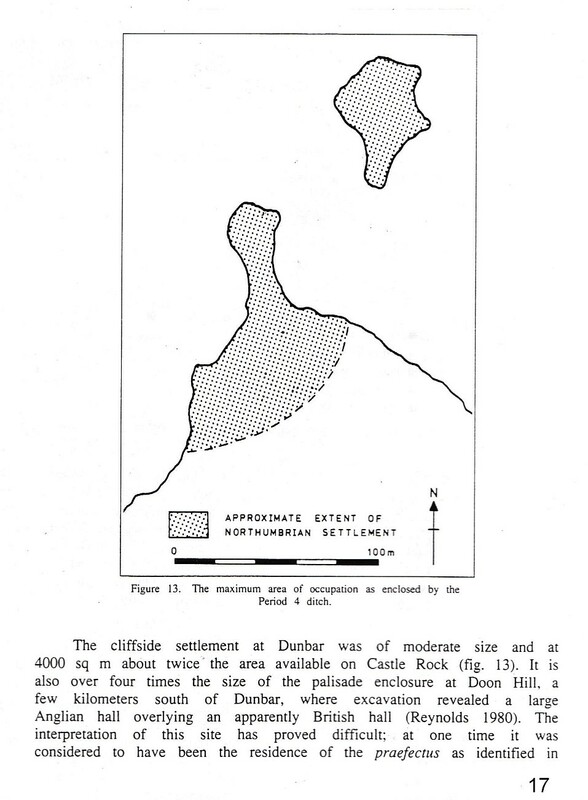 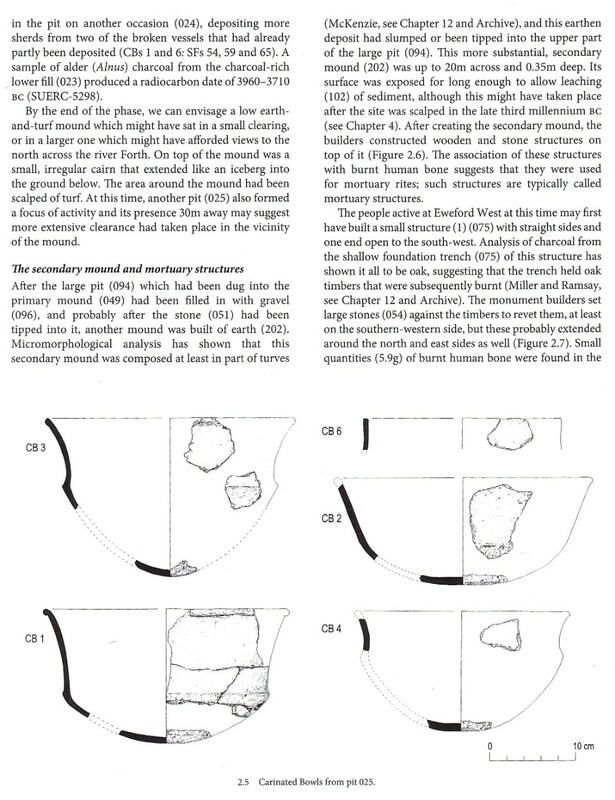 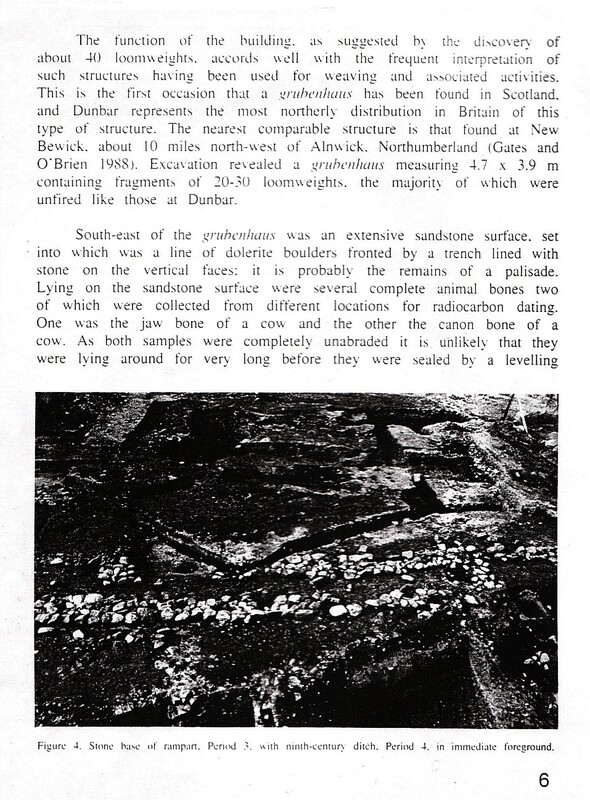 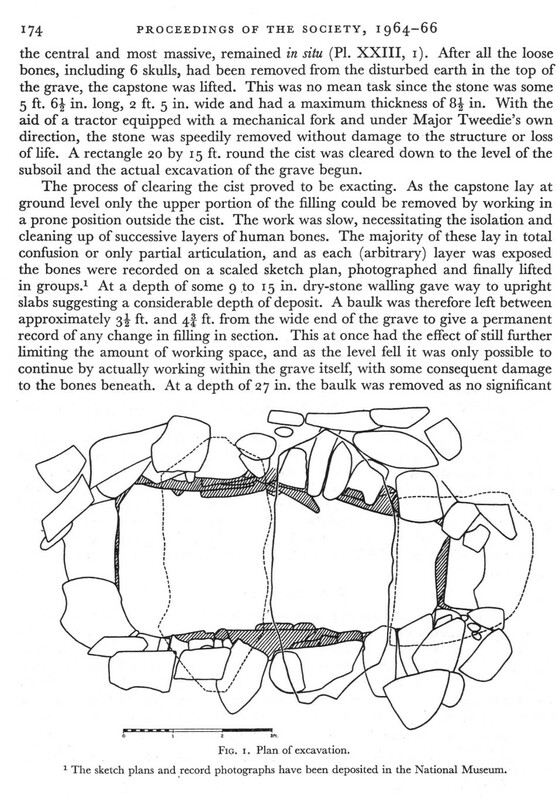 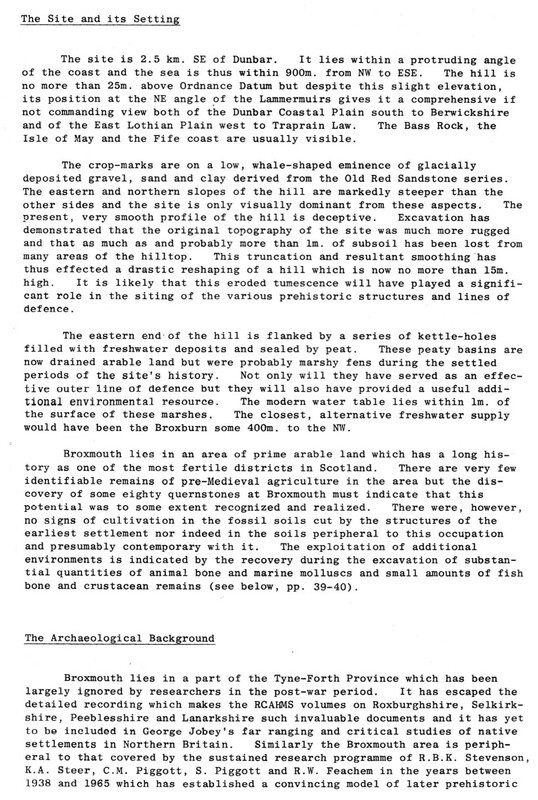 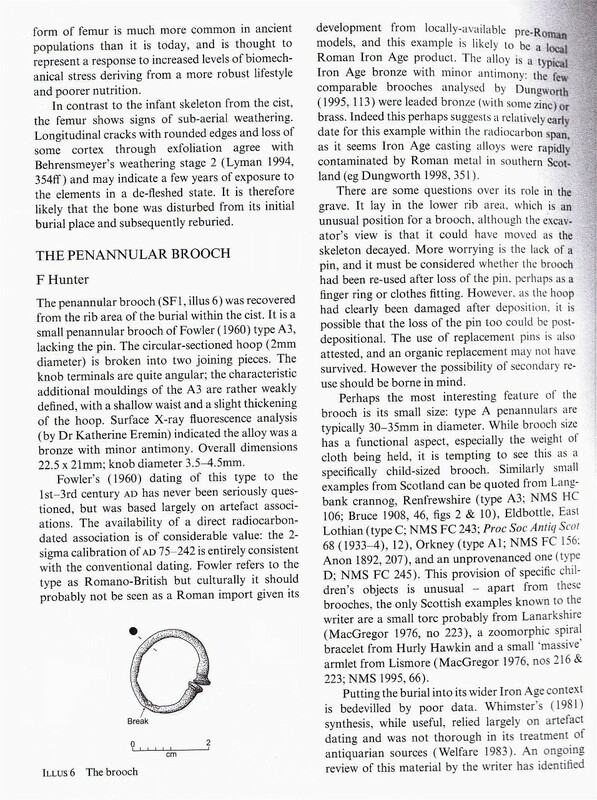 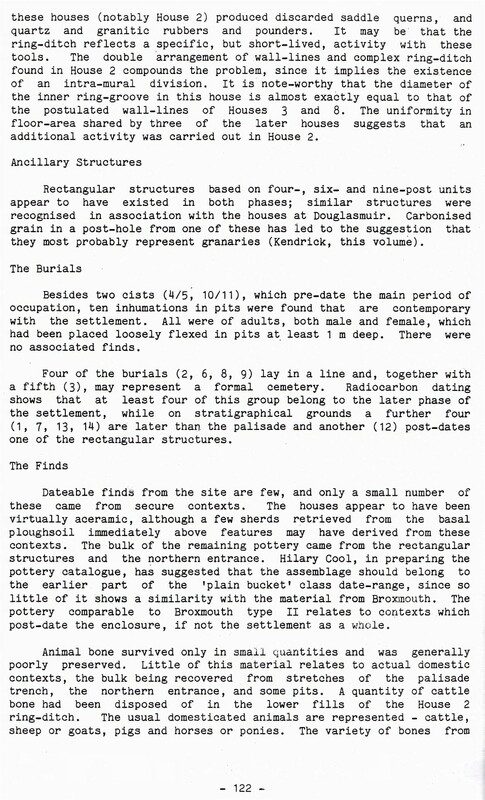 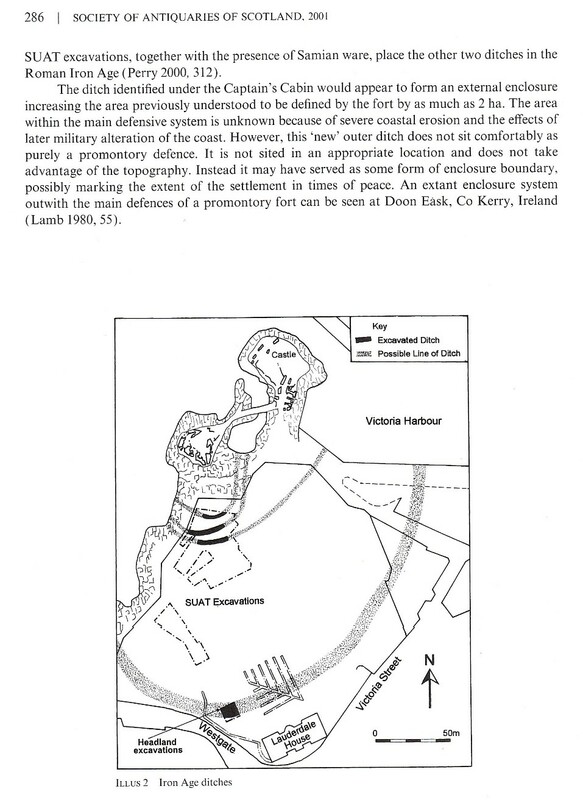 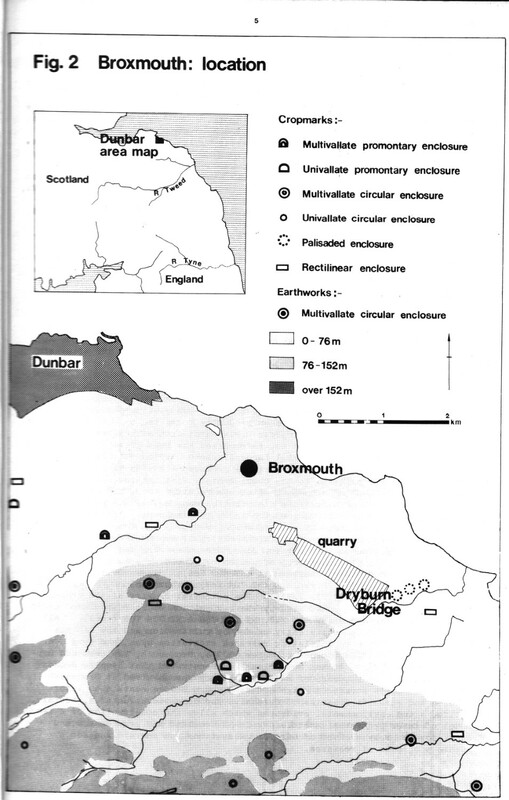 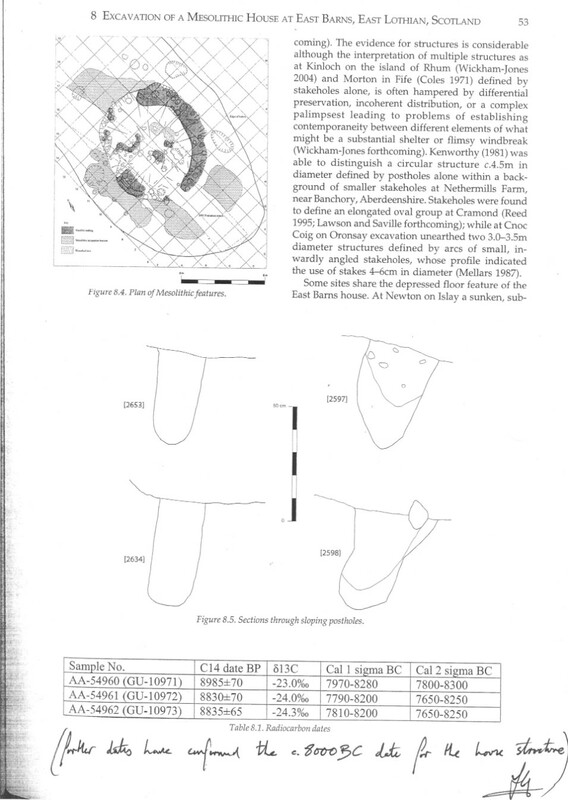 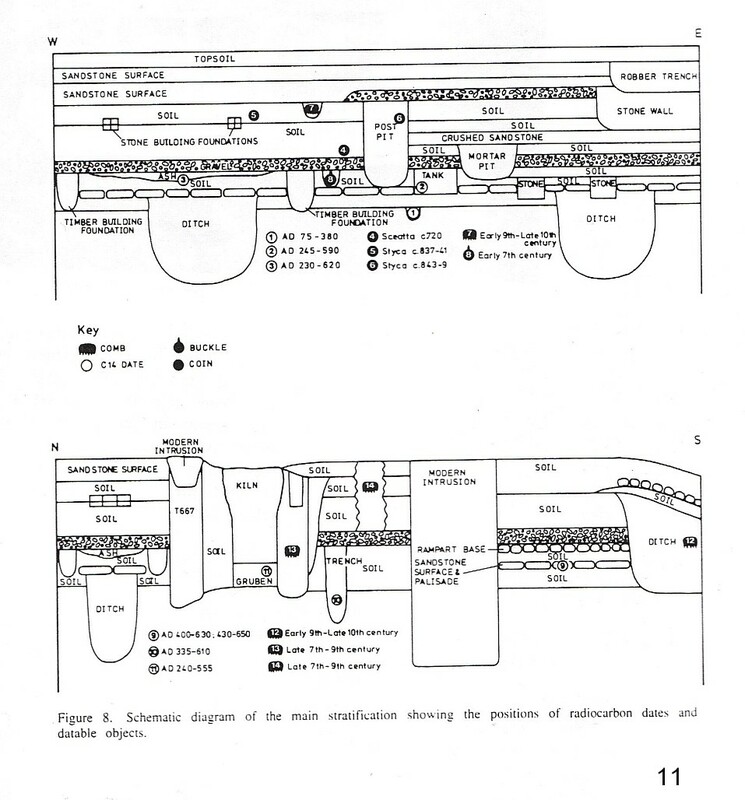 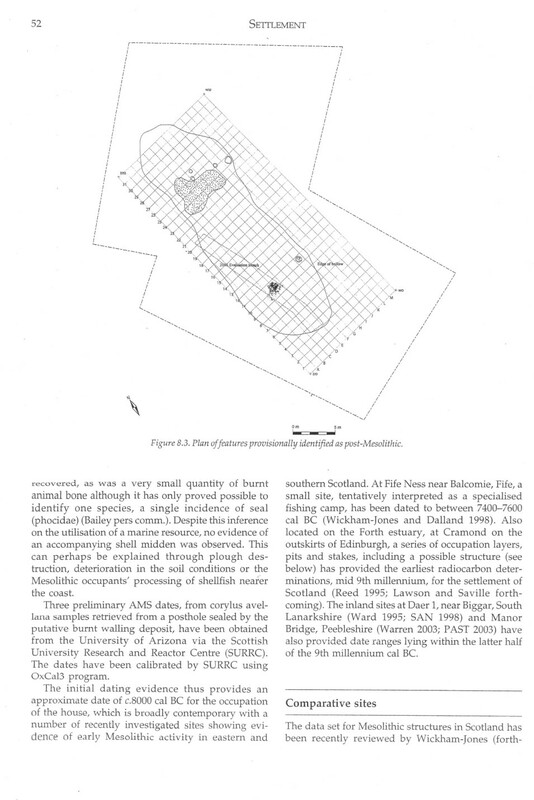 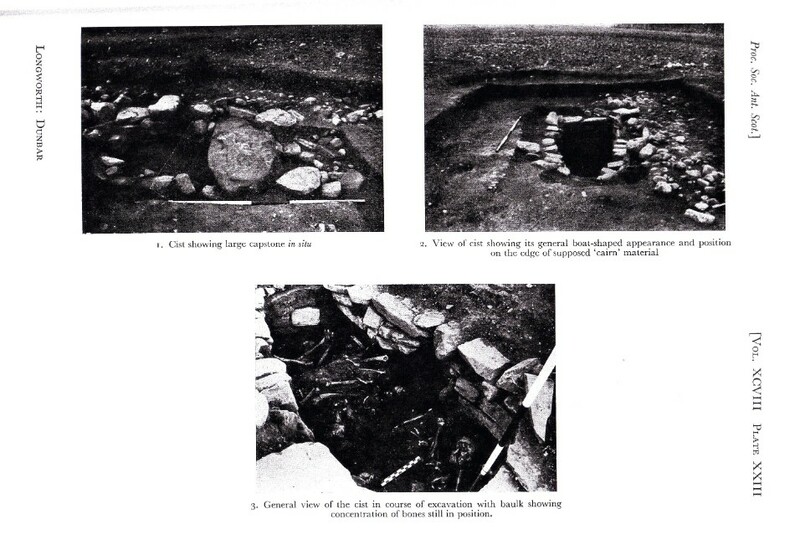 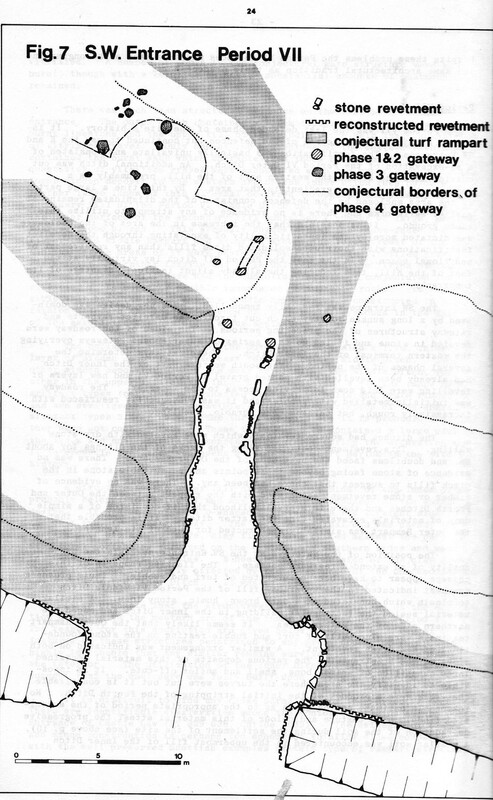 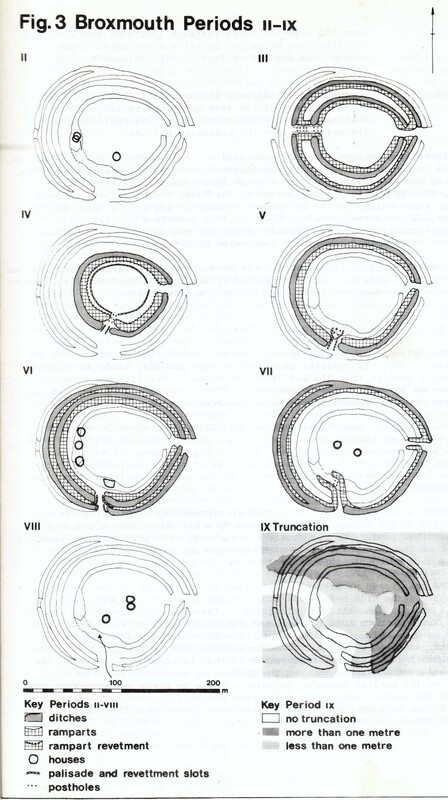 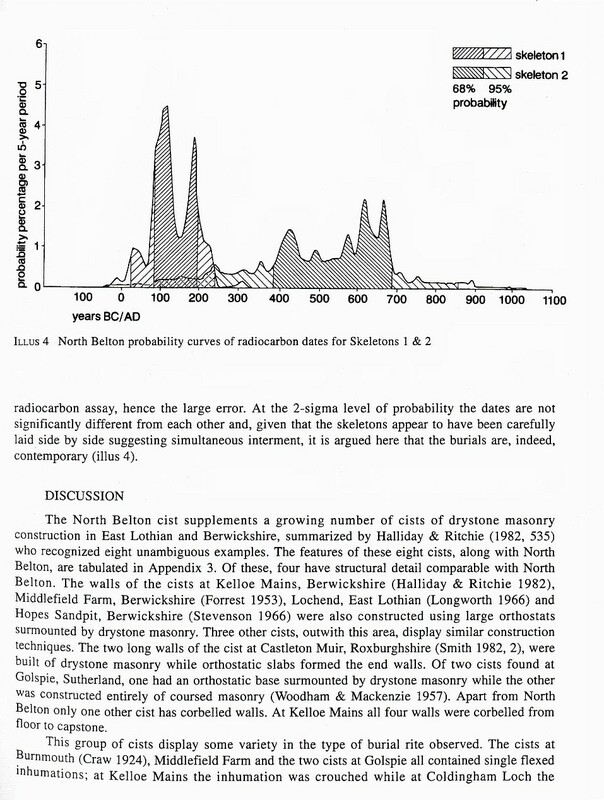 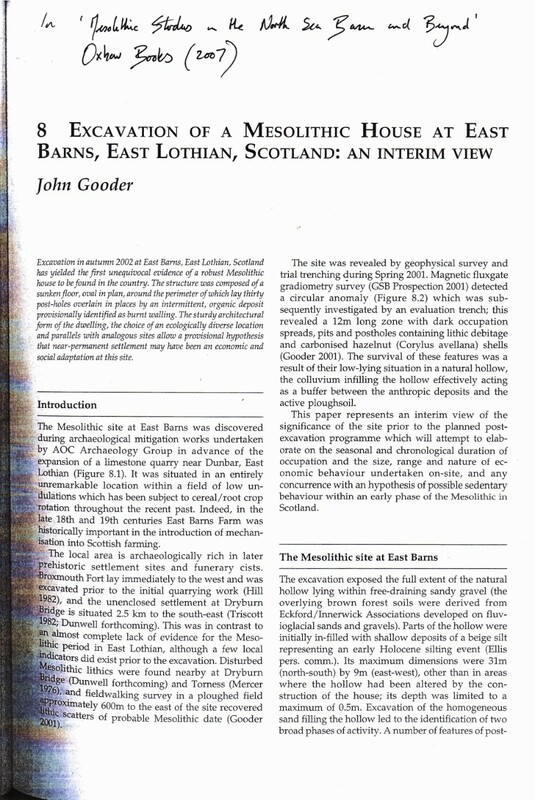 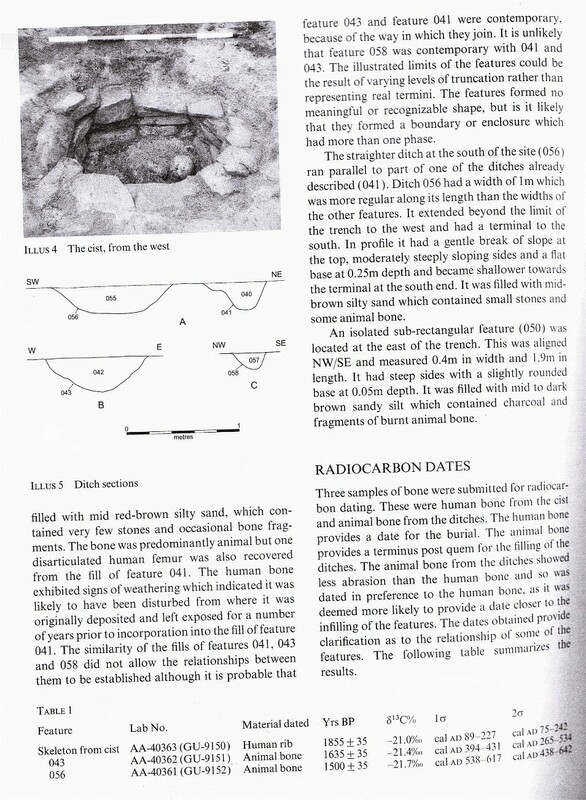 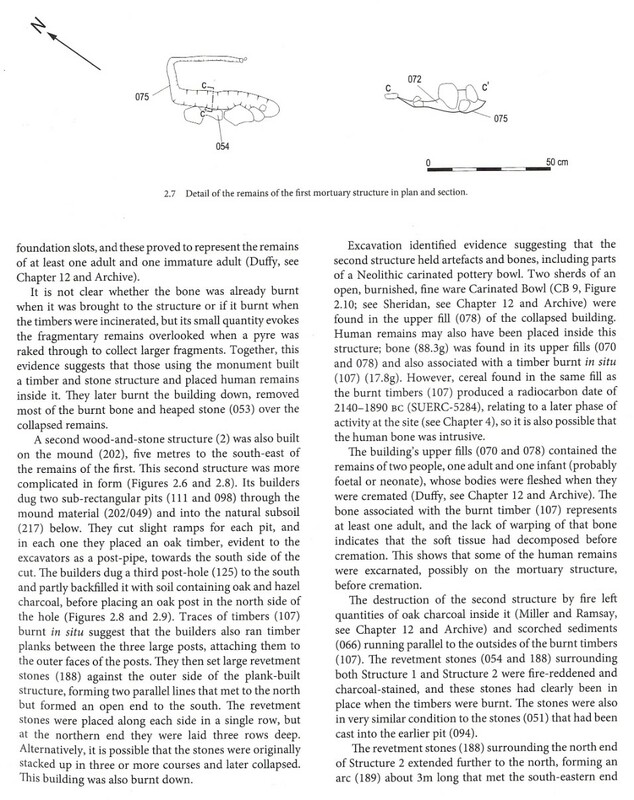 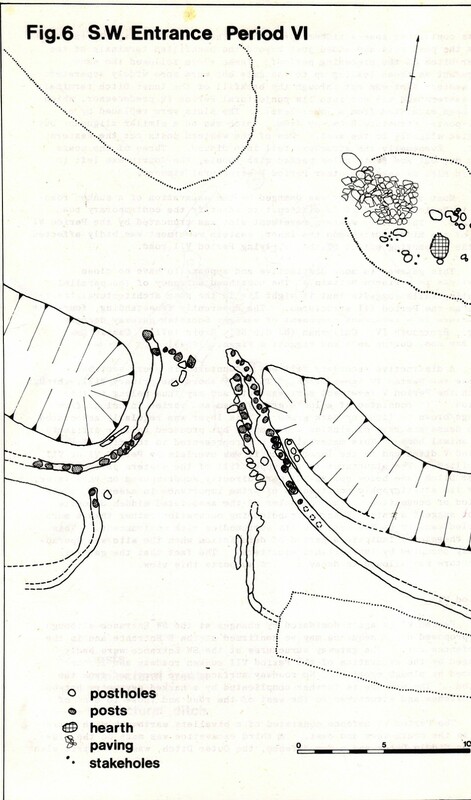 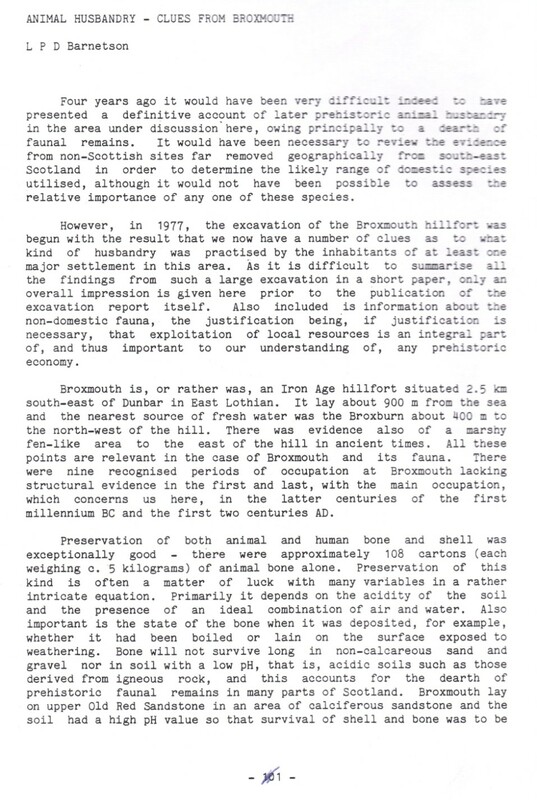 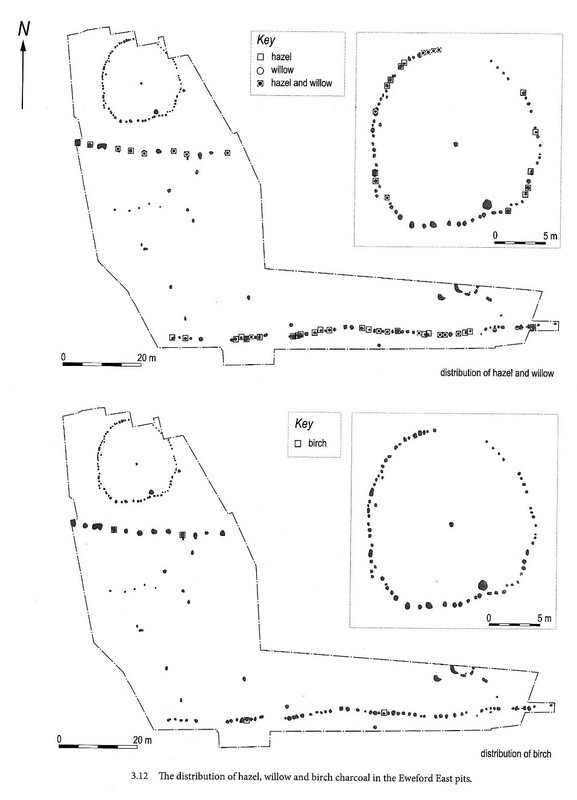 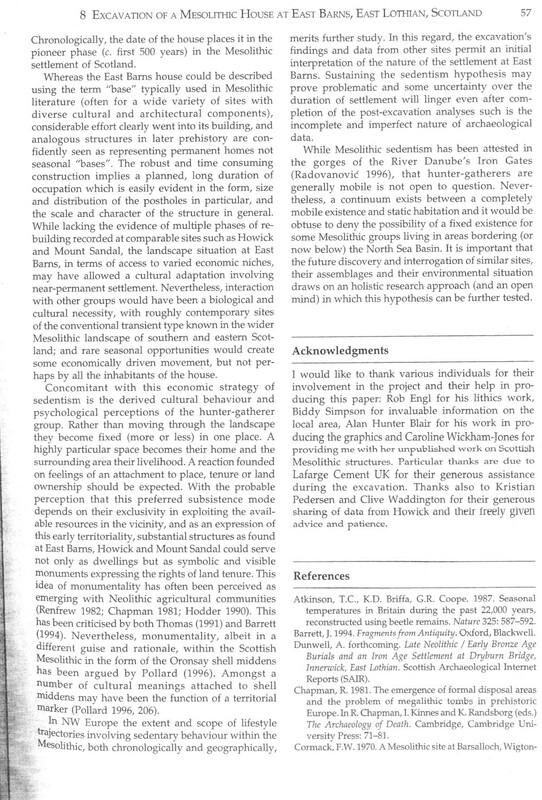 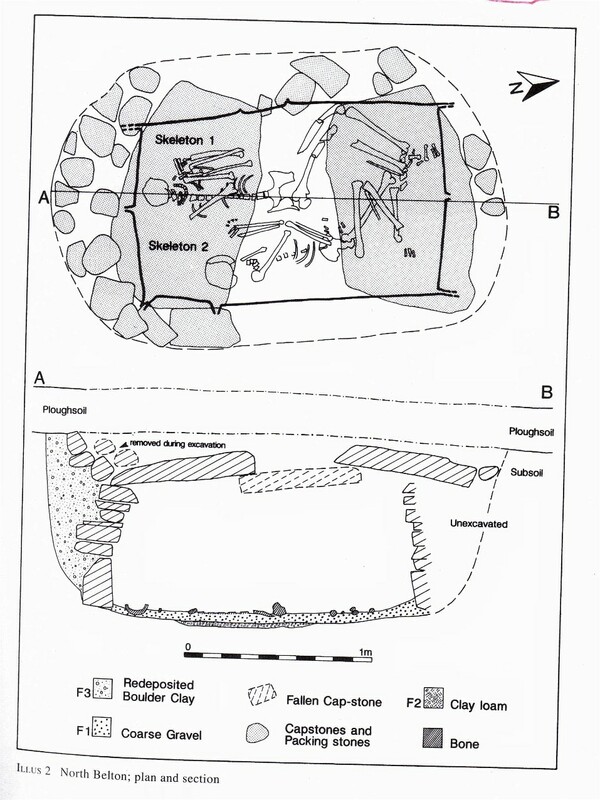 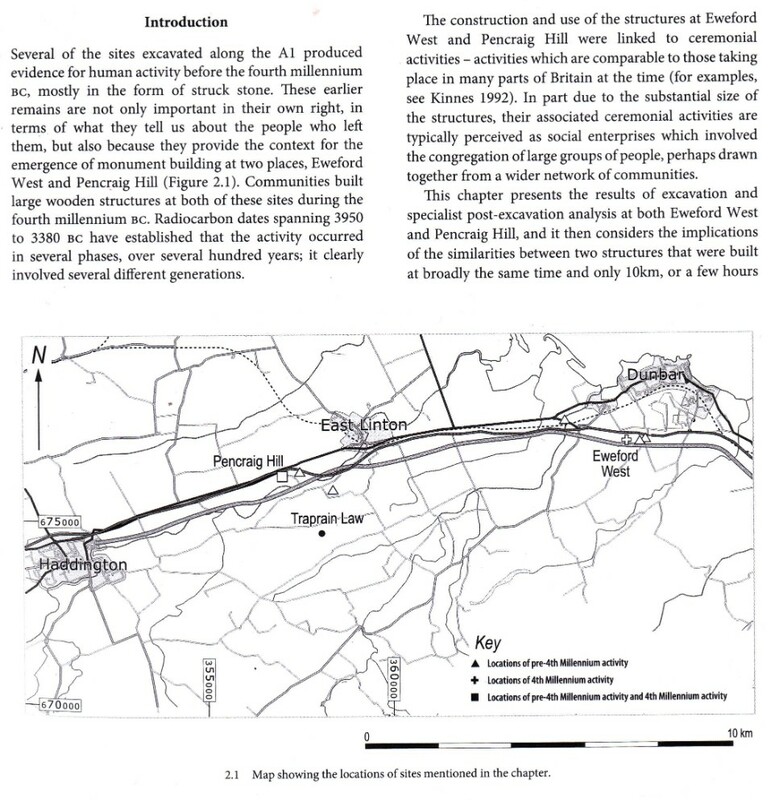 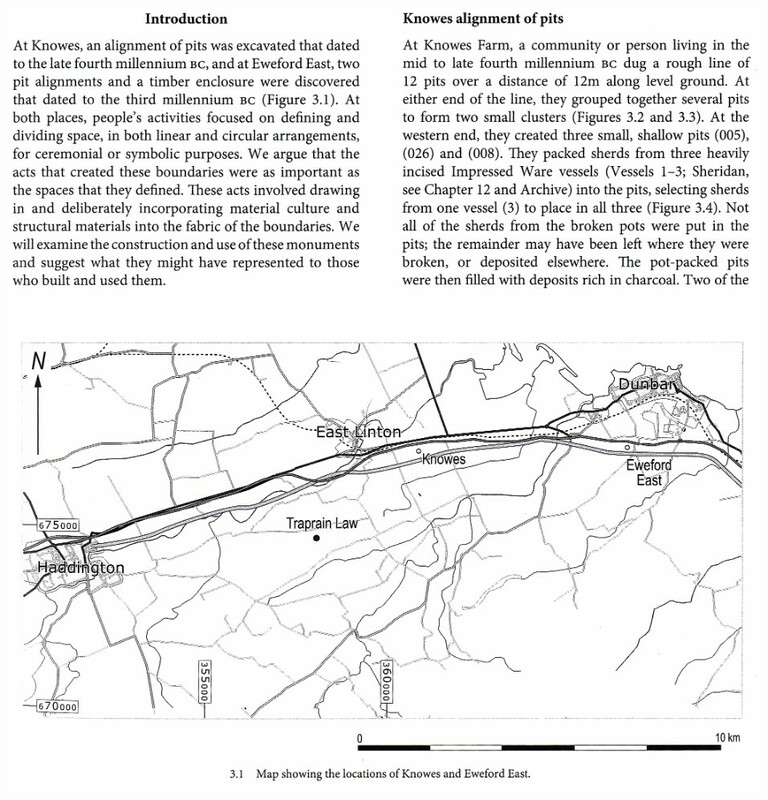 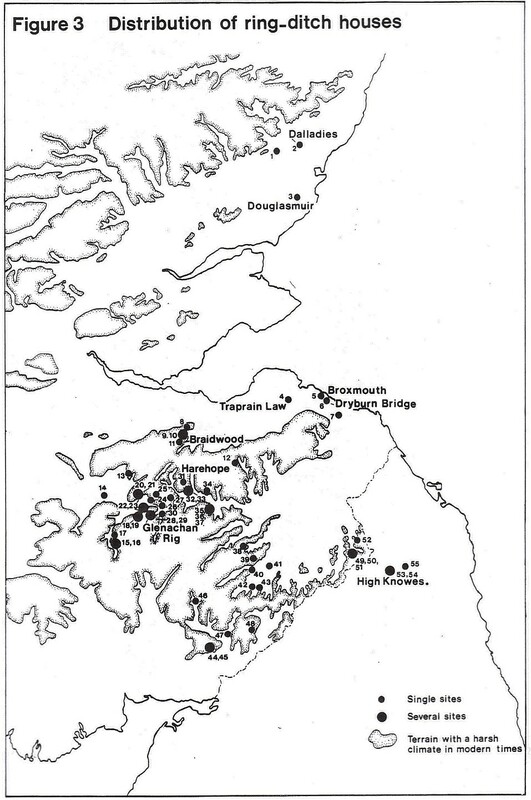 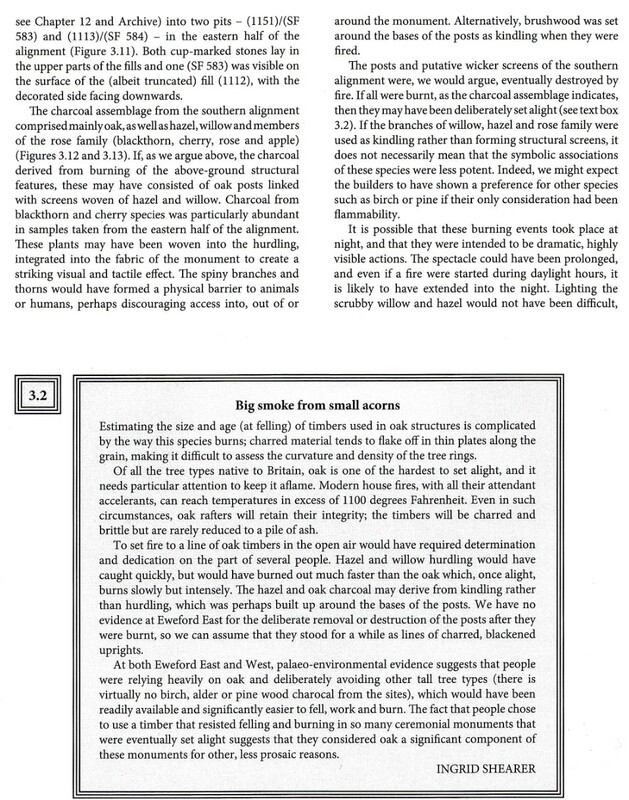 However the "man-made" hill feature to the south-east could, it is proposed, house a late neolithic burial chamber and indeed evidence of a small settlement propinquous to it postulated by local archaeologist Jon Triscott (ex Broxmouth Hillfort and Dryburn Bridge) as being perhaps an early Mesolithic site. 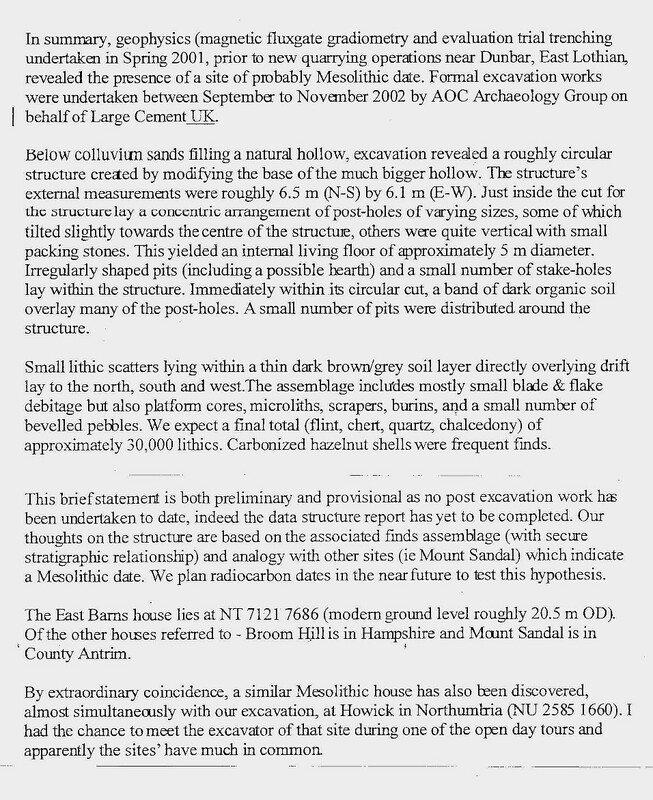 -Quite an interesting area and surely one in urgent need of archaeological investigation. 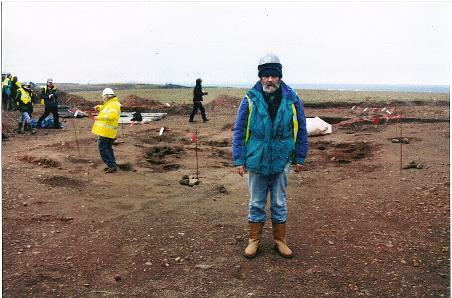 -What a "working" archaeological site this could make! 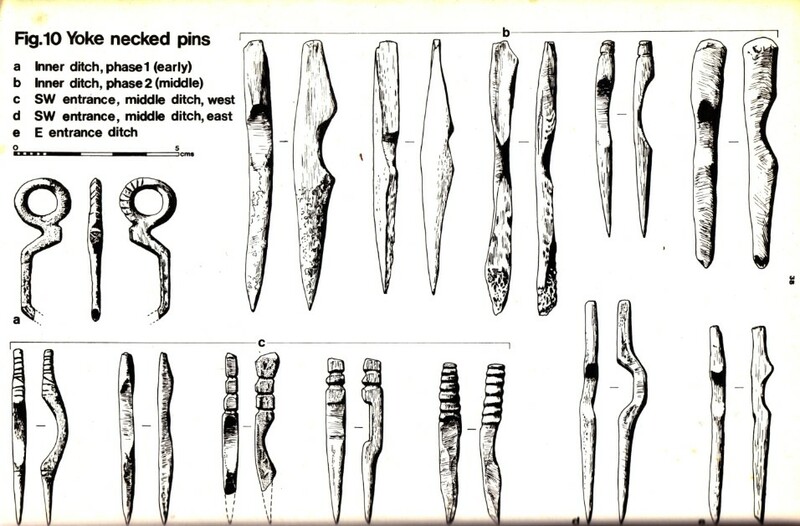 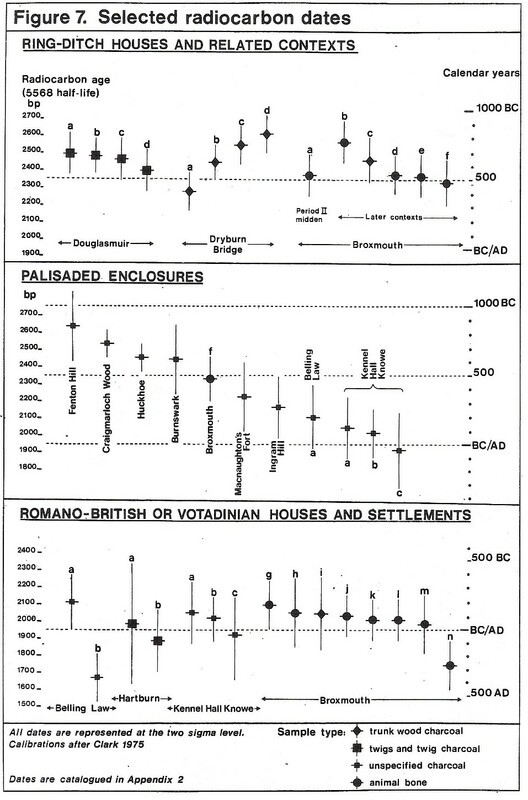 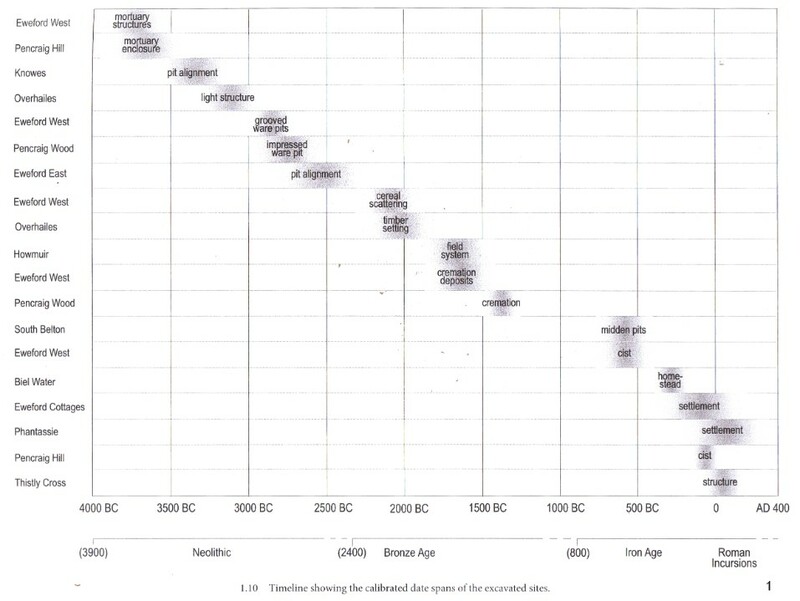 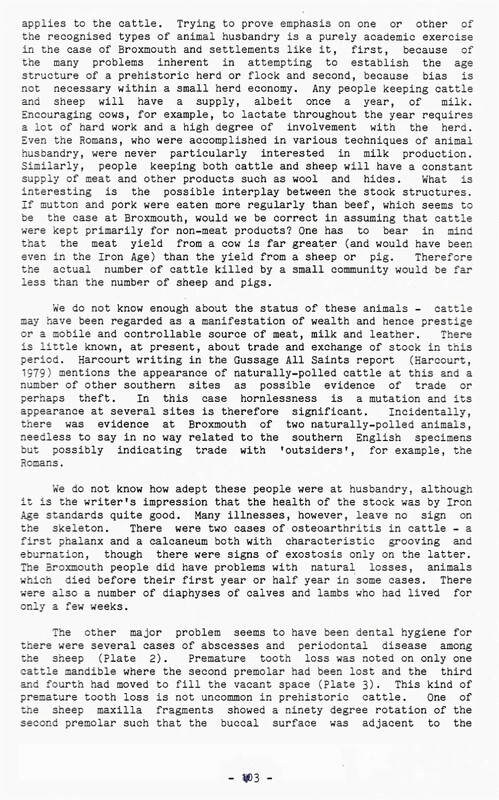 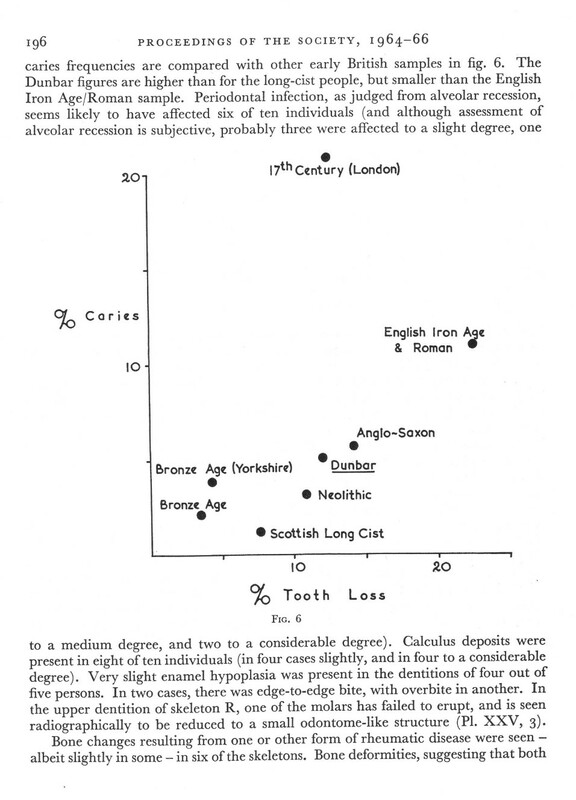 700 BC IRON AGE AD 300 ? 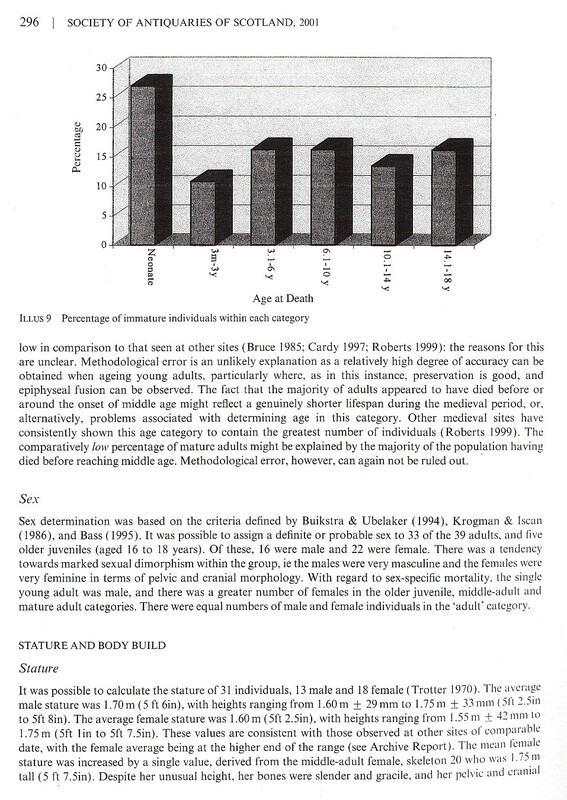 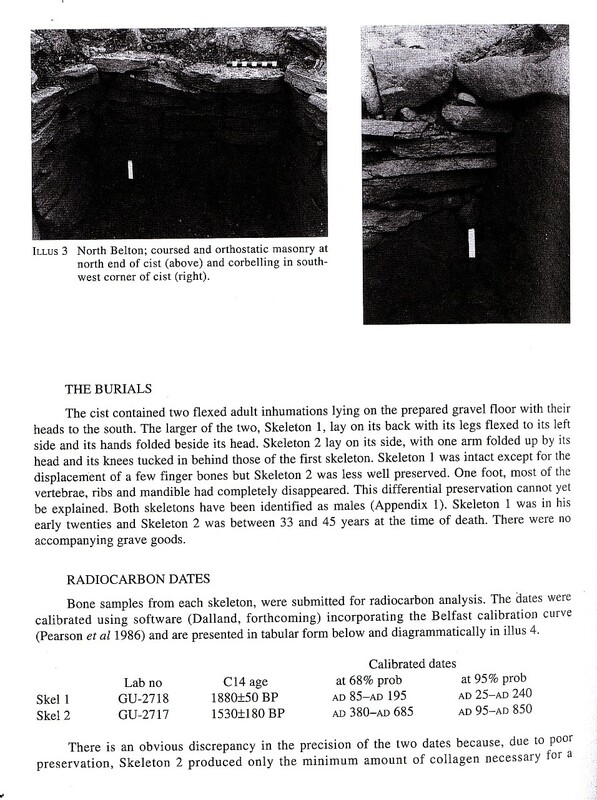 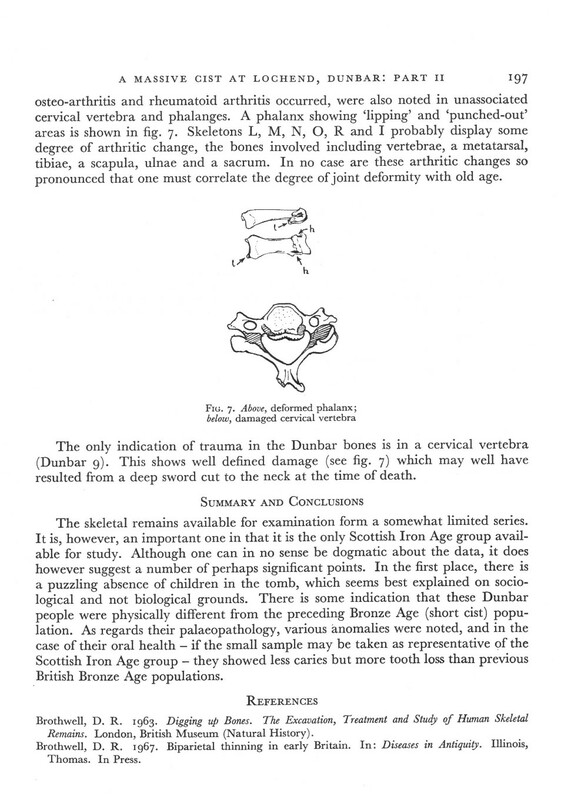 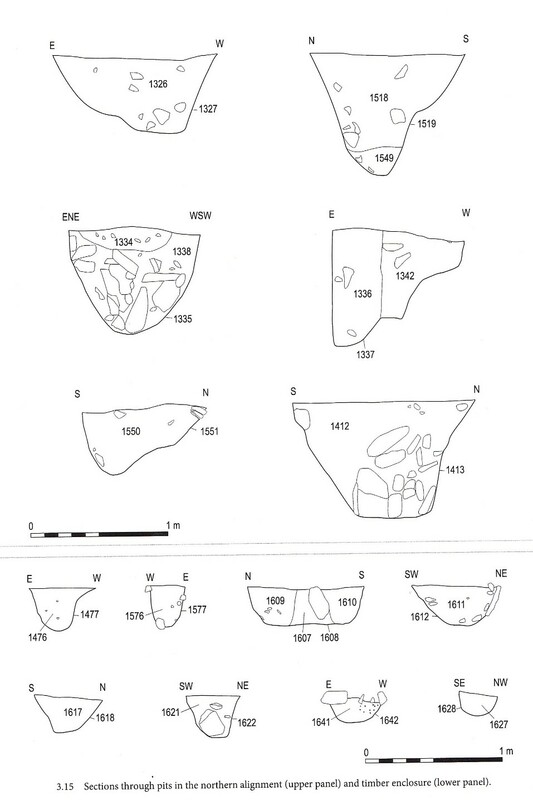 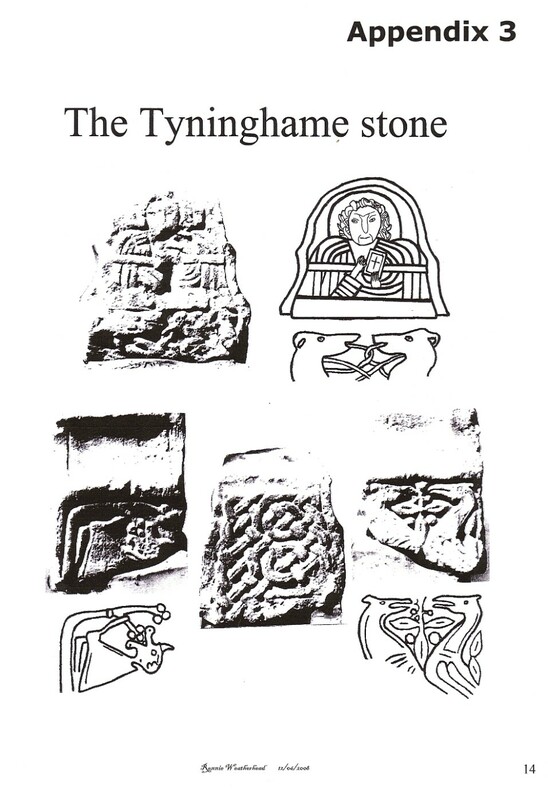 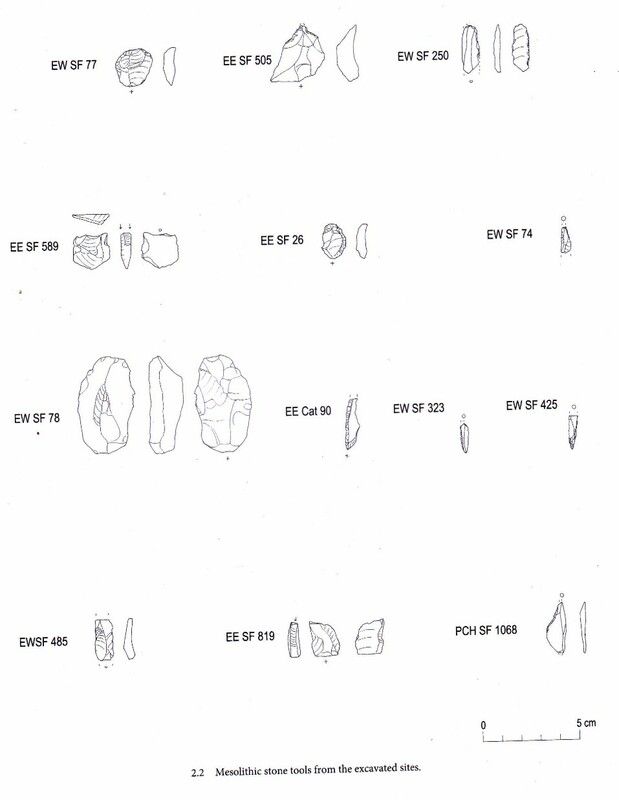 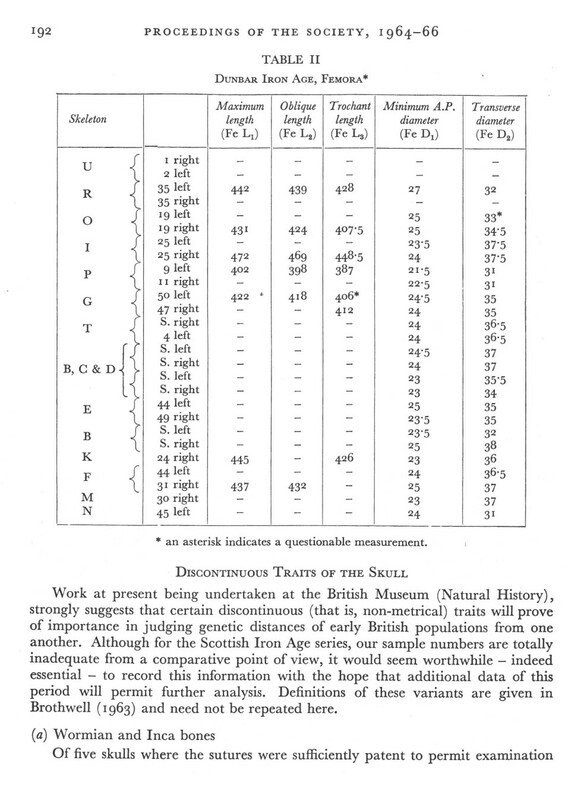 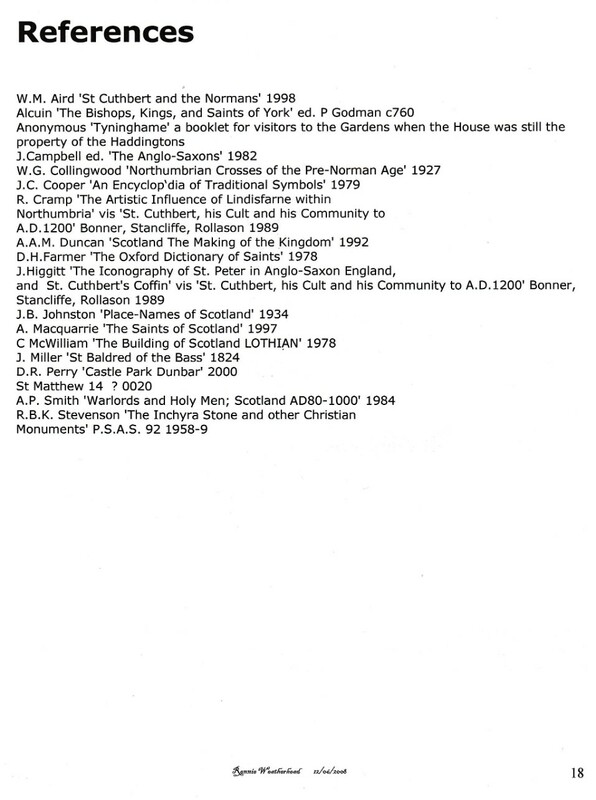 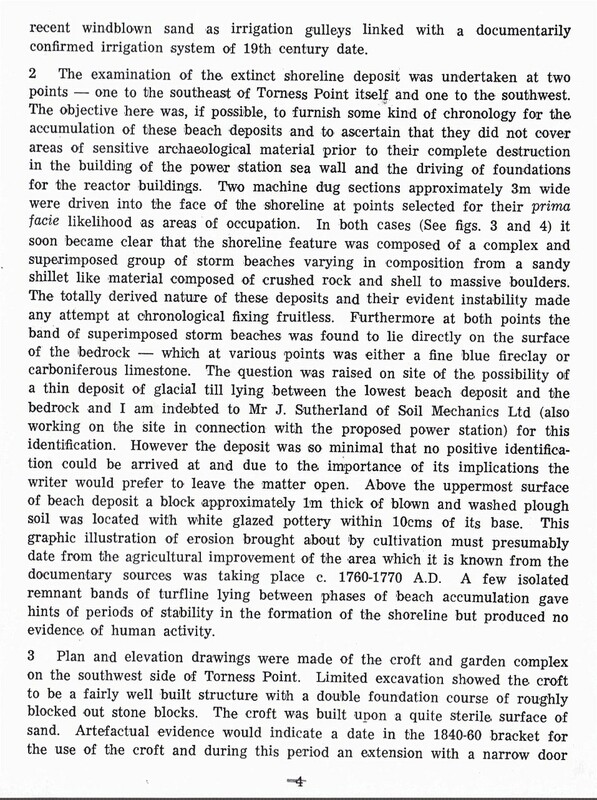 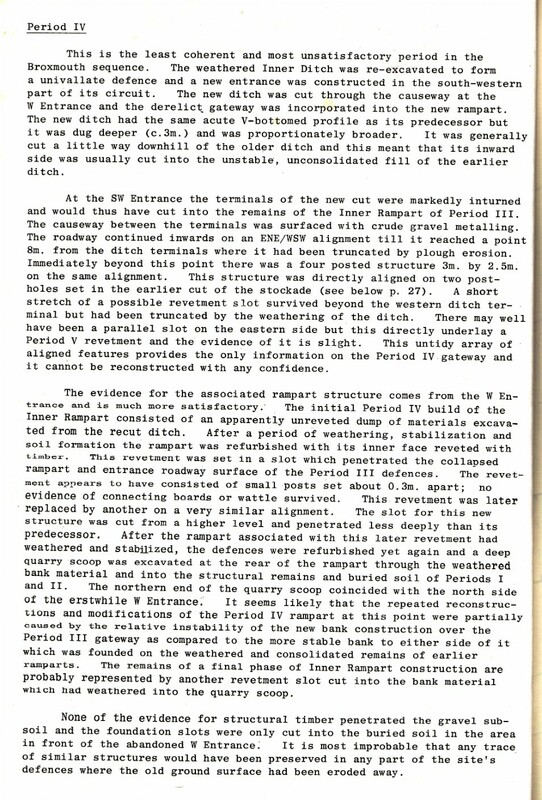 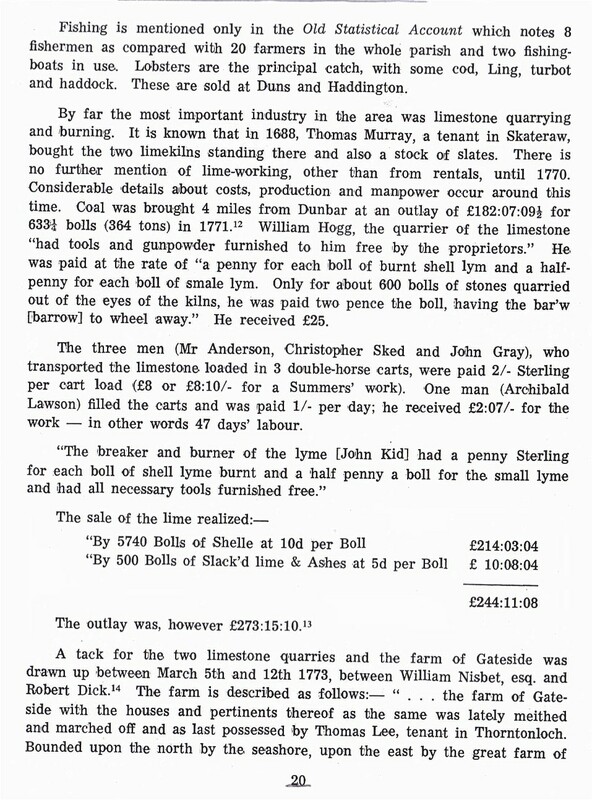 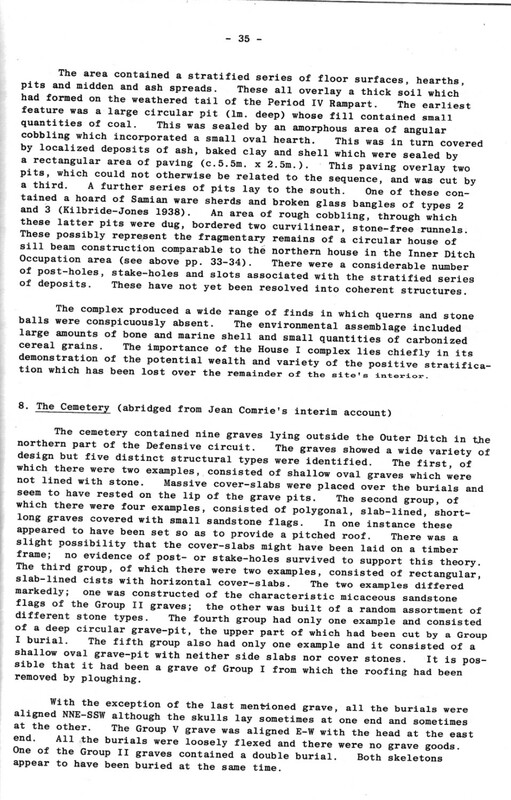 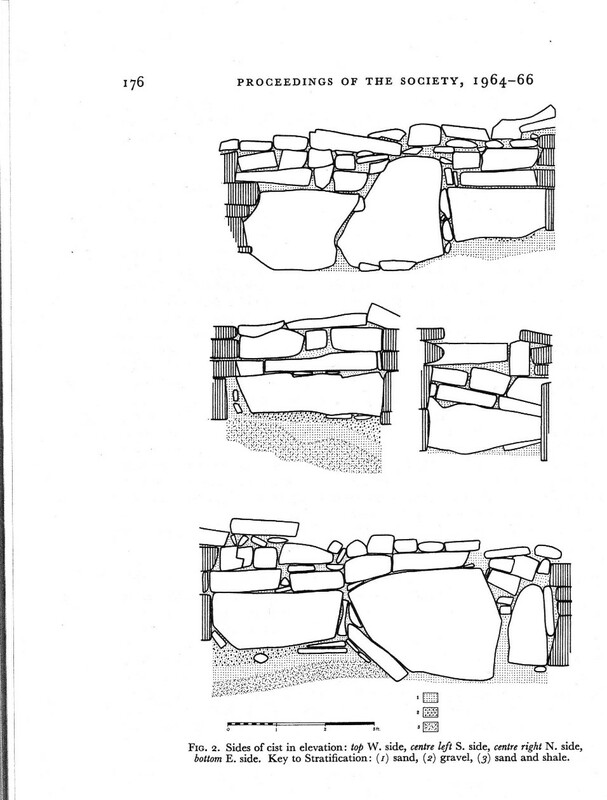 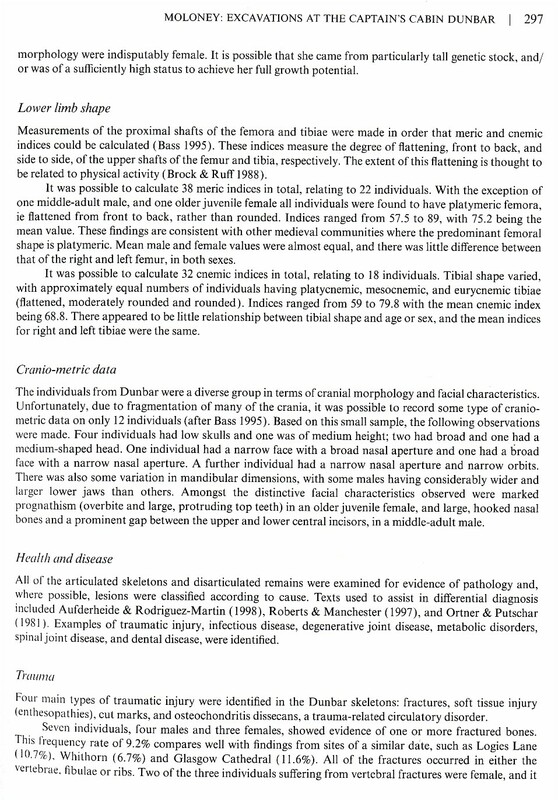 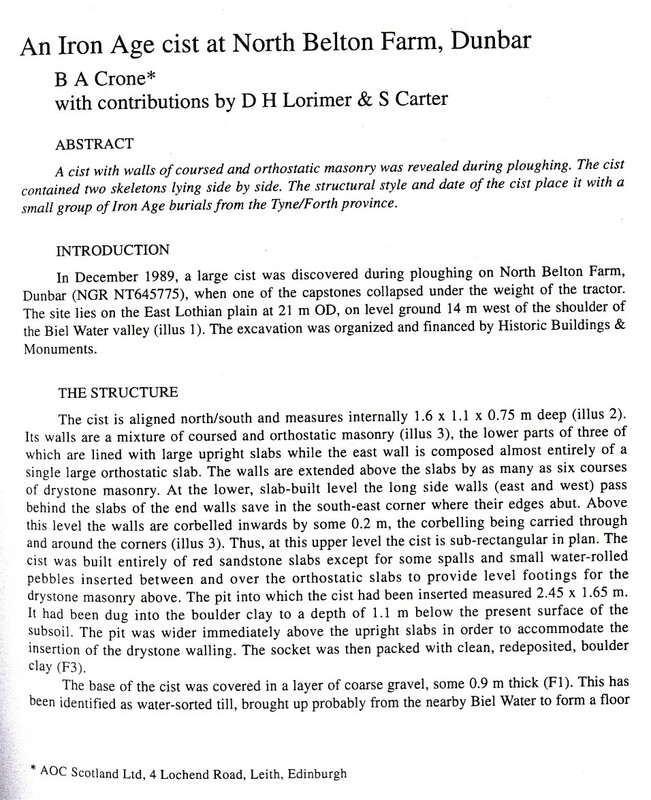 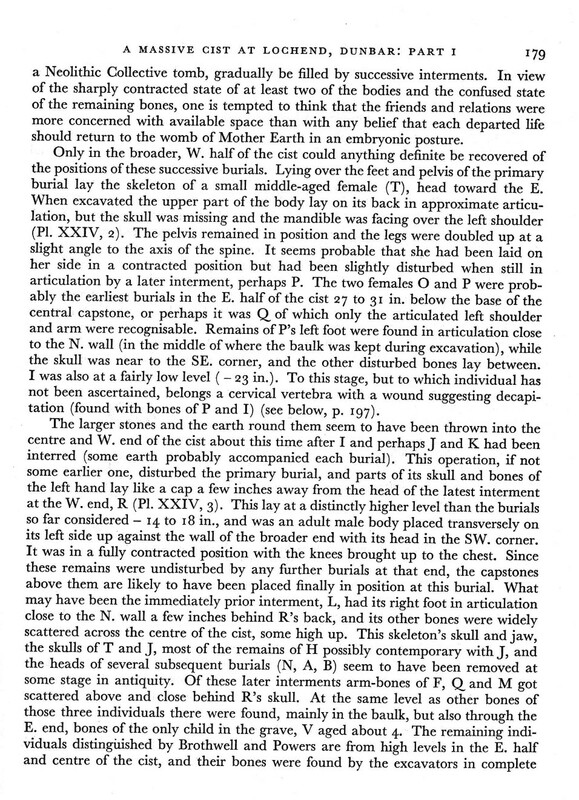 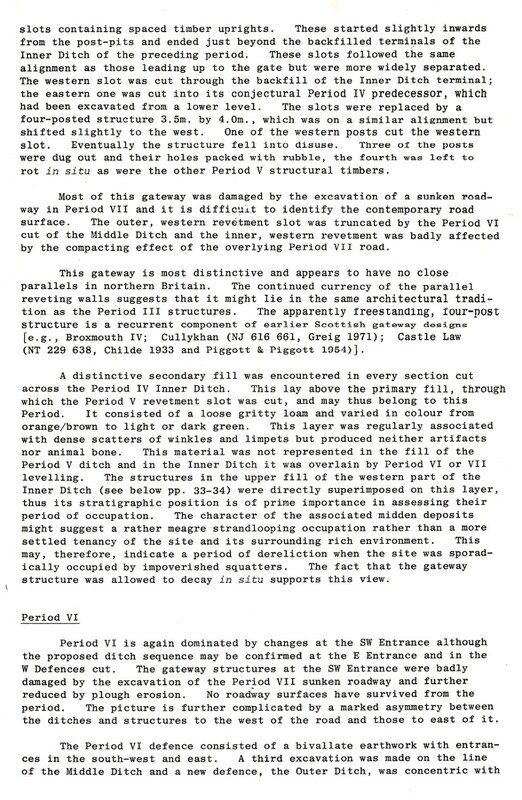 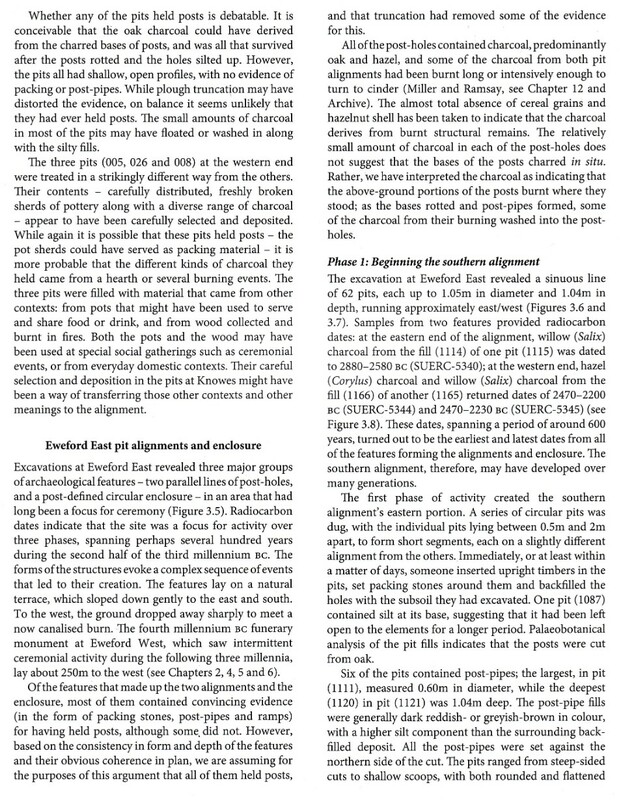 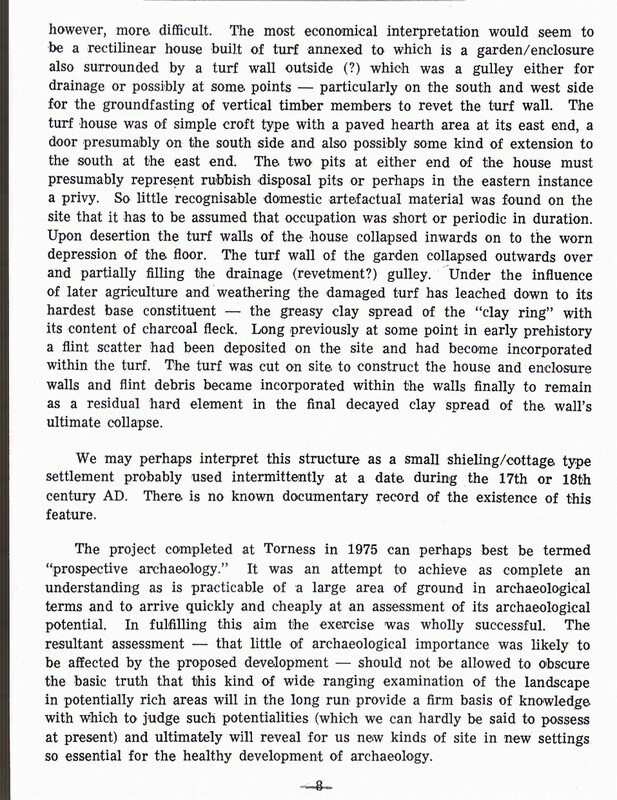 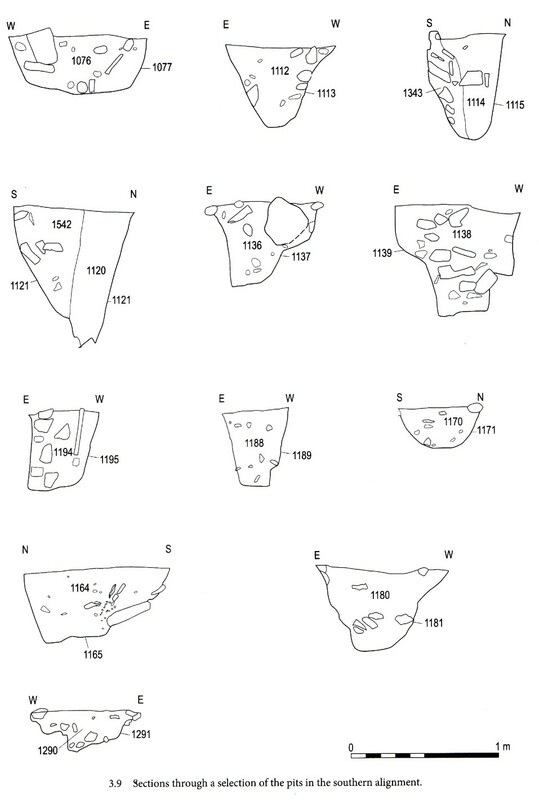 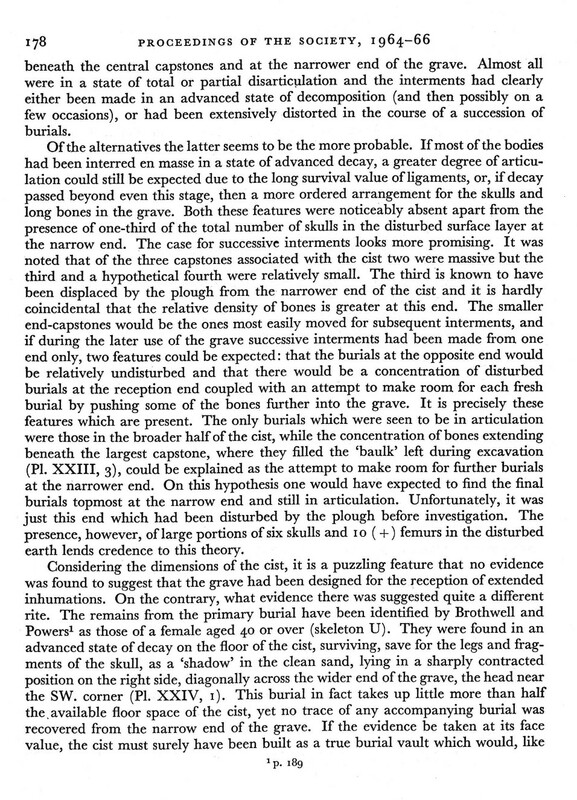 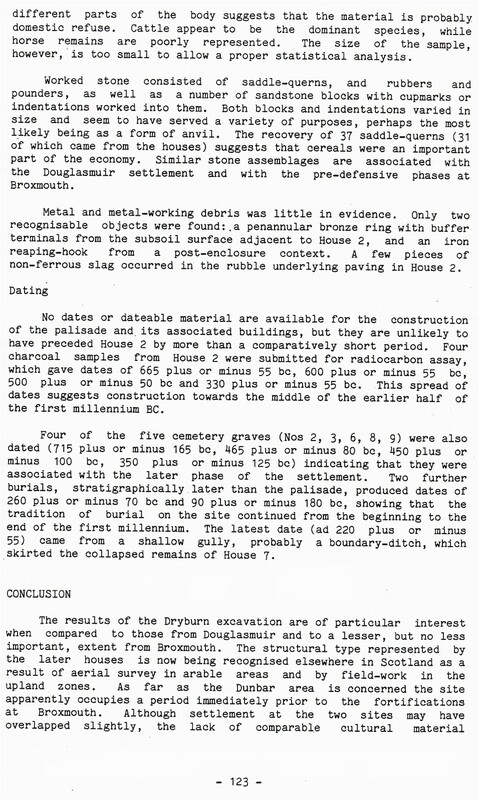 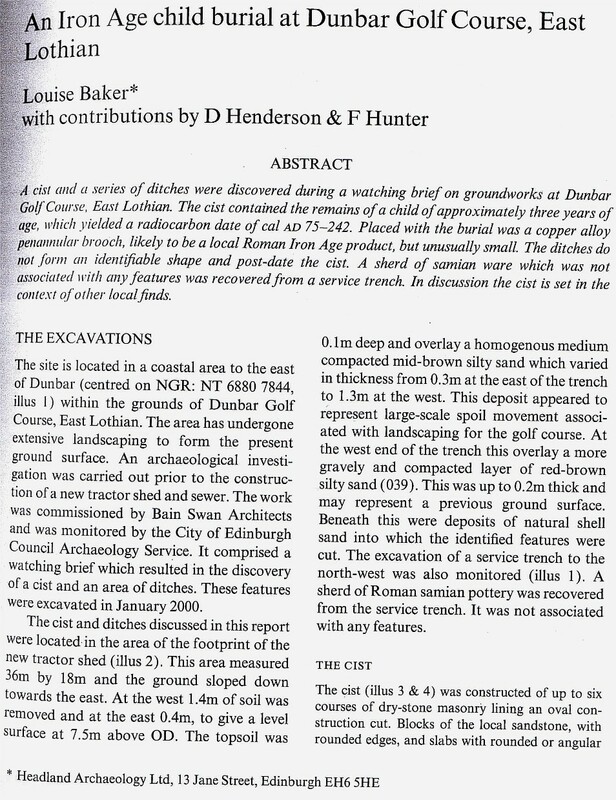 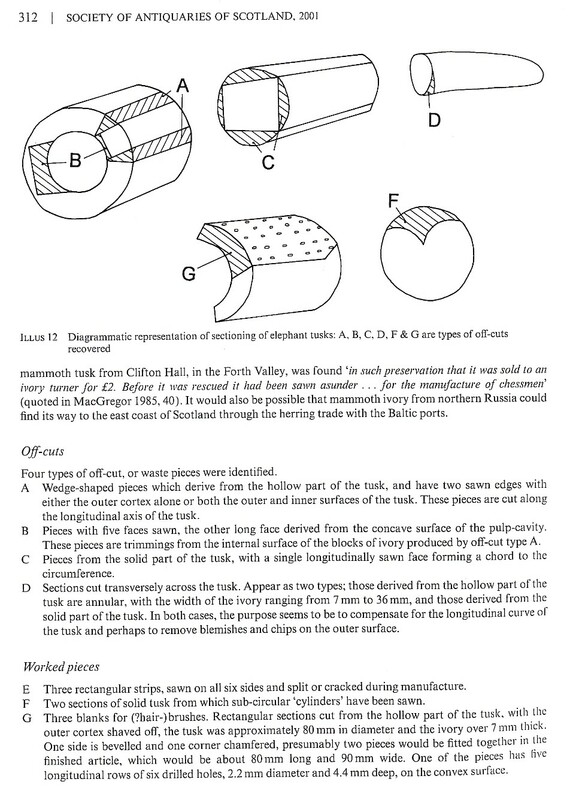 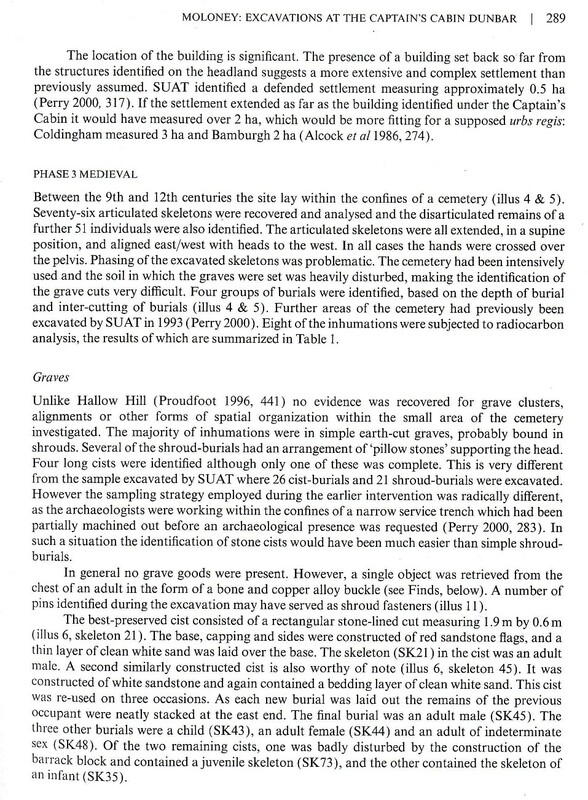 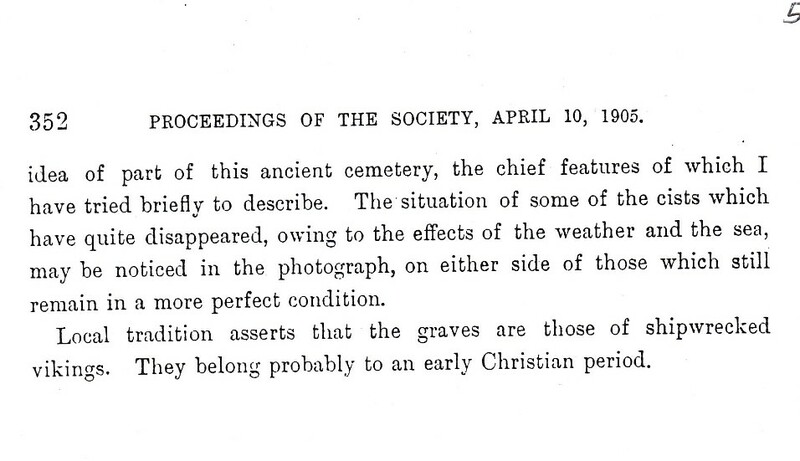 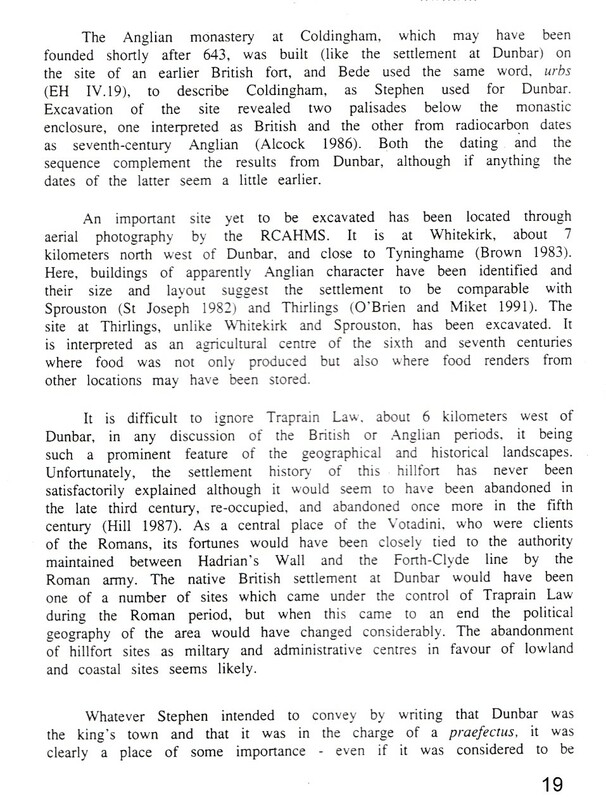 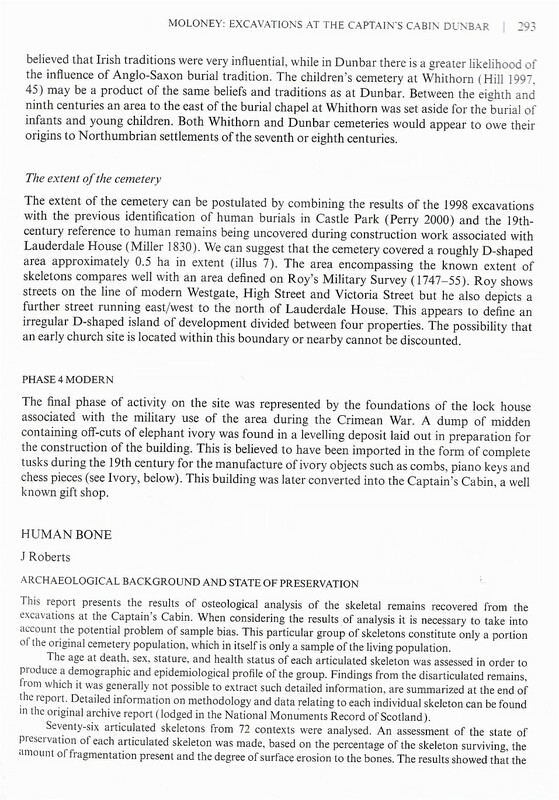 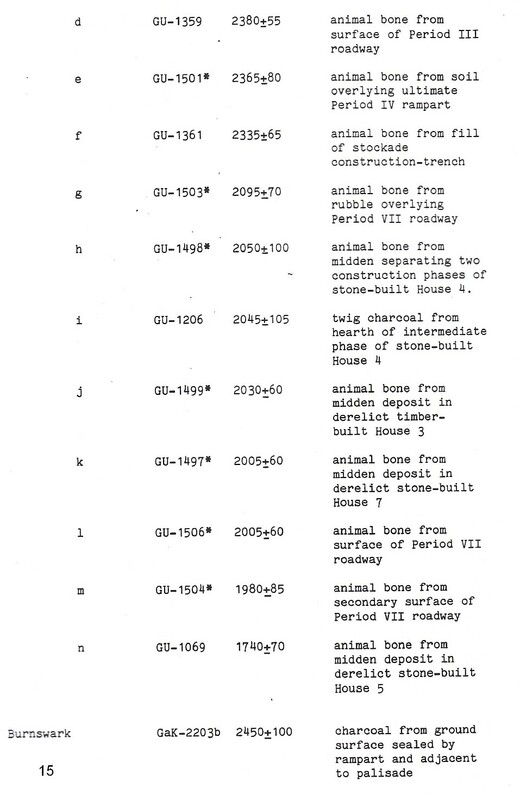 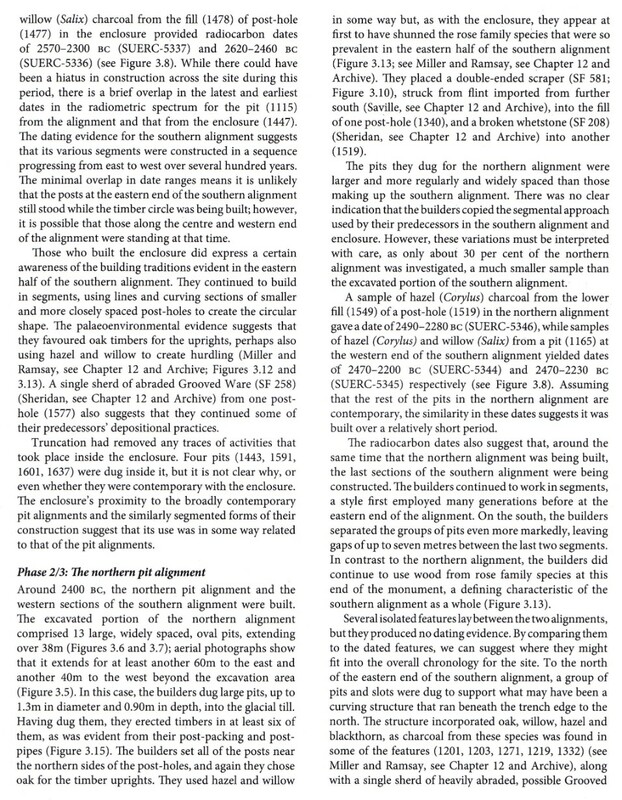 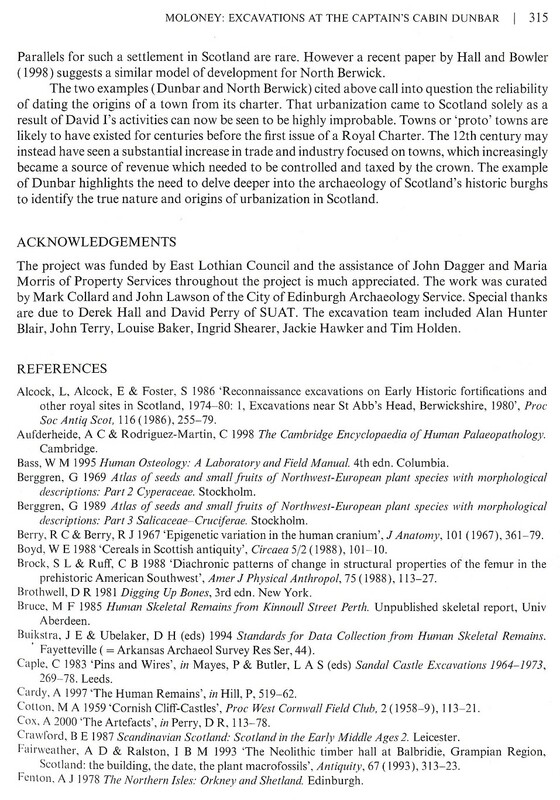 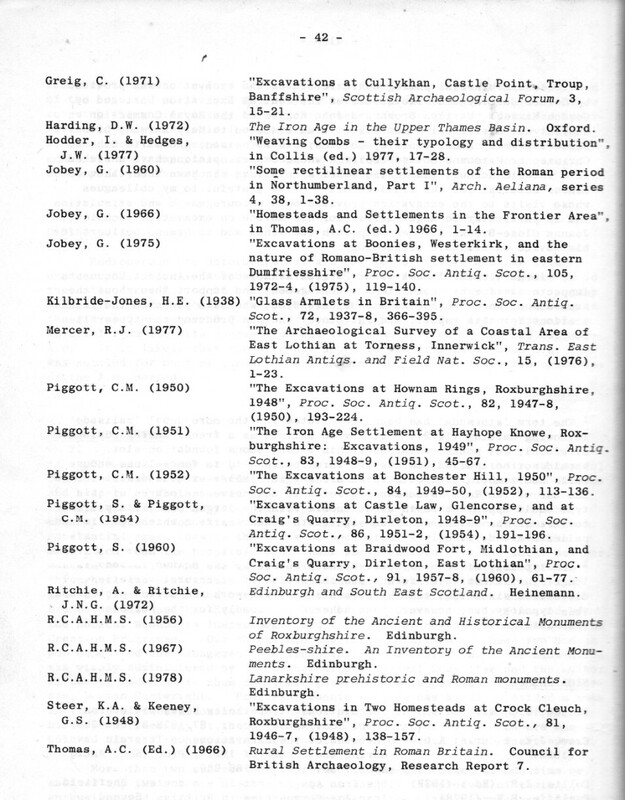 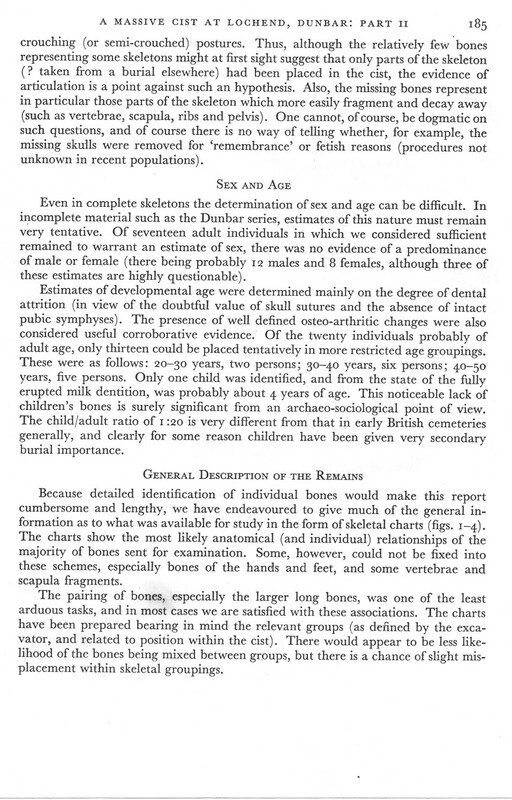 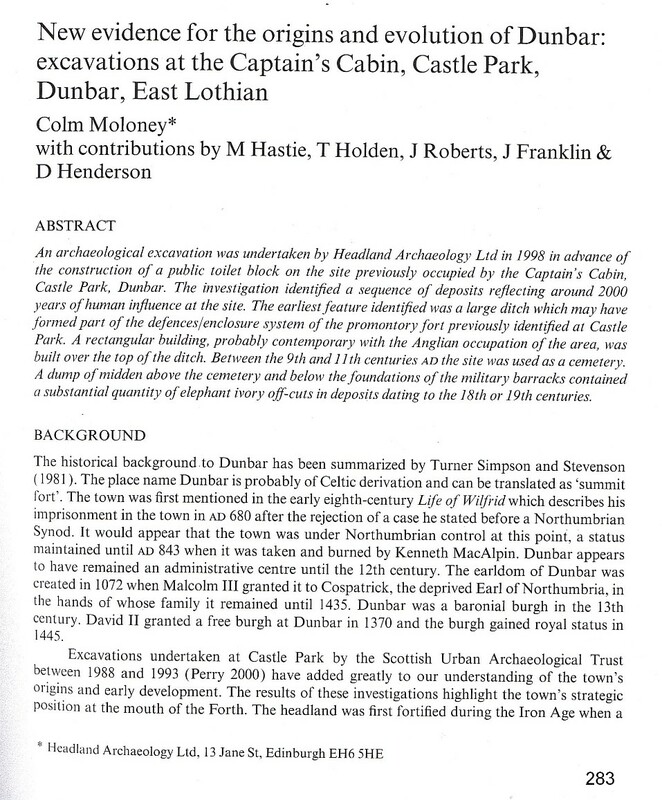 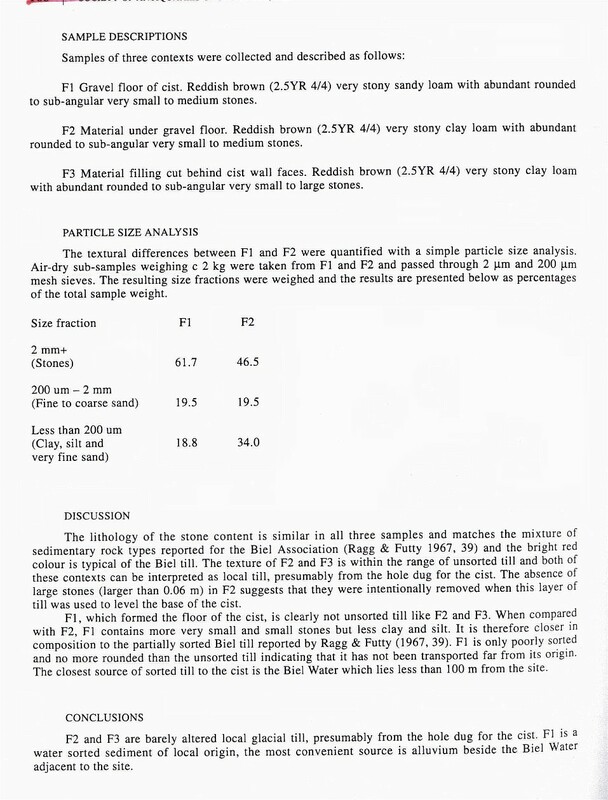 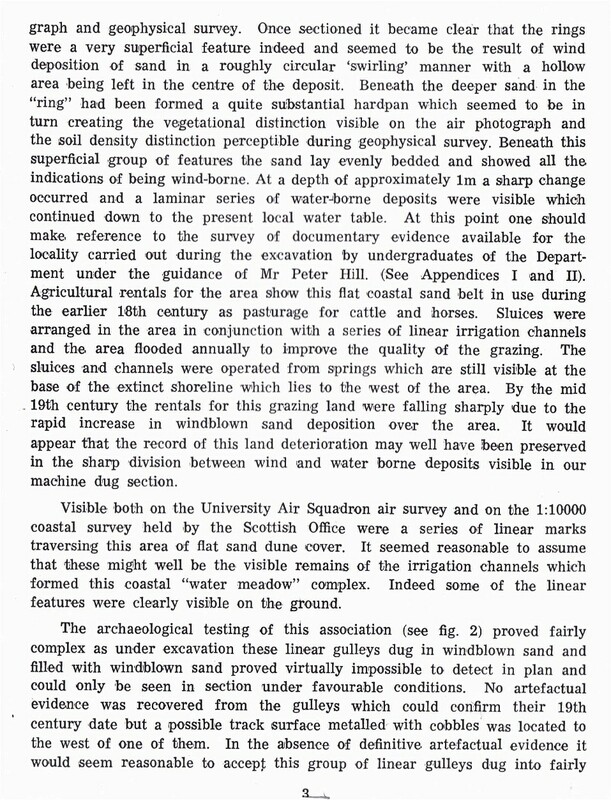 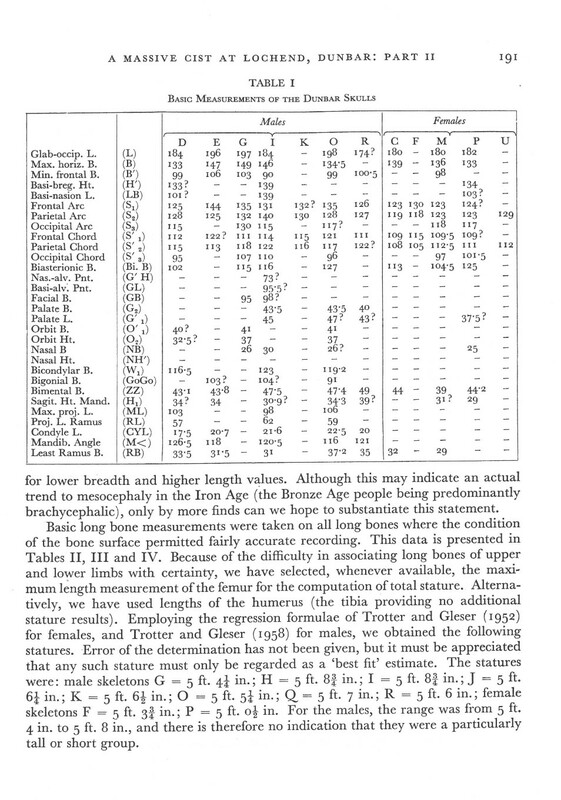 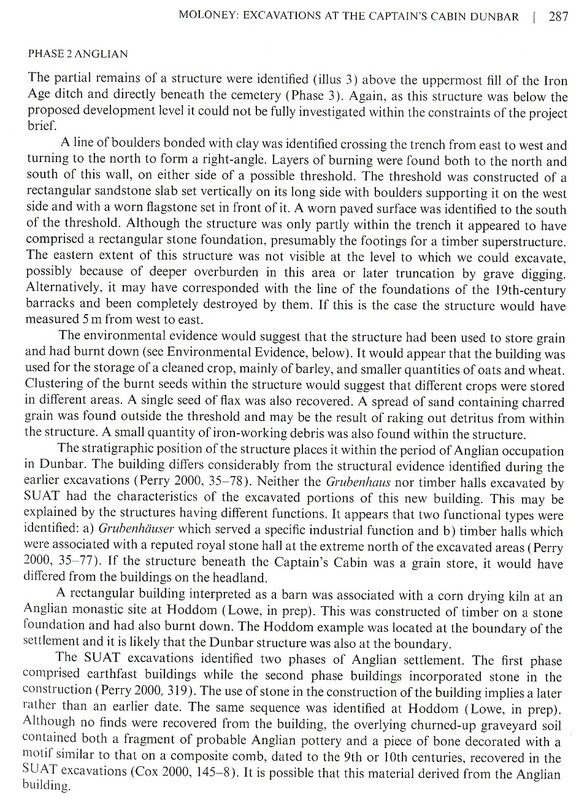 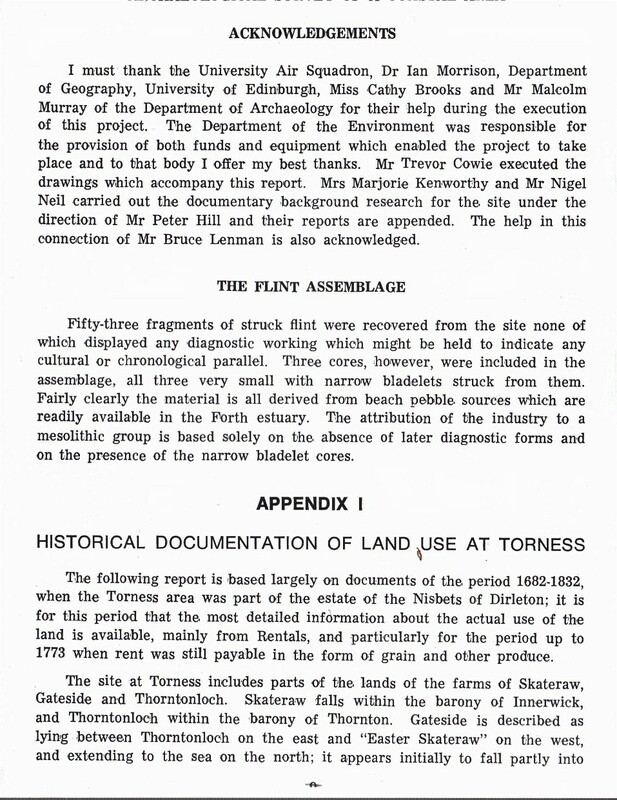 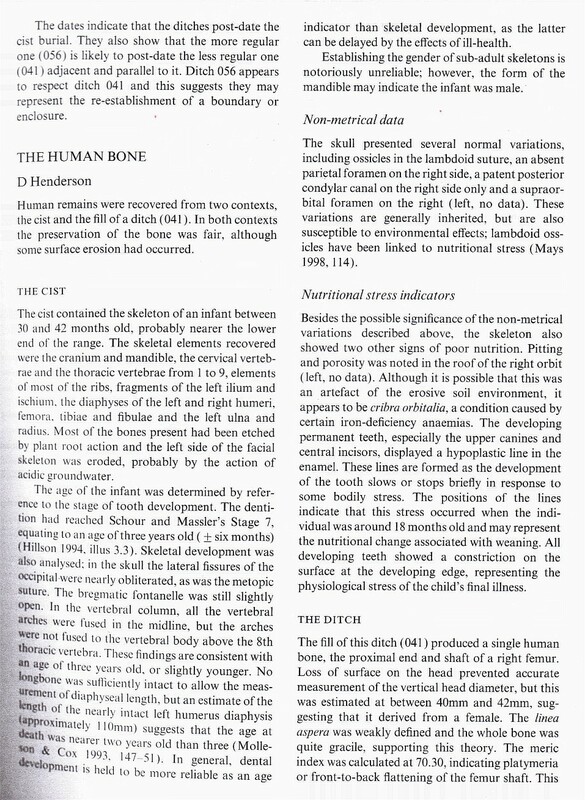 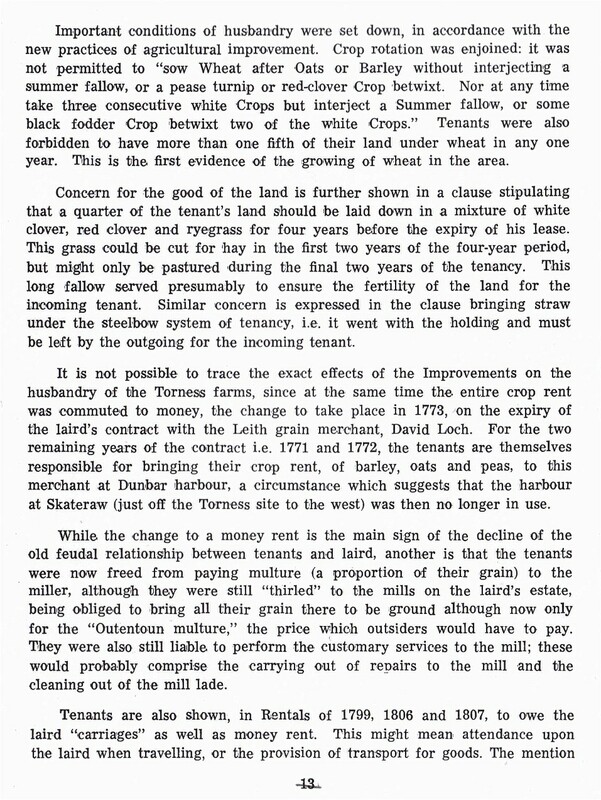 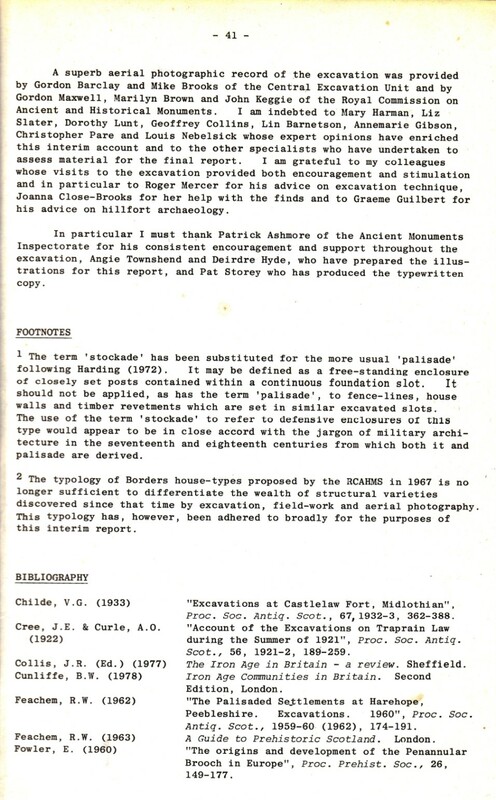 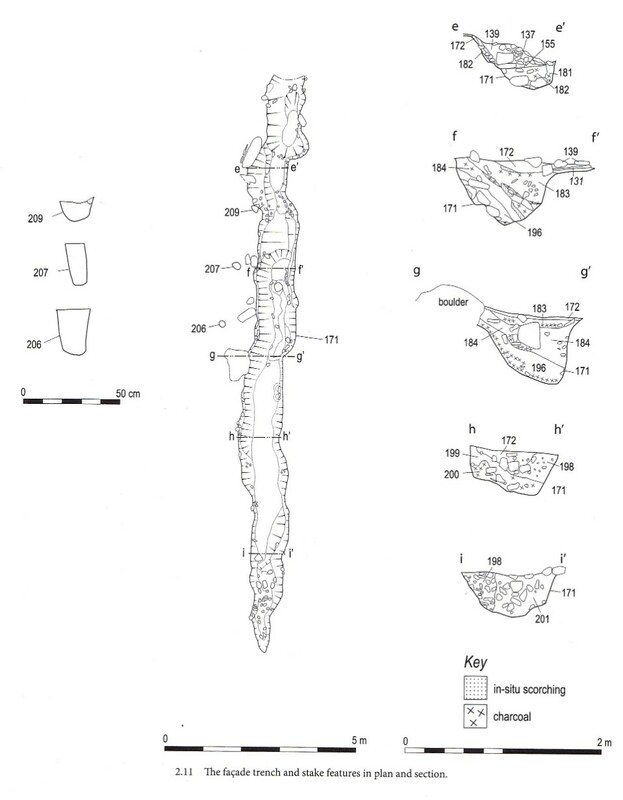 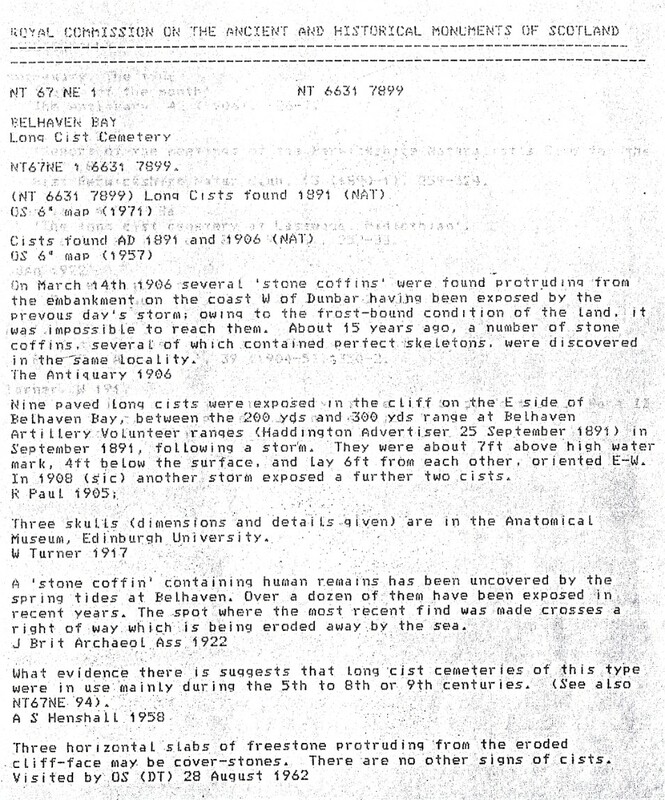 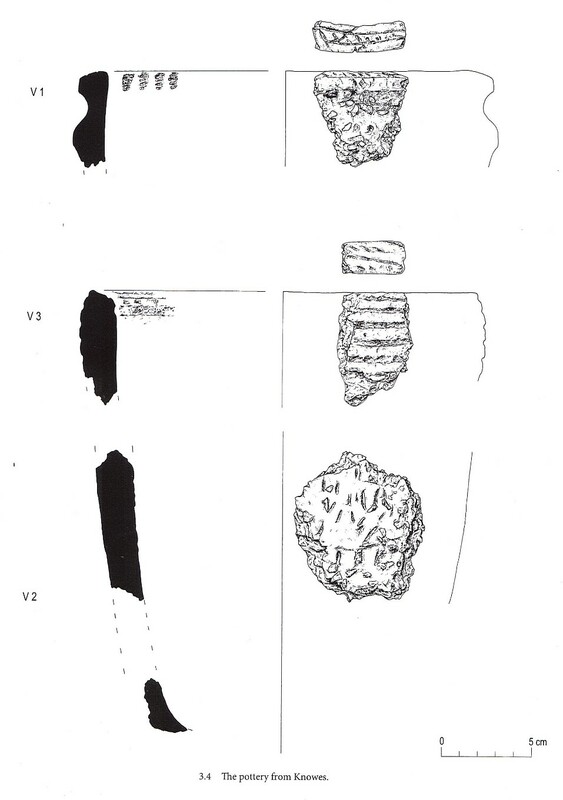 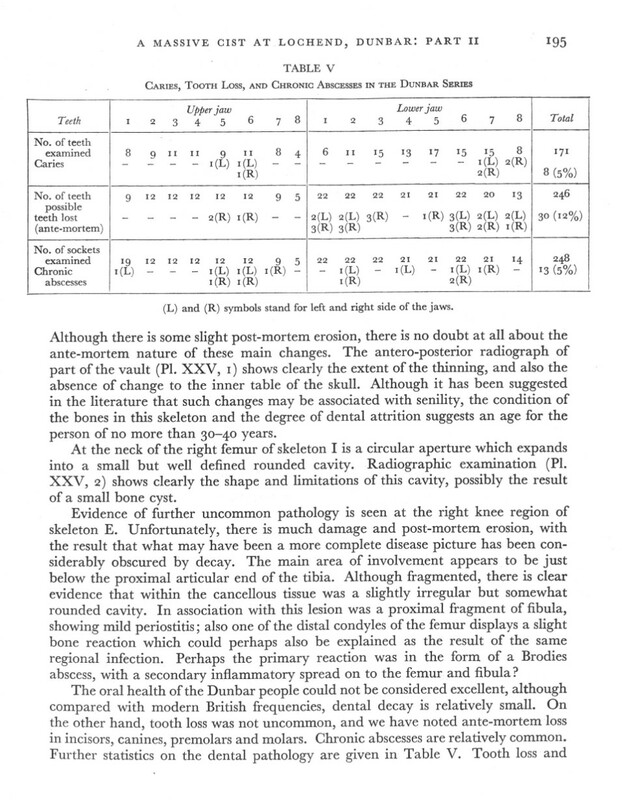 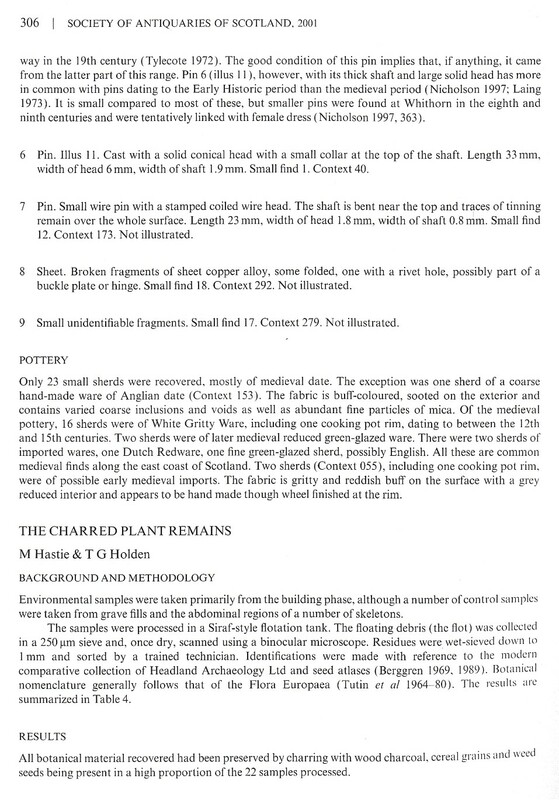 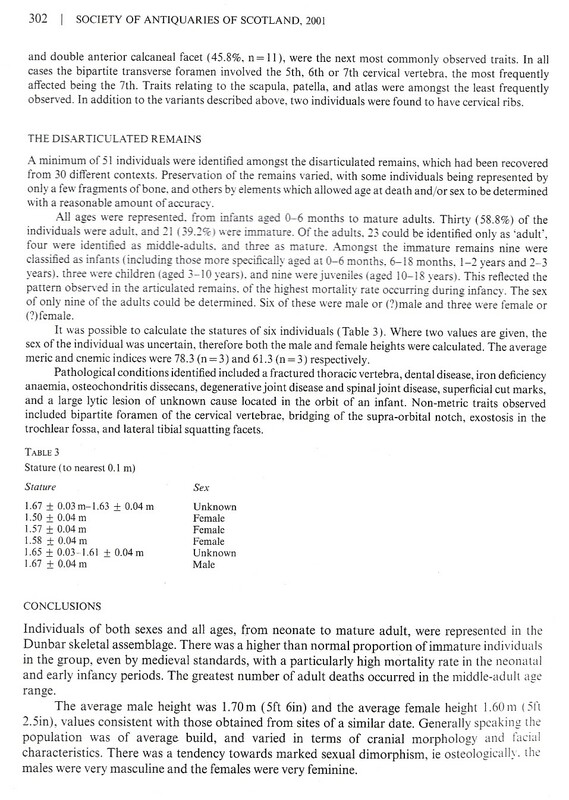 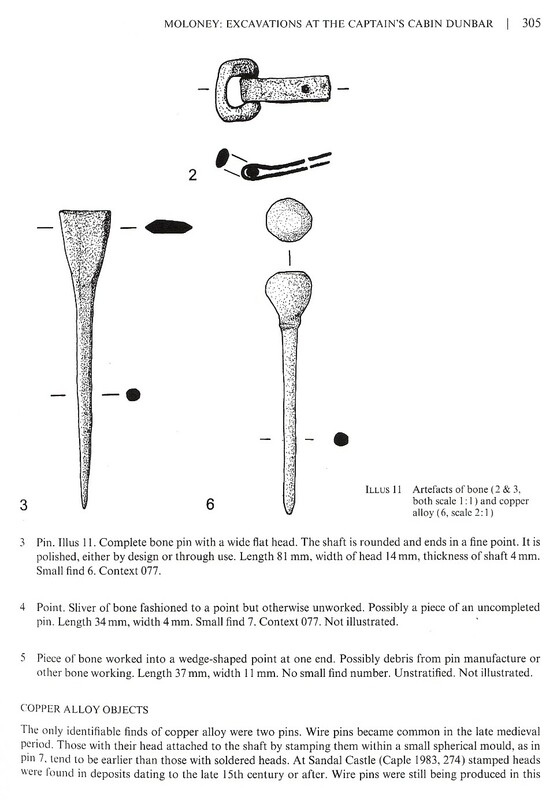 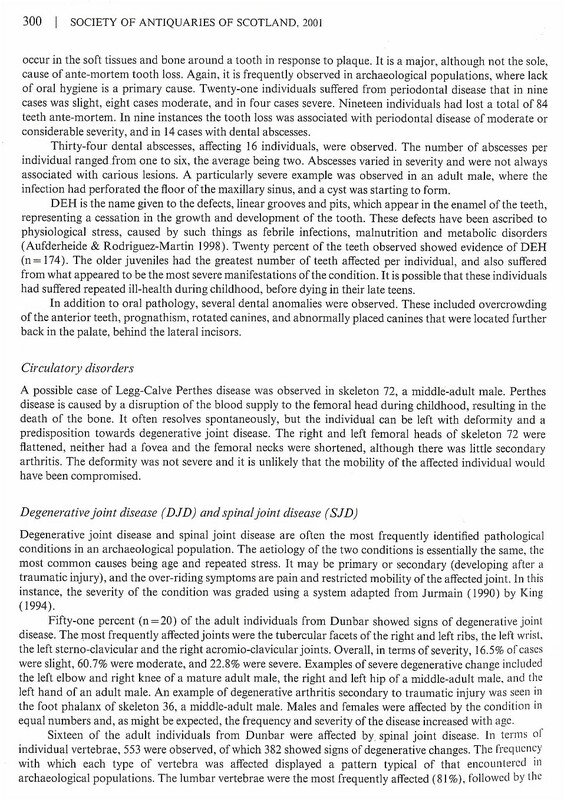 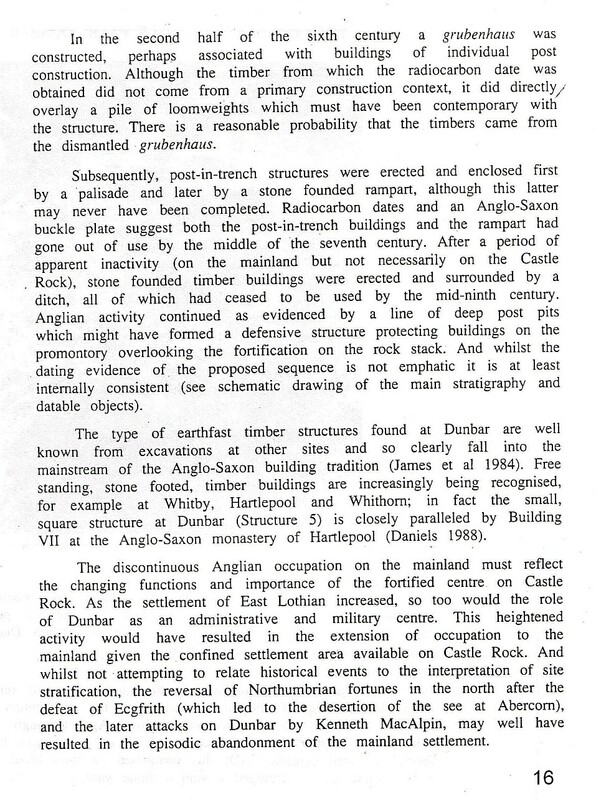 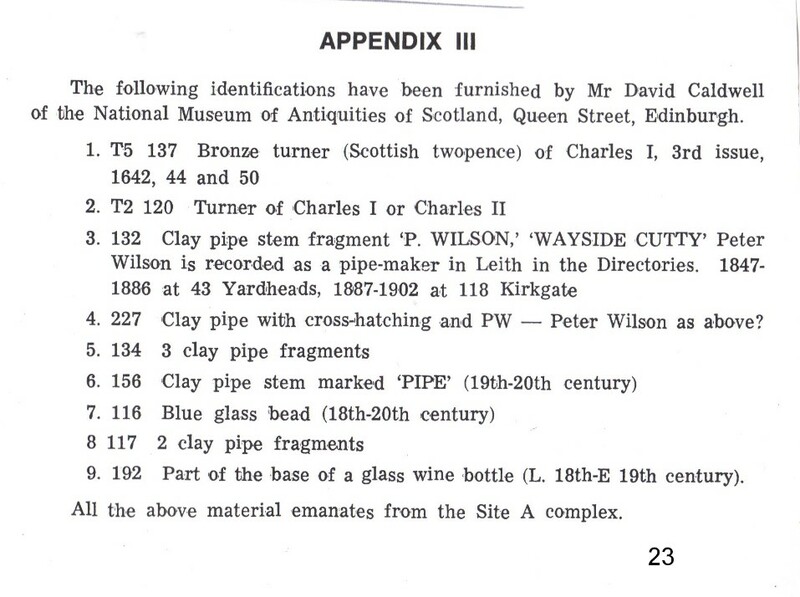 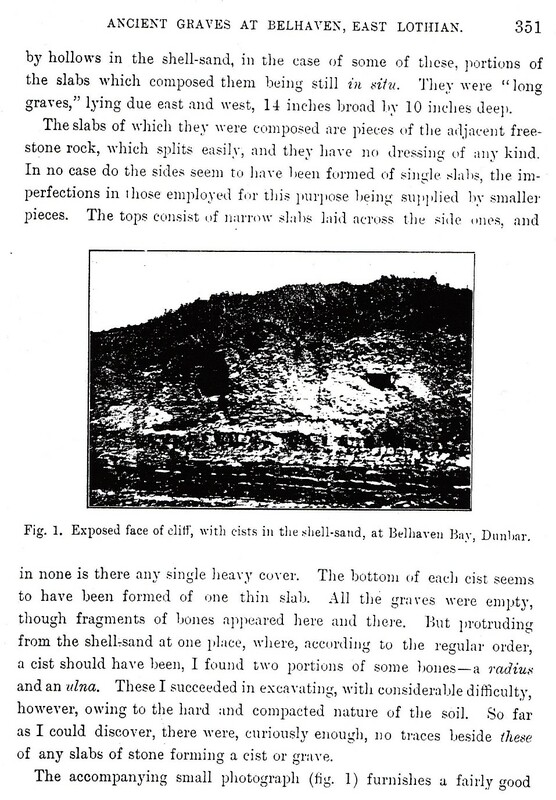 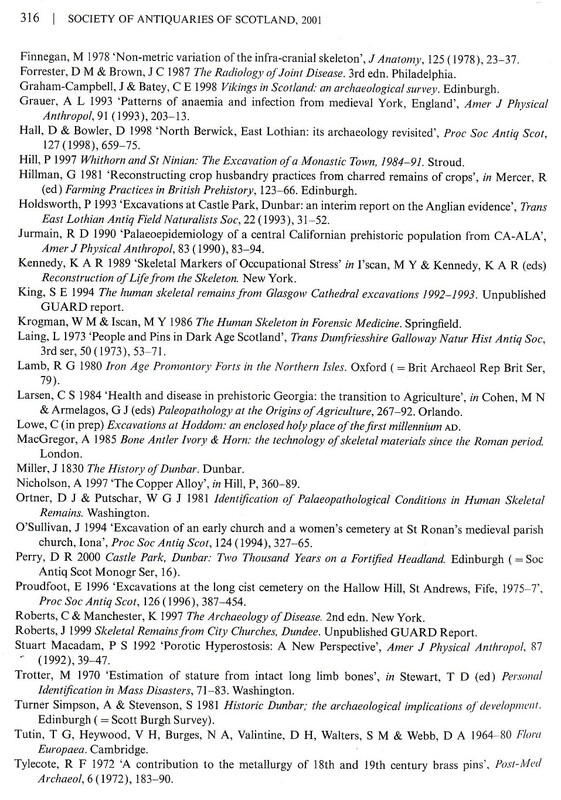 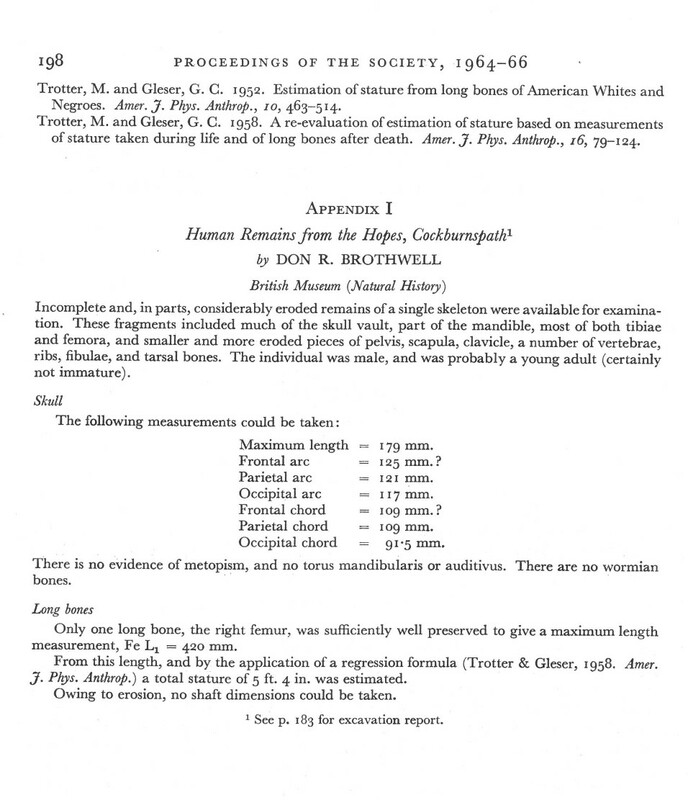 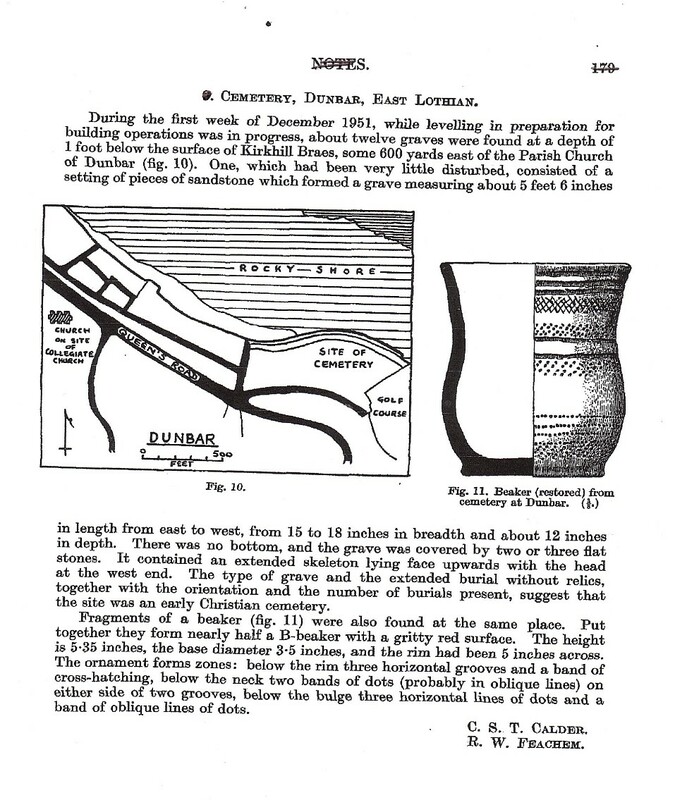 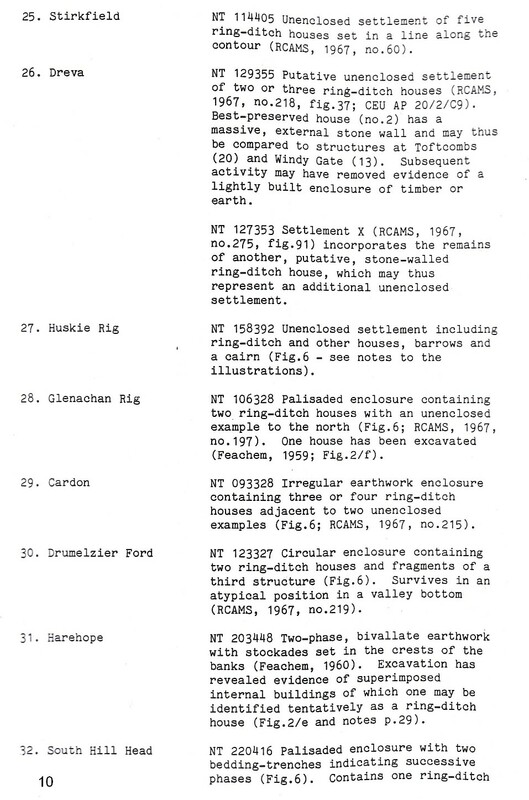 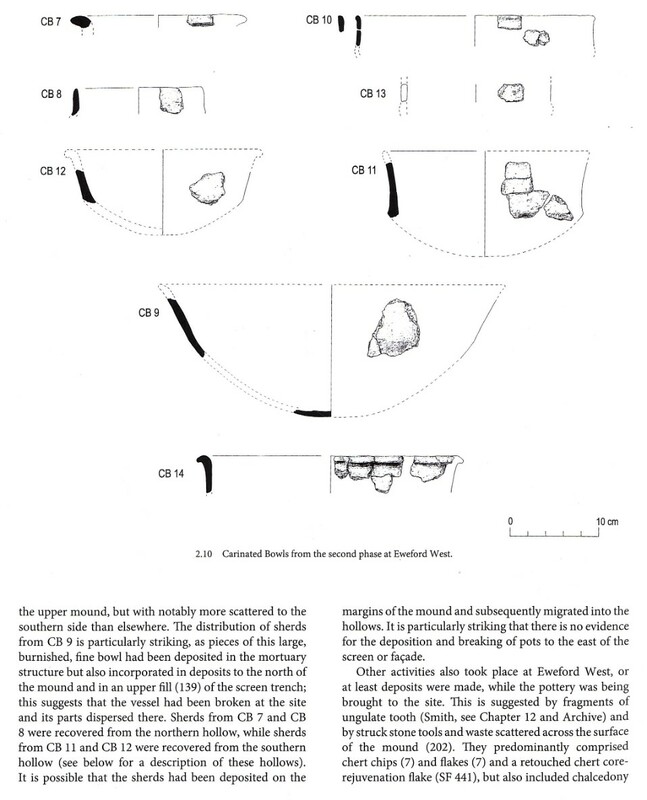 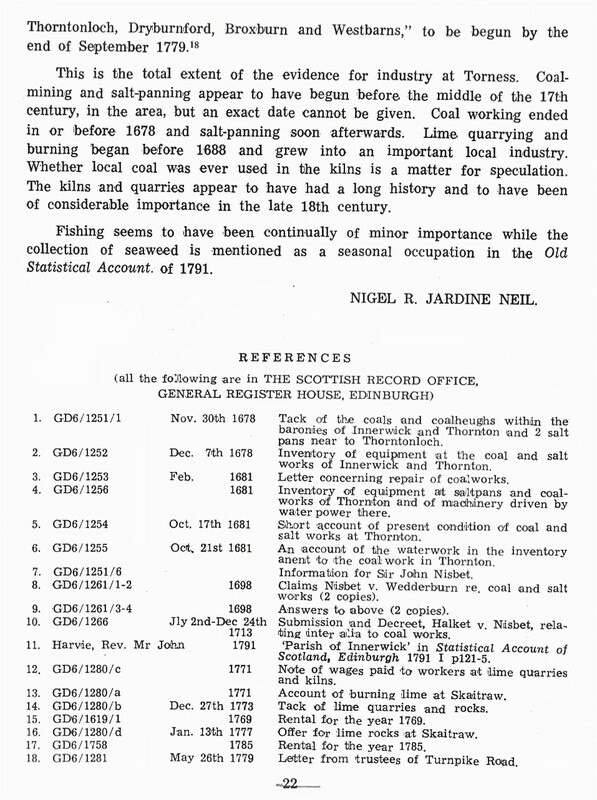 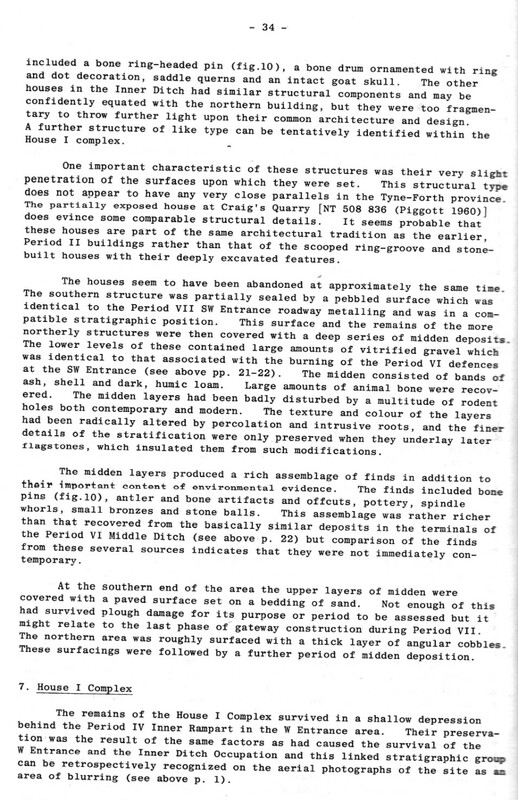 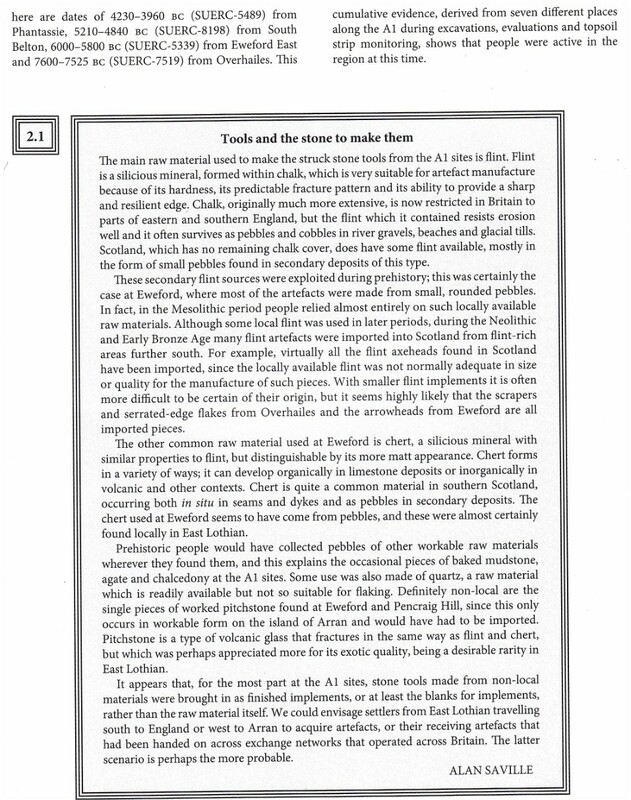 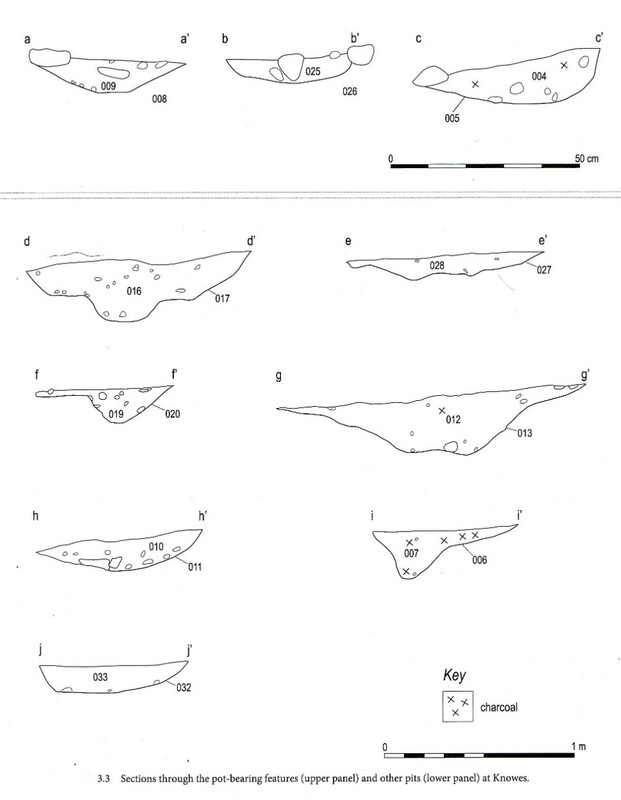 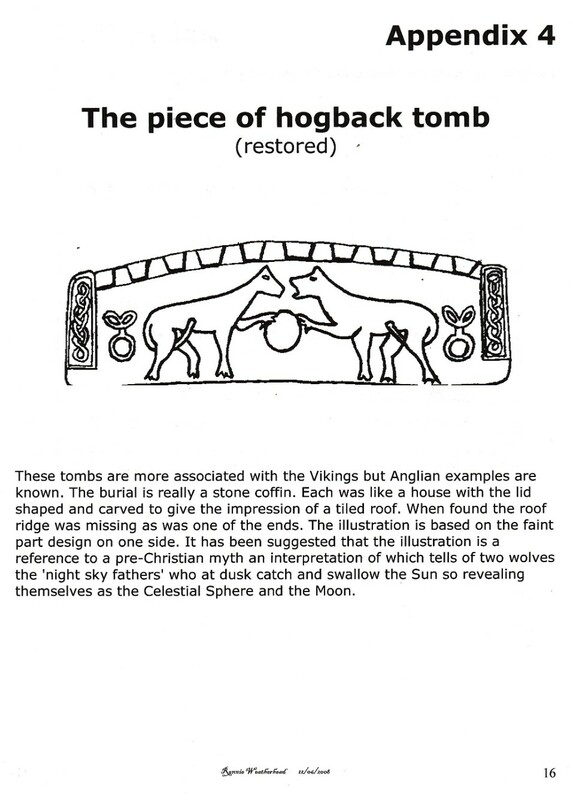 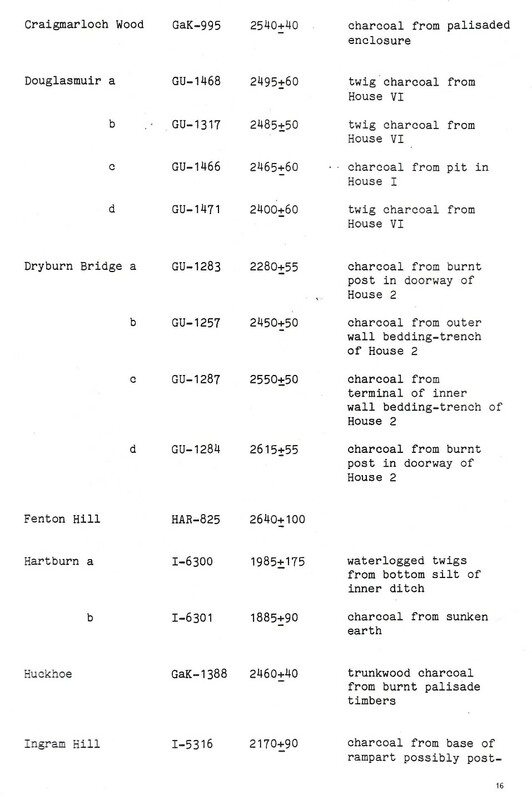 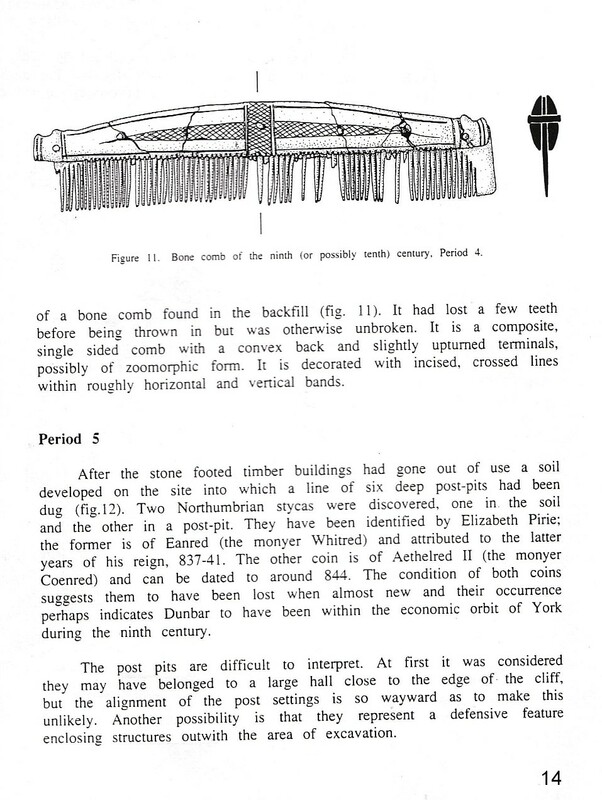 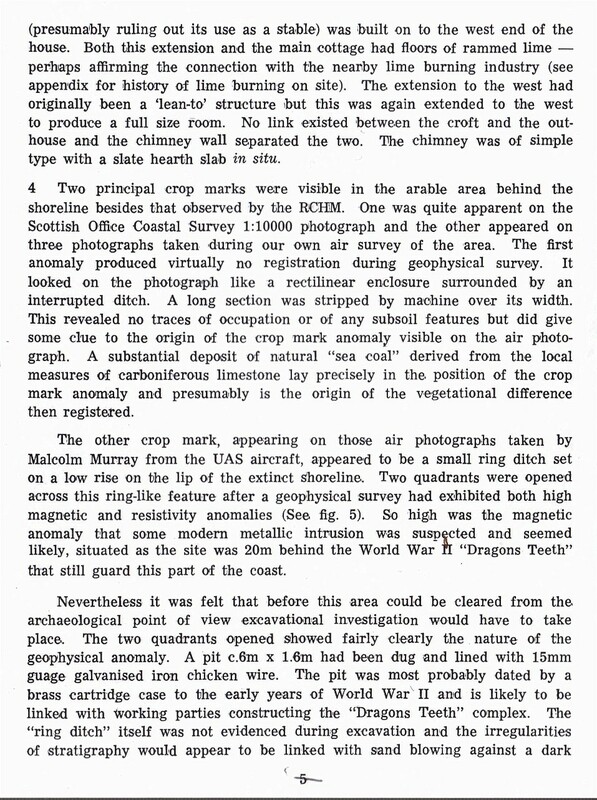 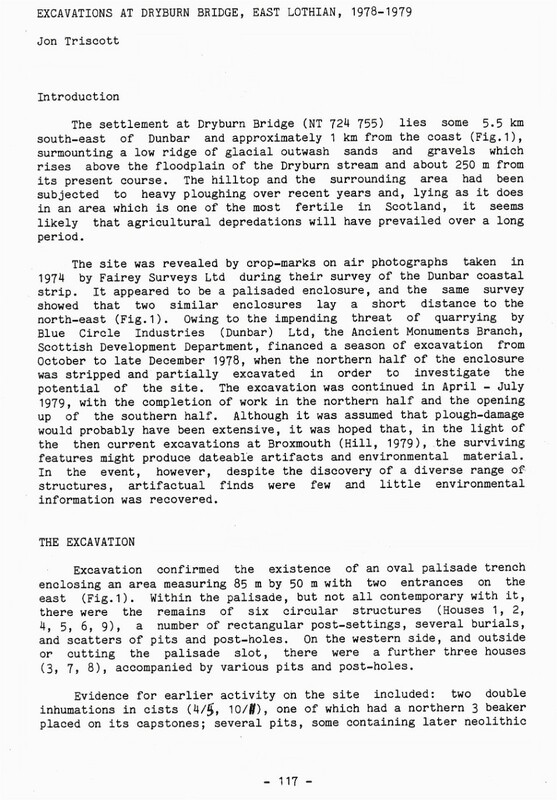 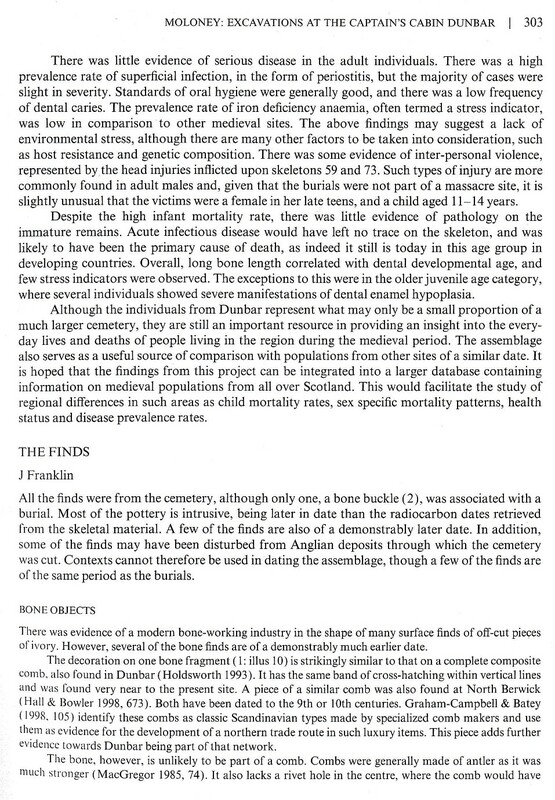 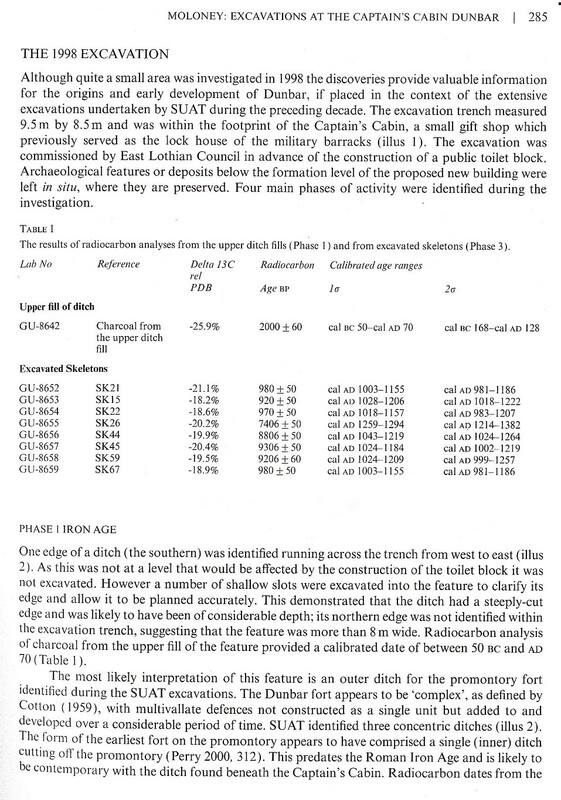 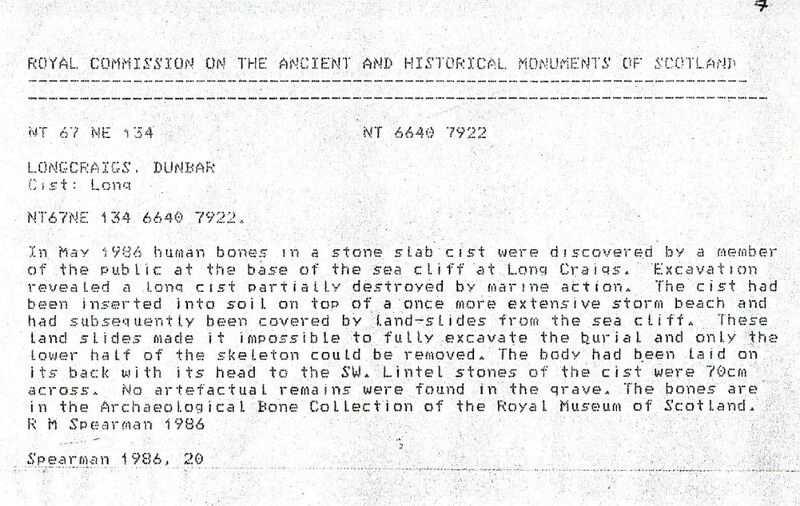 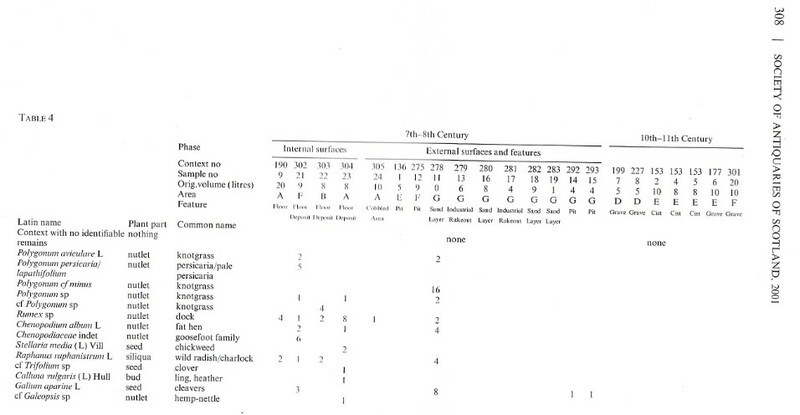 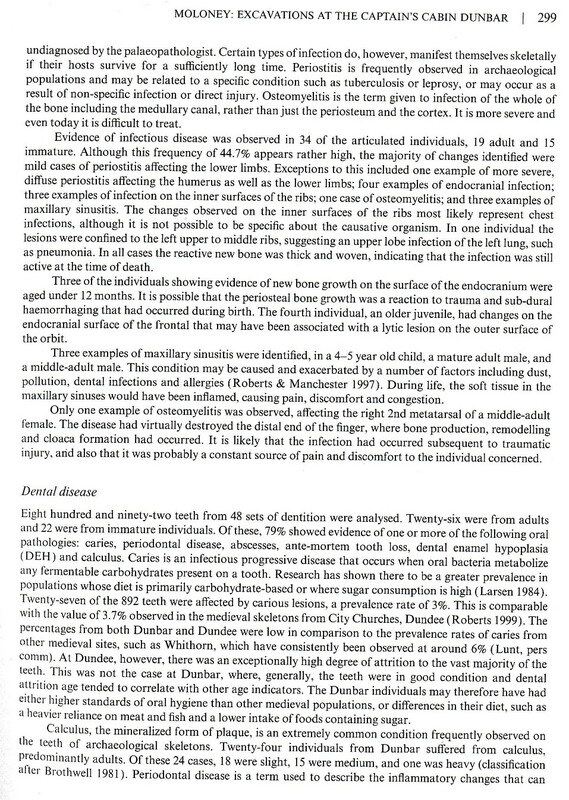 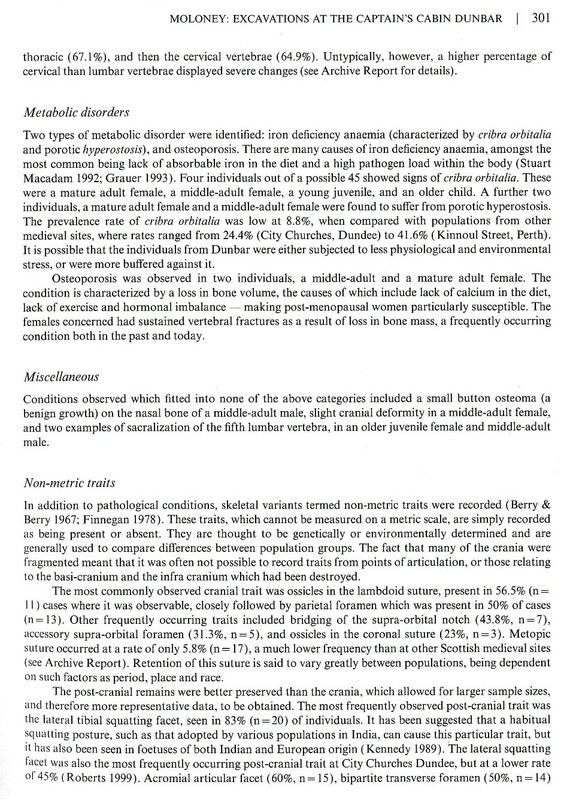 In addition to the cists style burials described above, and throughout His 1 archaeology +, His 2, and the Kirk yard, there has been over the last 150+ years numerous cists uncovered in the Dunbar area when more relevant data becomes available we will upload it to our Yola site but for the present please find sketchy details below in the form of a short catalogue of this type of burial whether solitary, in a group, or indeed part of a “cemetery”. 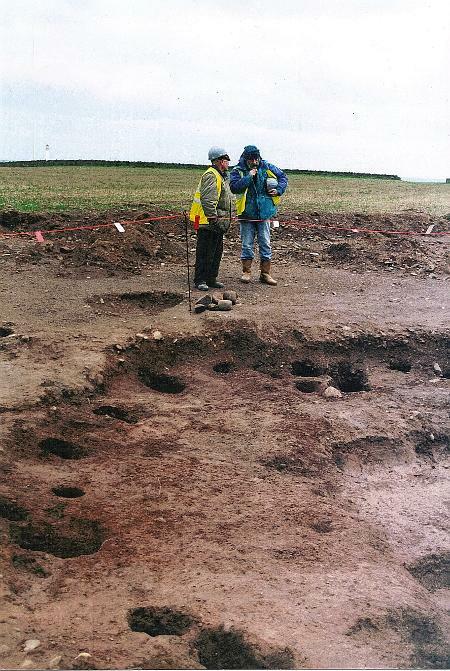 ASHFIELD: a cist was uncovered during railway building in the 1840’s. 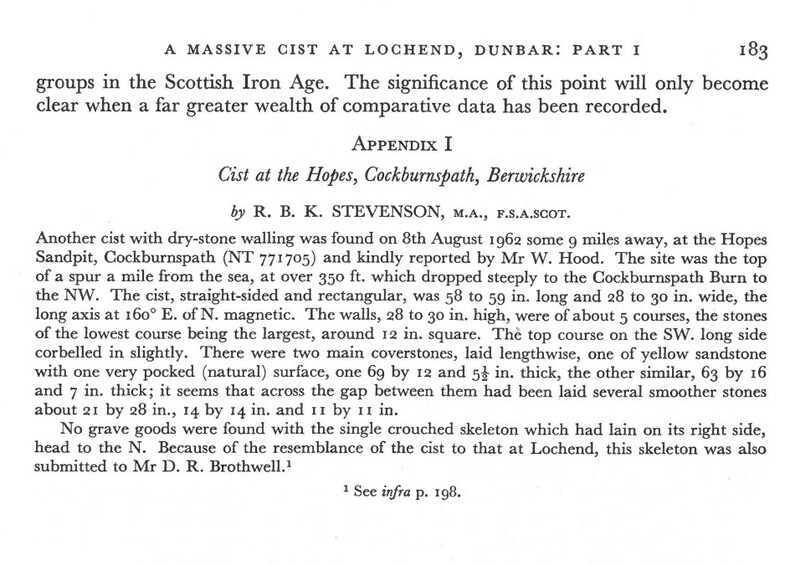 BAYSWELL ROAD: A small number found in the manse grounds c1900. 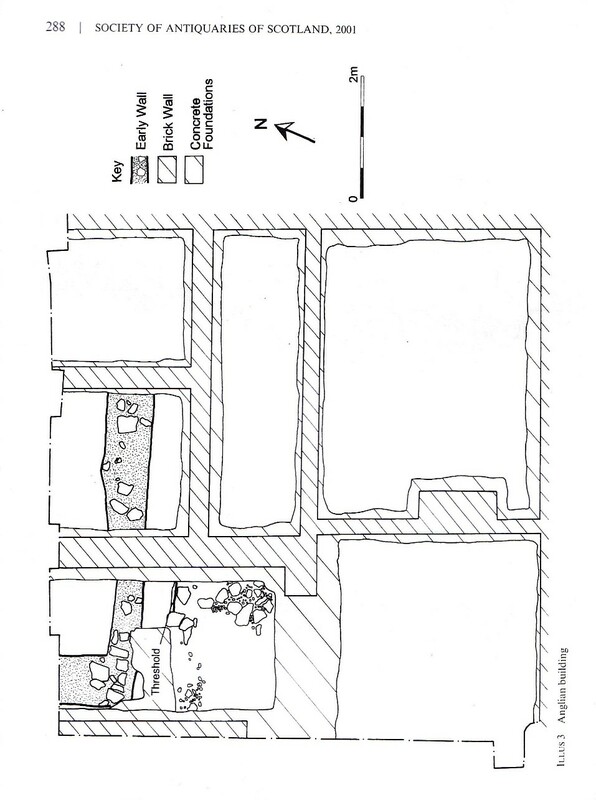 BELLEVUE: During the building of the hotel in the 1890s one was uncovered. 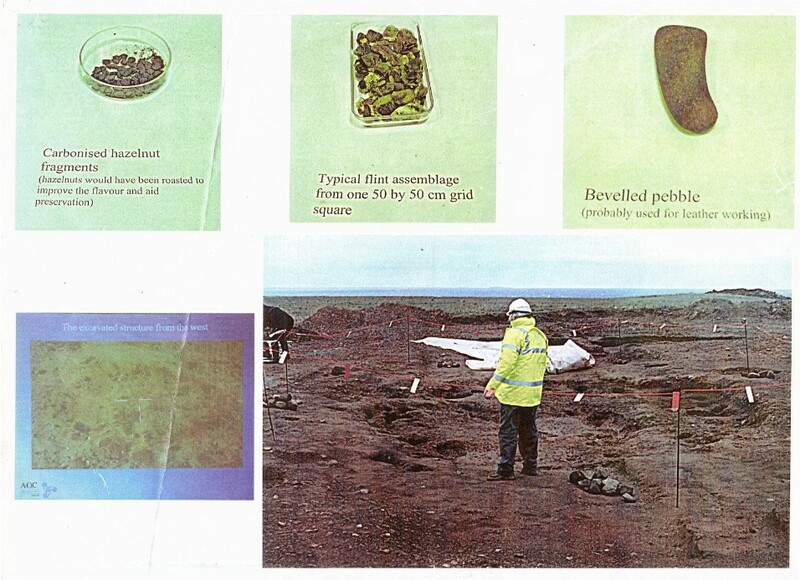 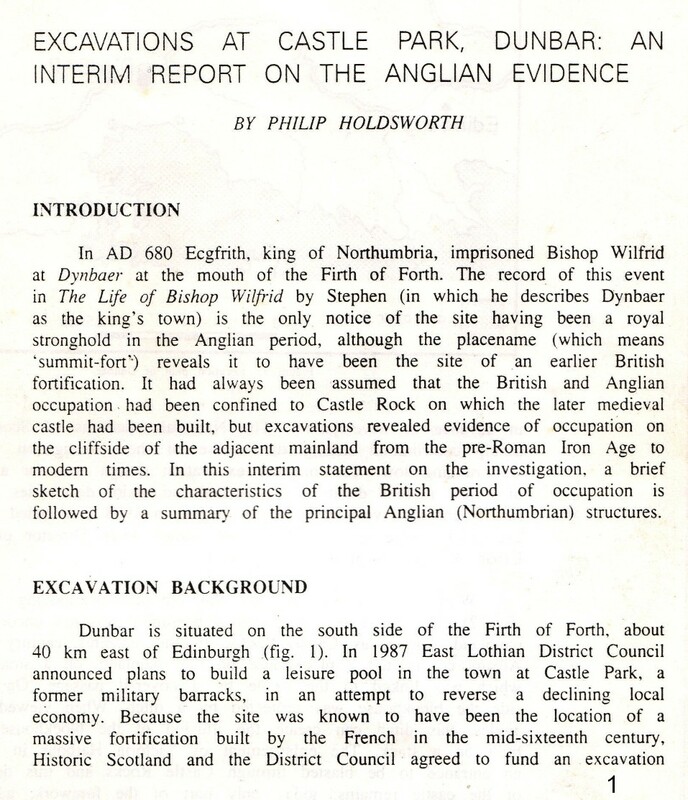 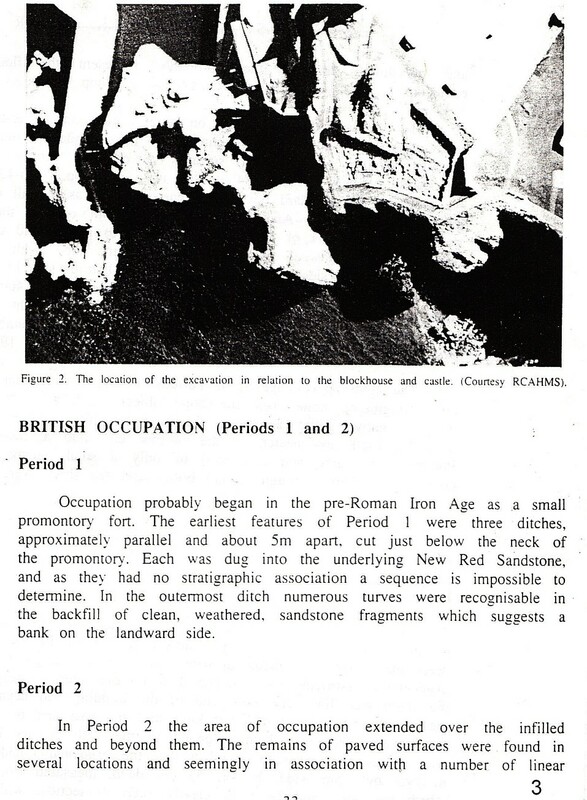 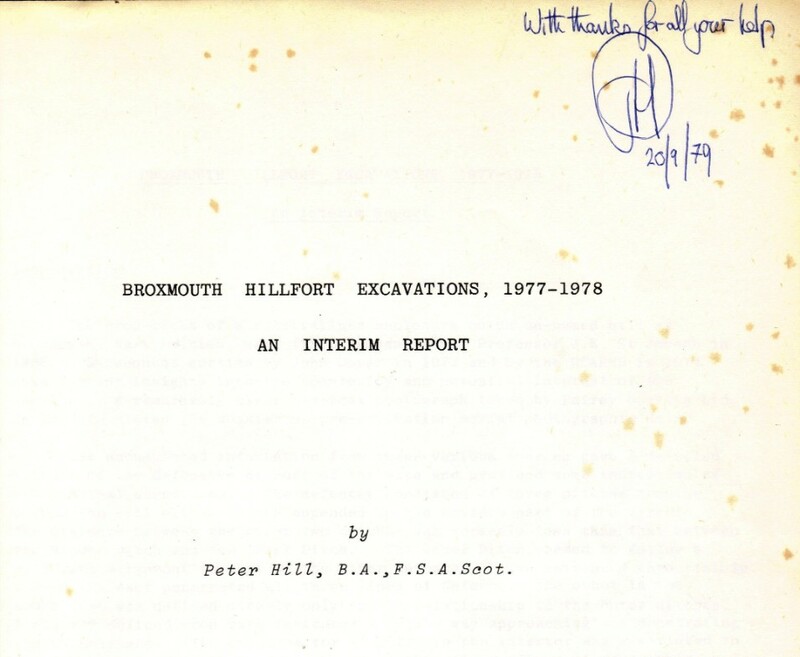 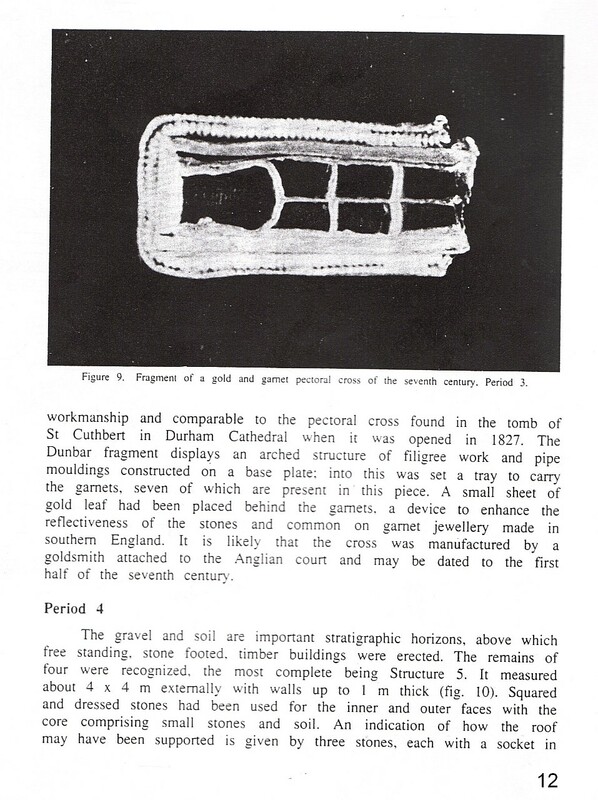 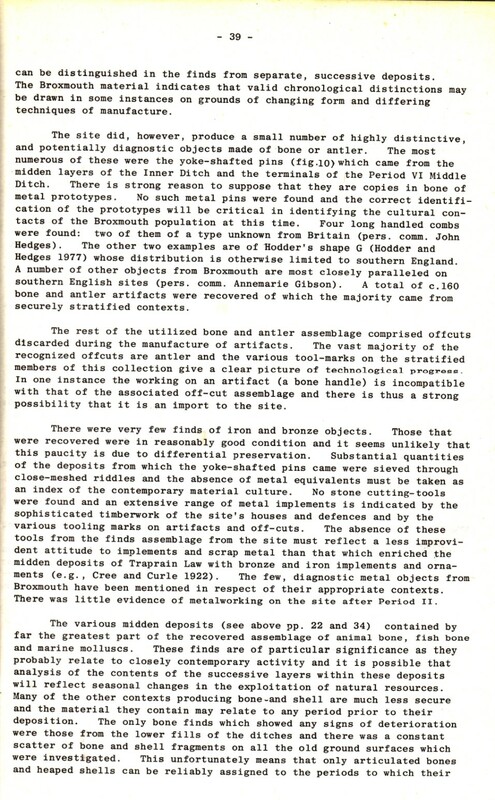 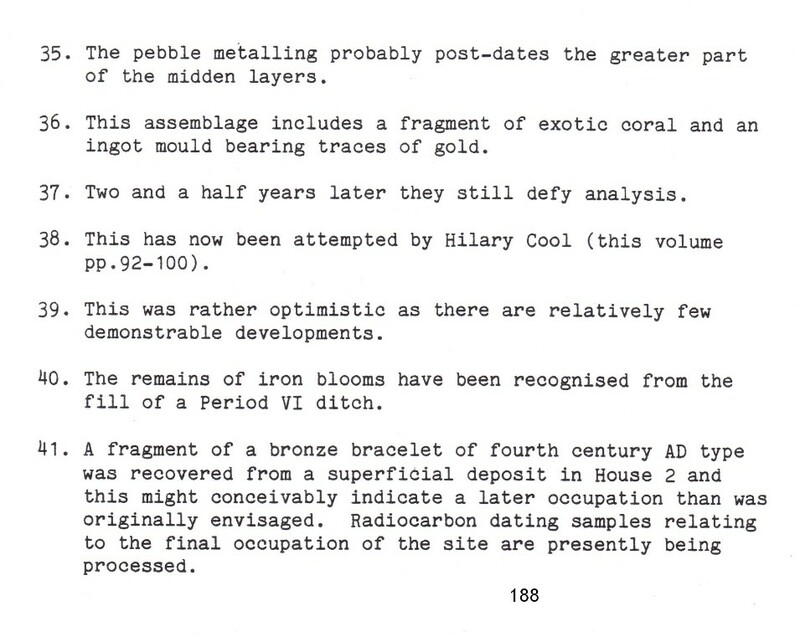 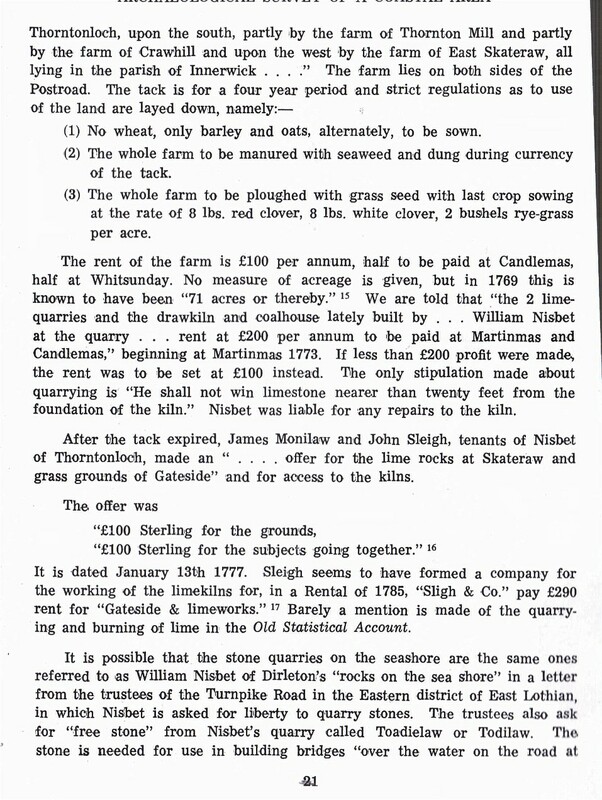 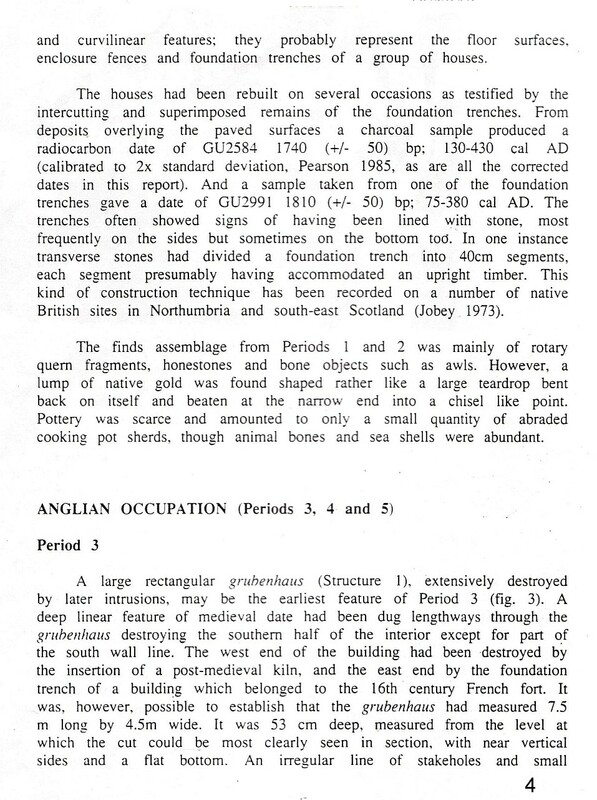 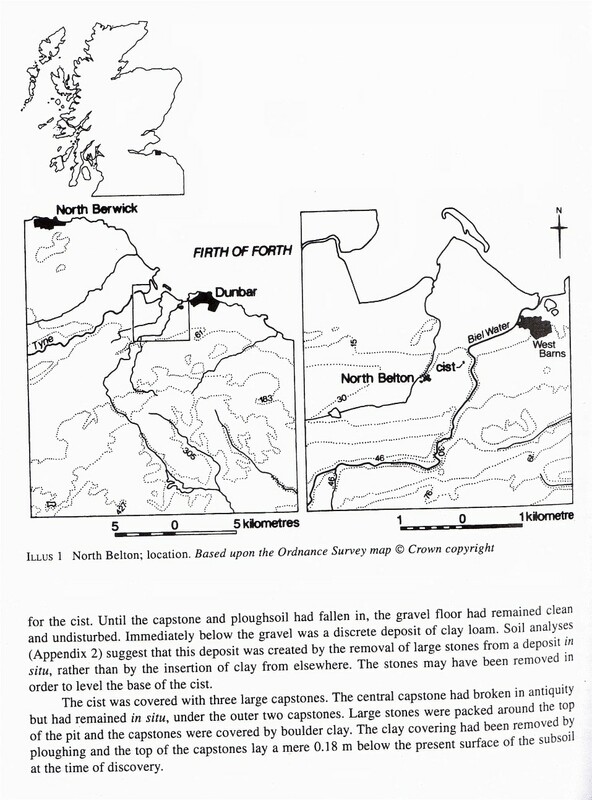 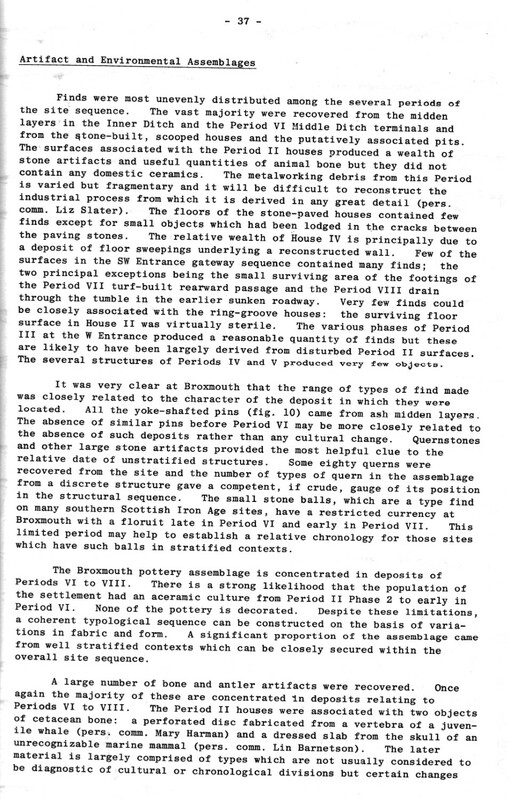 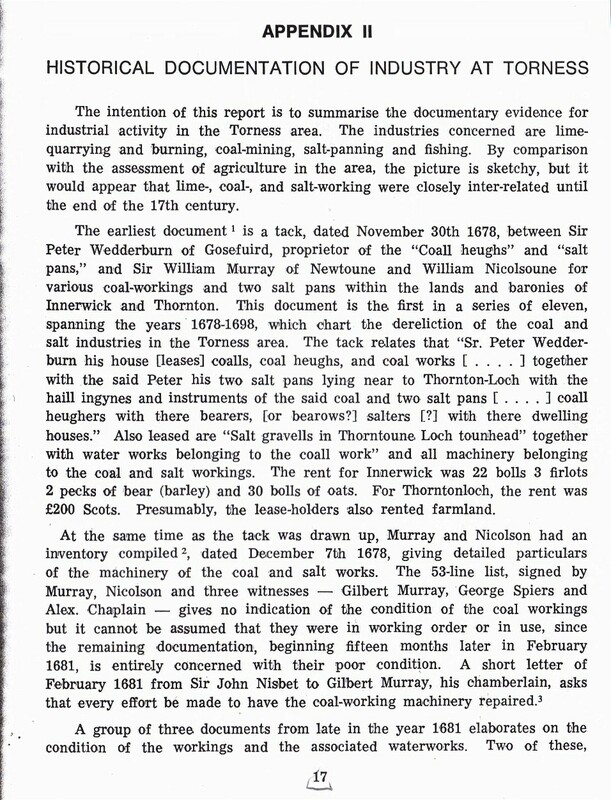 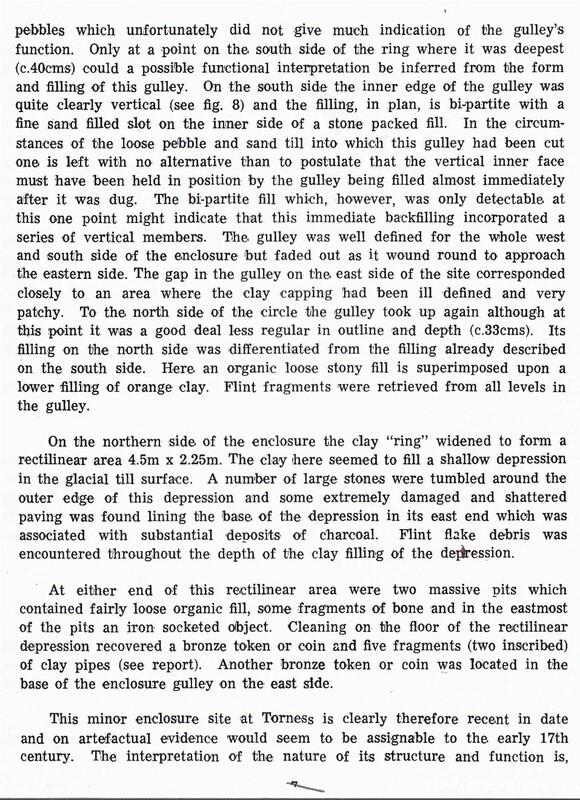 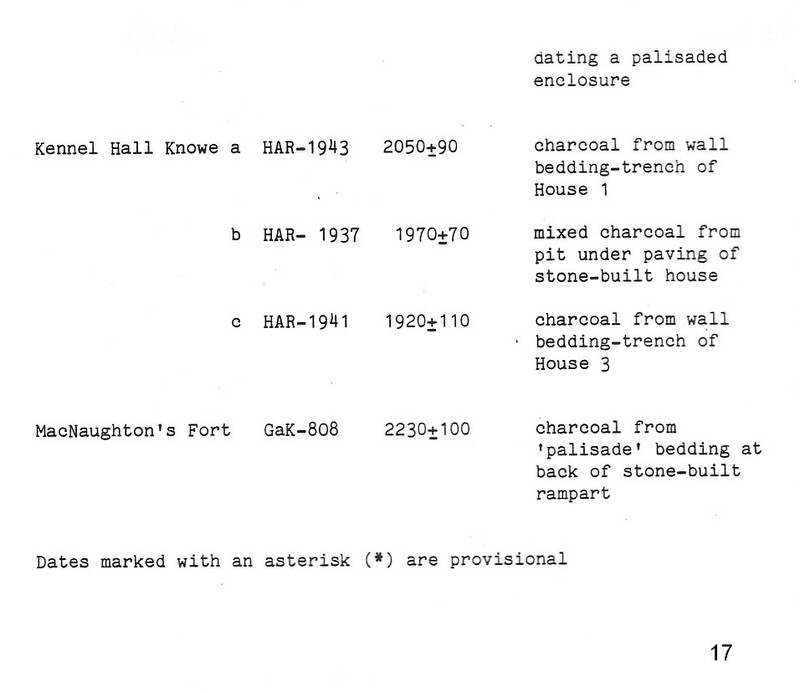 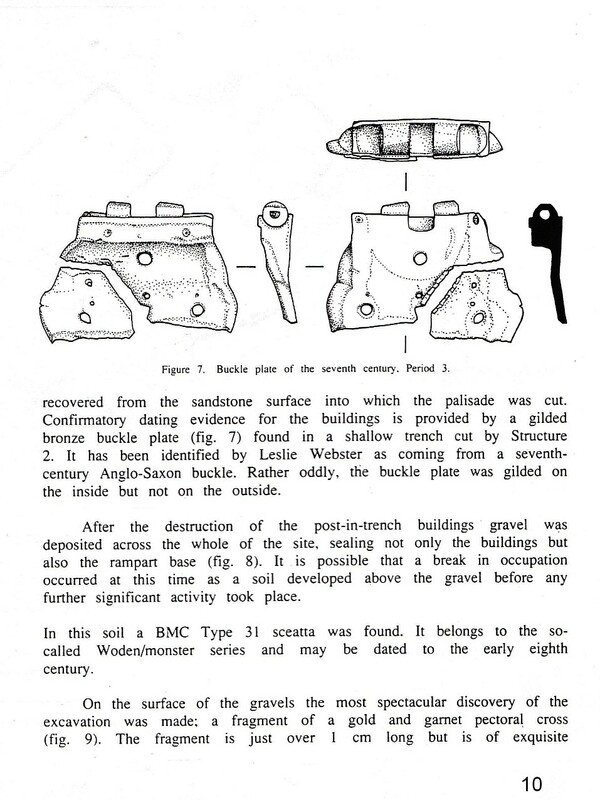 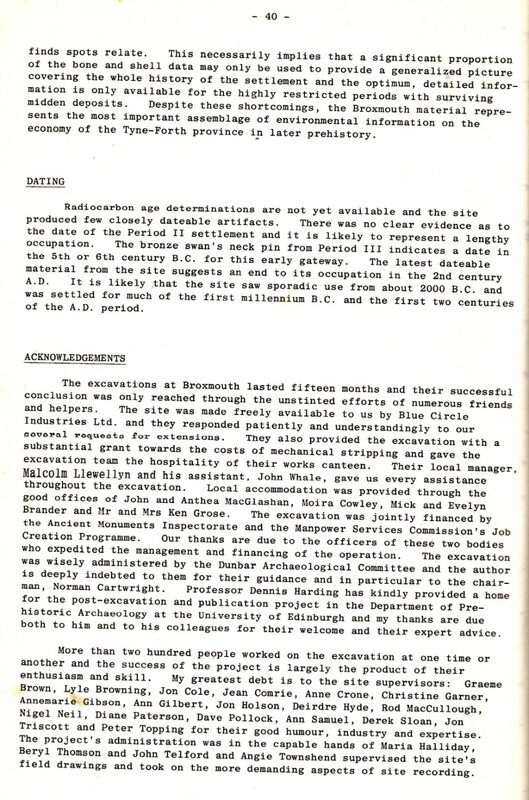 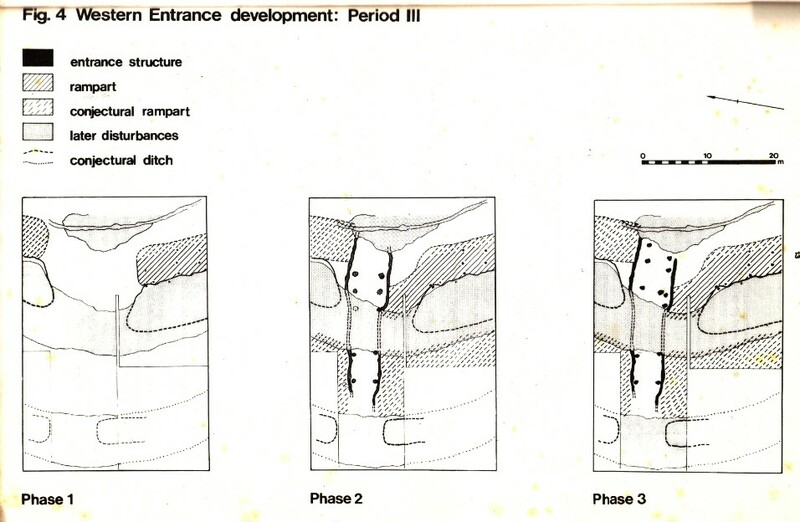 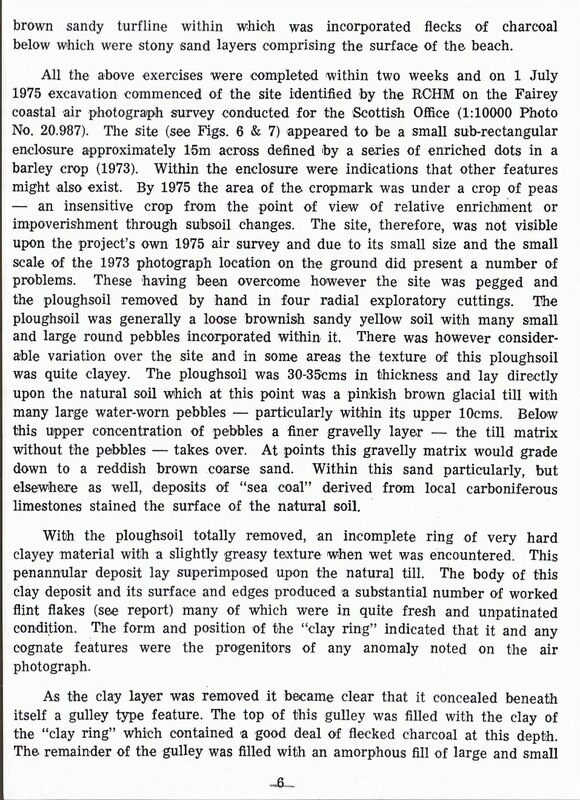 BROXMOUTH PARK: Up to three cists were unearthed during quarrying work at Blue Circle/Lafarge. 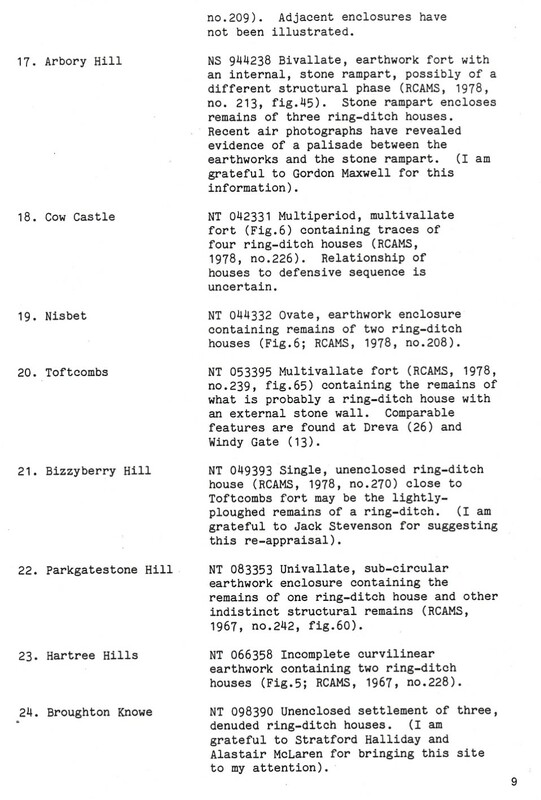 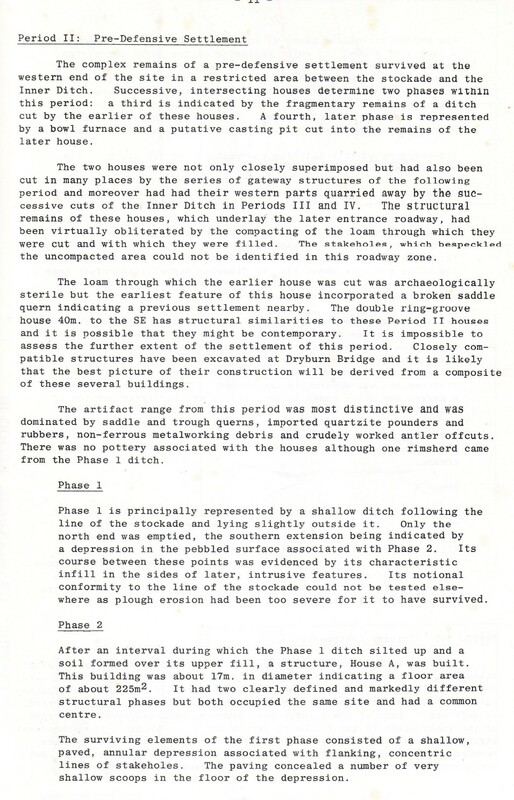 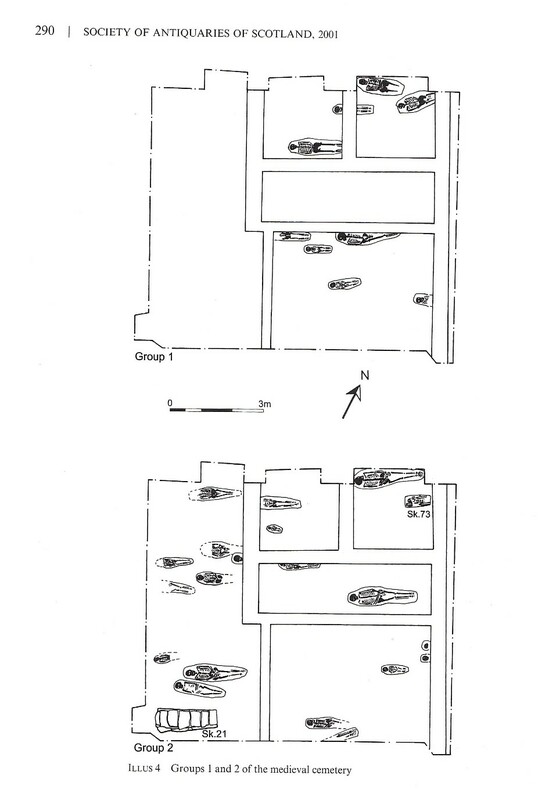 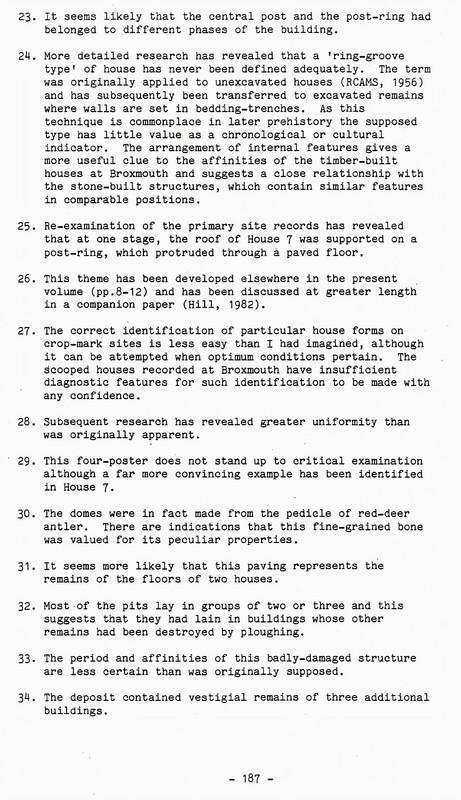 CLYDE VILLAS: 3 cist burials uncovered under floor, in early 1970, in these East Links Cottages. 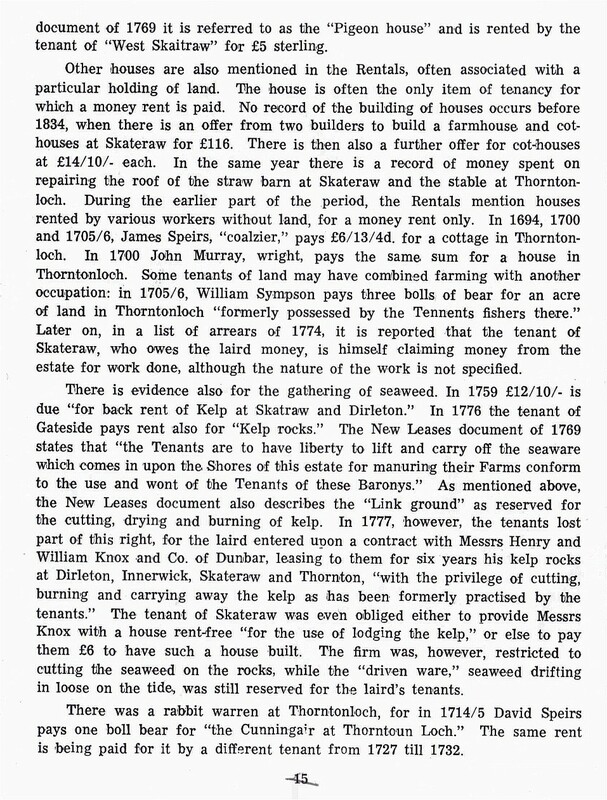 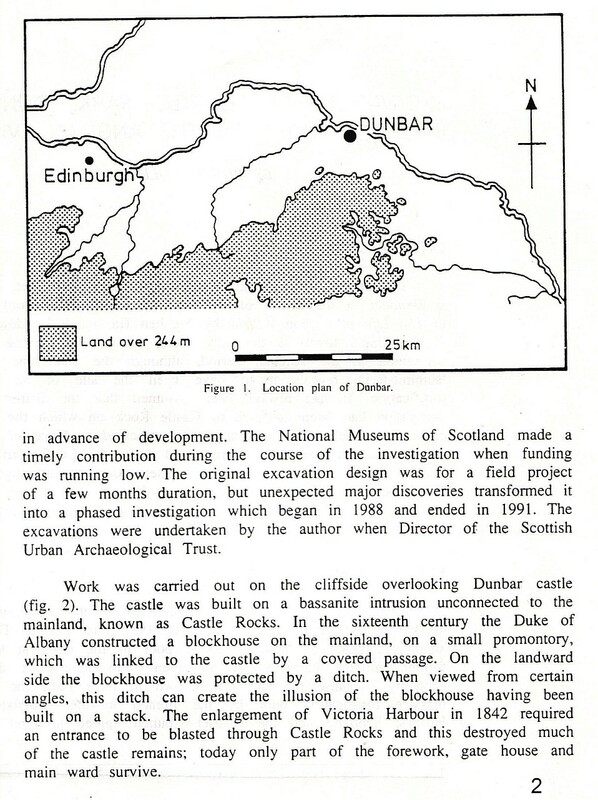 DUNBAR HOUSE: In garden (now Castlepark ) a long cist was unearthed in 1801. 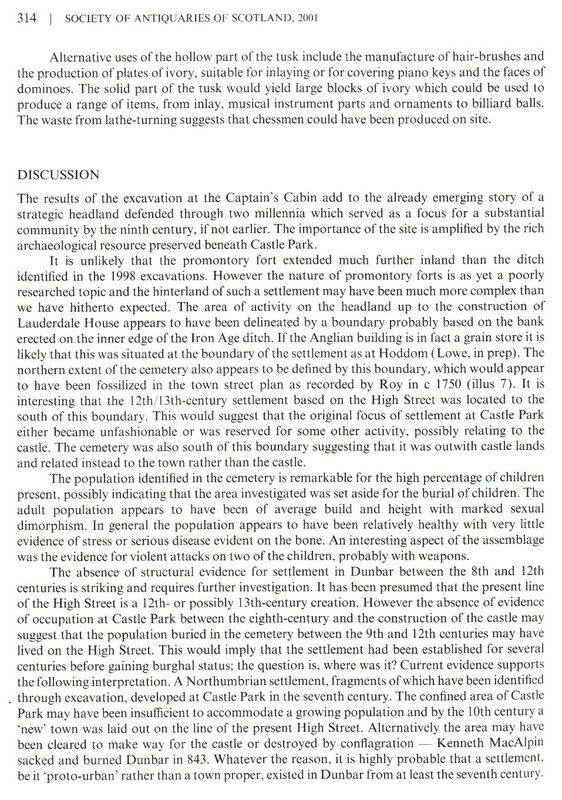 EMPIRE backland High St: A significant warrior grave was discovered during the 1990’s. 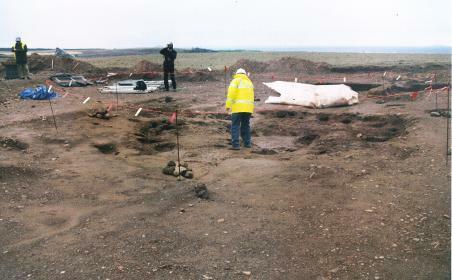 EWEFORD: During building of large storage barn in the 1970’s. 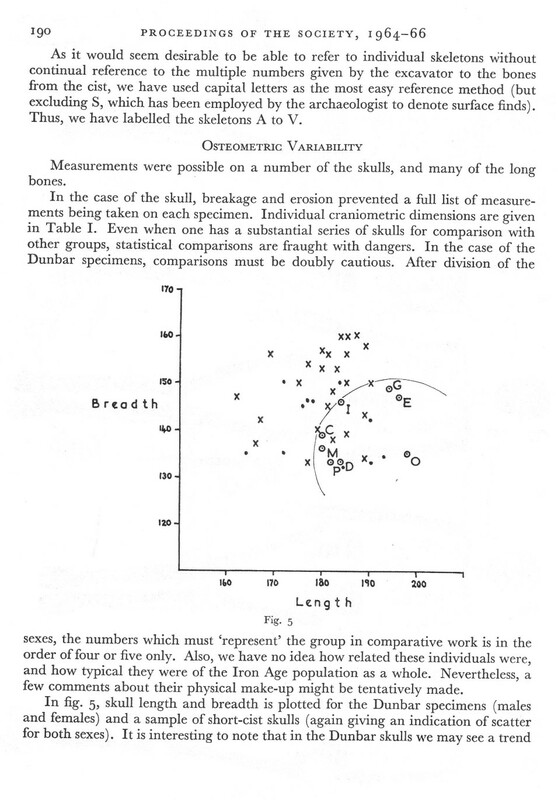 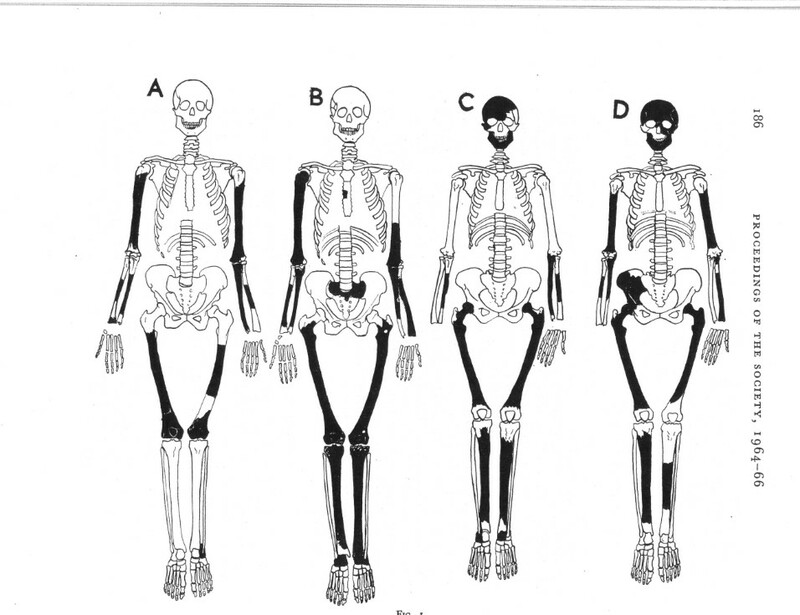 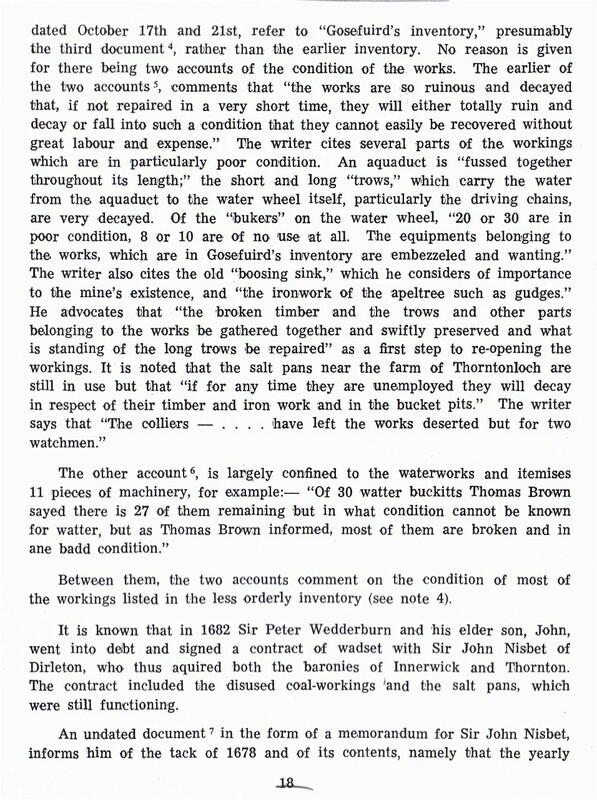 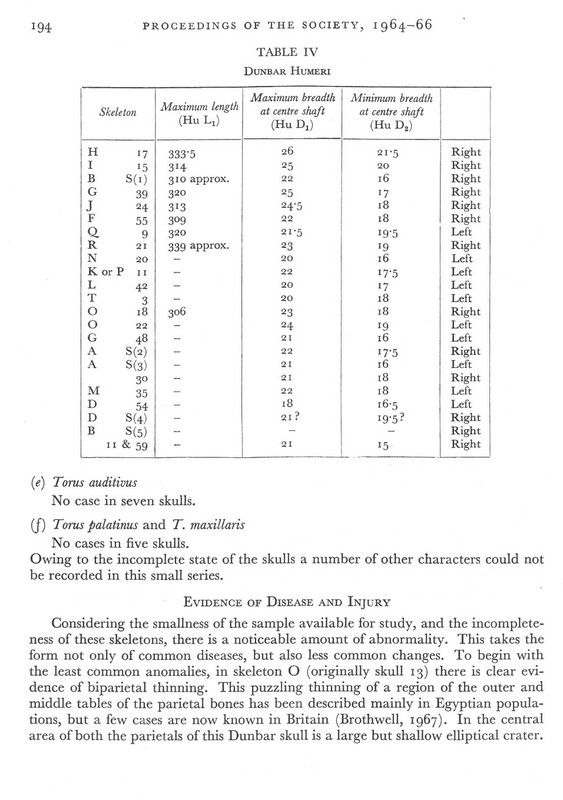 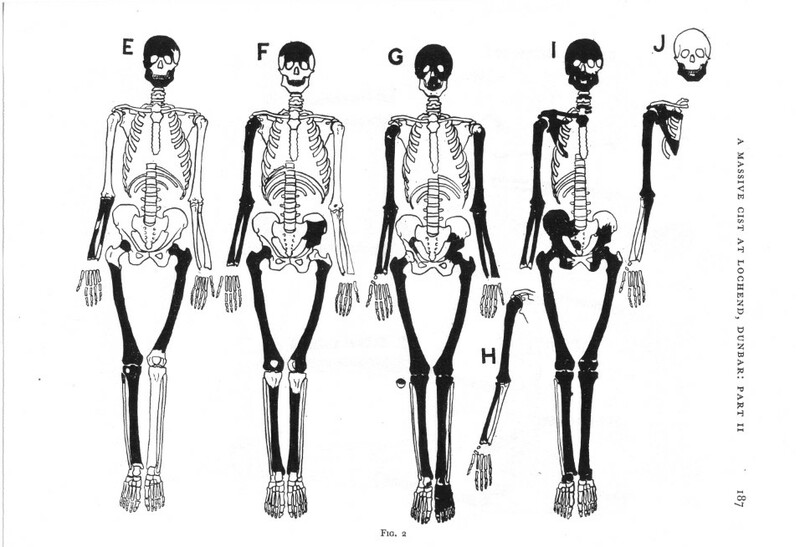 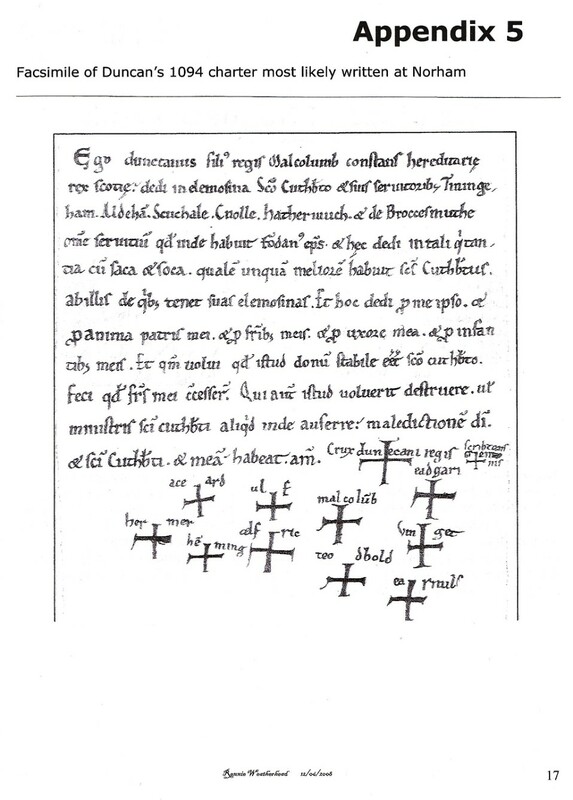 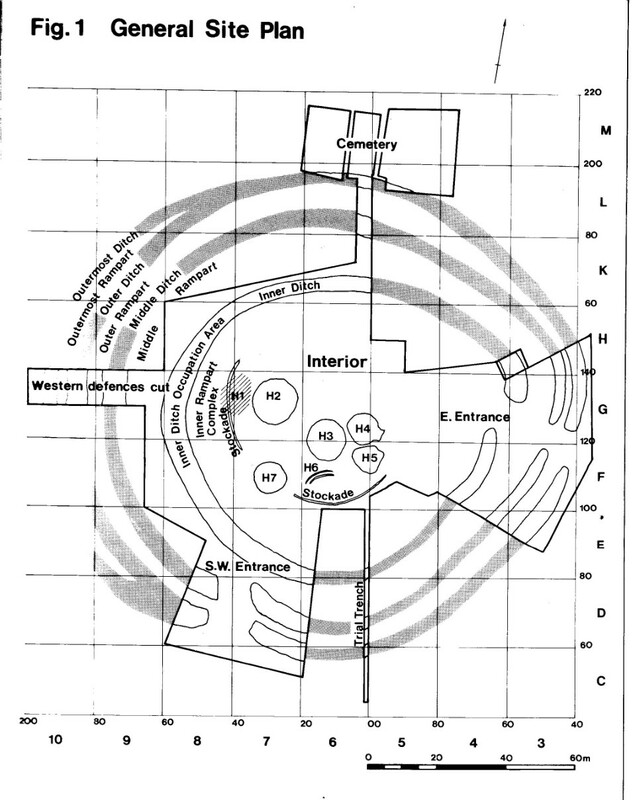 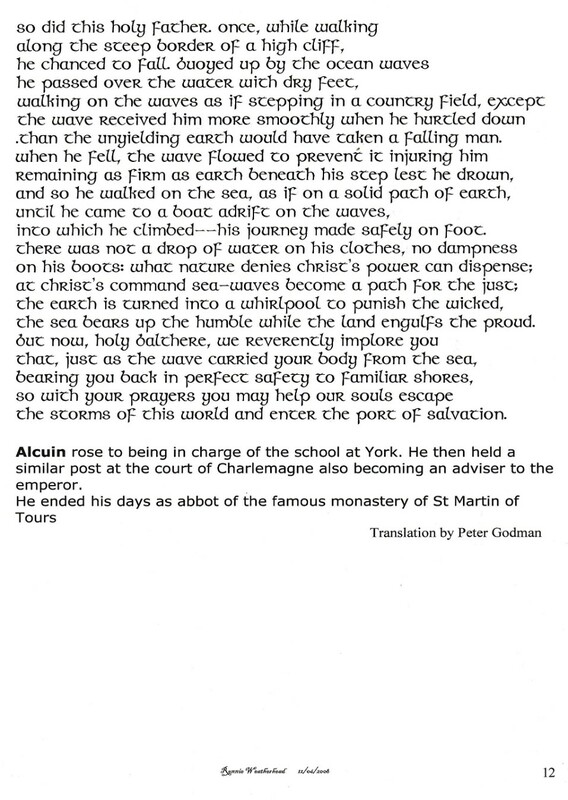 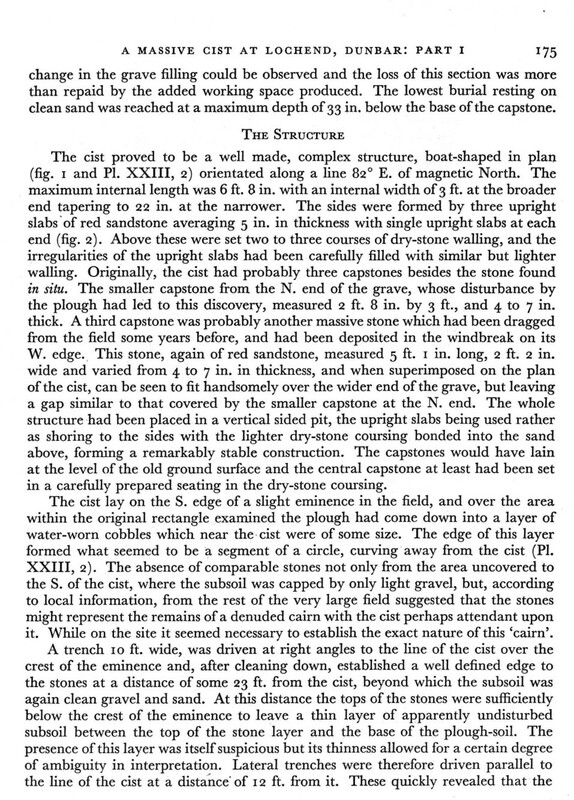 FRIARSCROFT: Several cists ( 7 ) were discovered during building work of Gillespies’flagship. 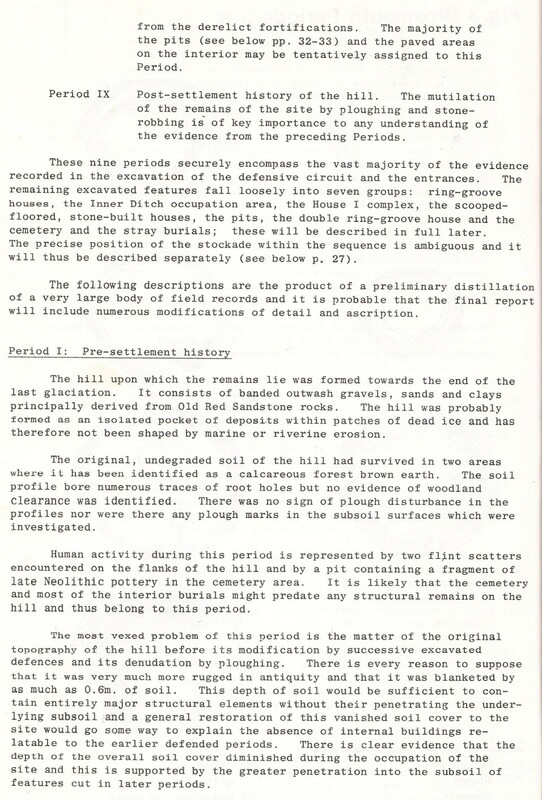 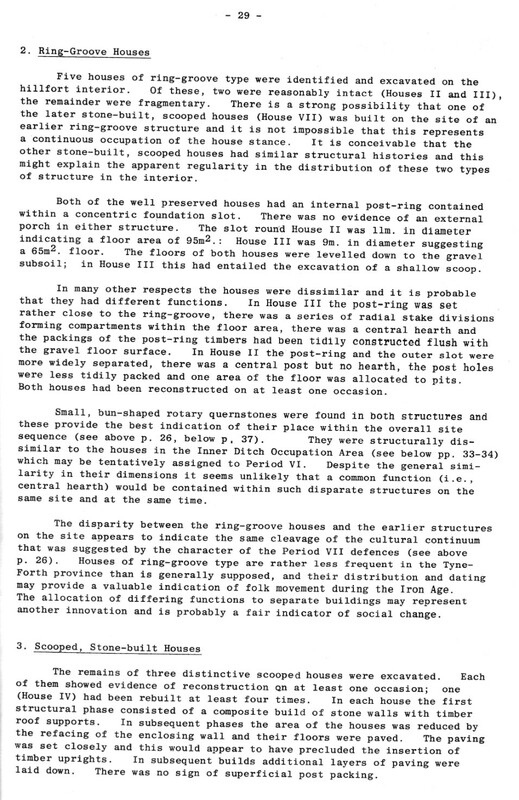 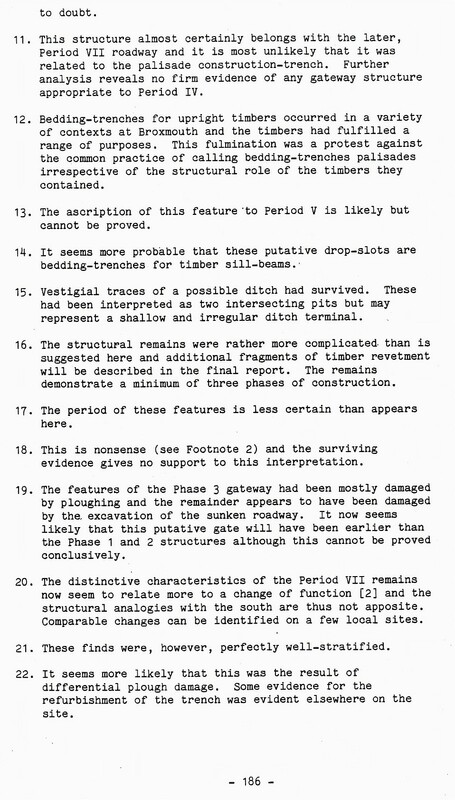 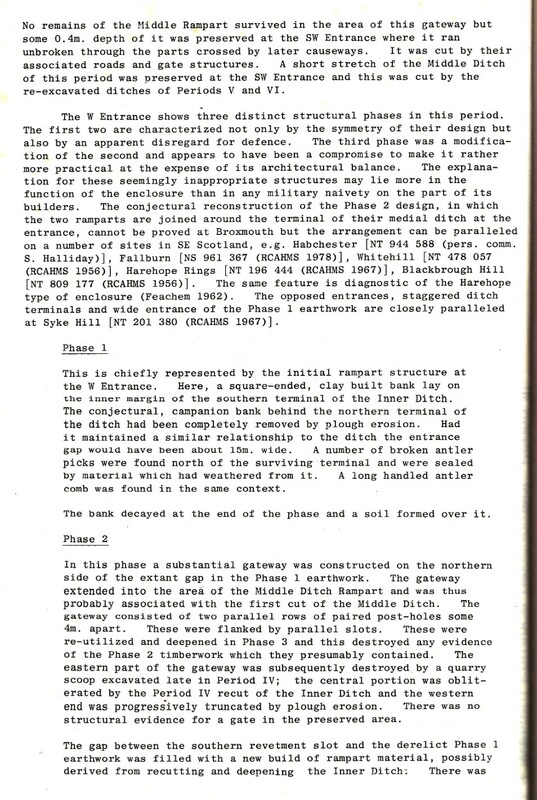 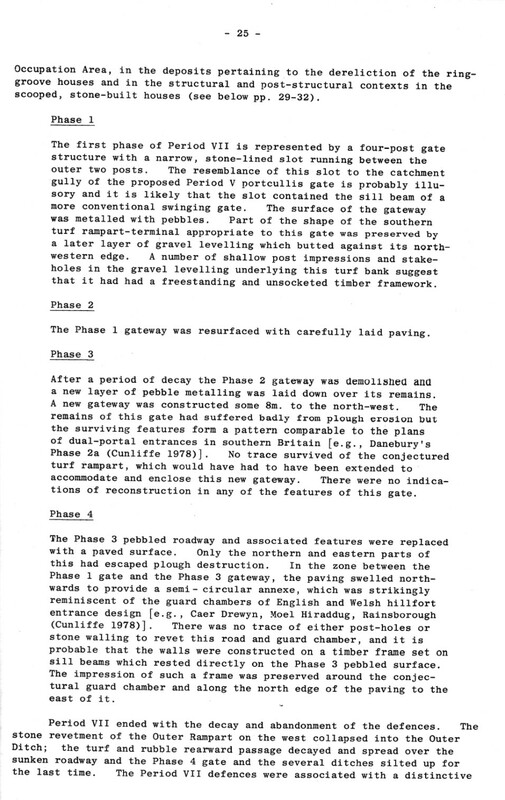 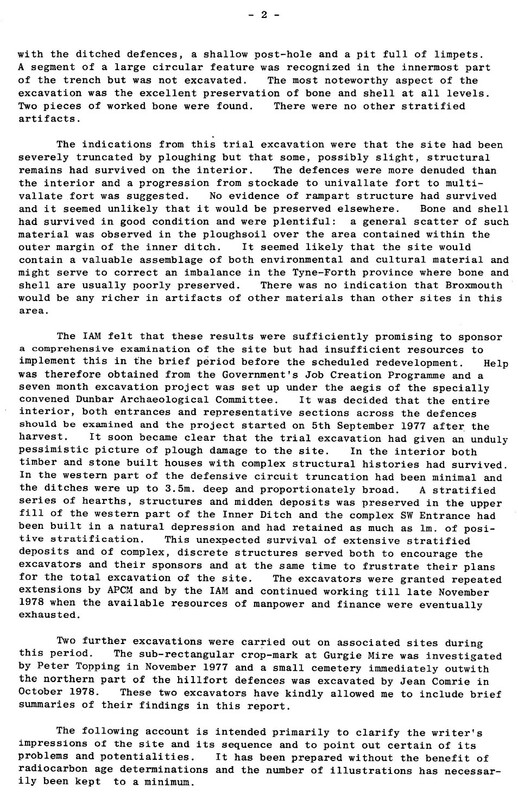 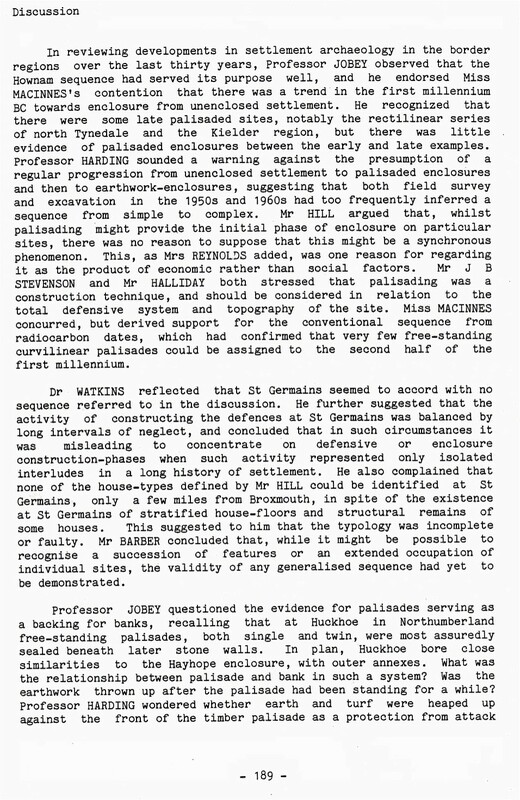 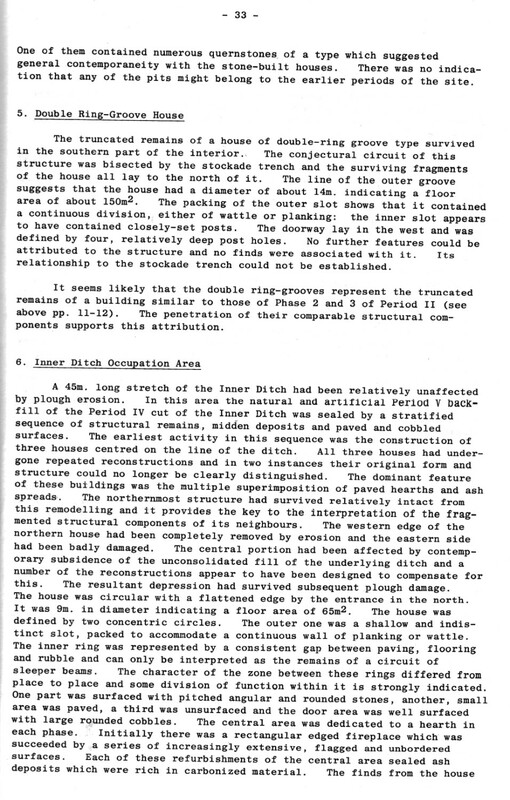 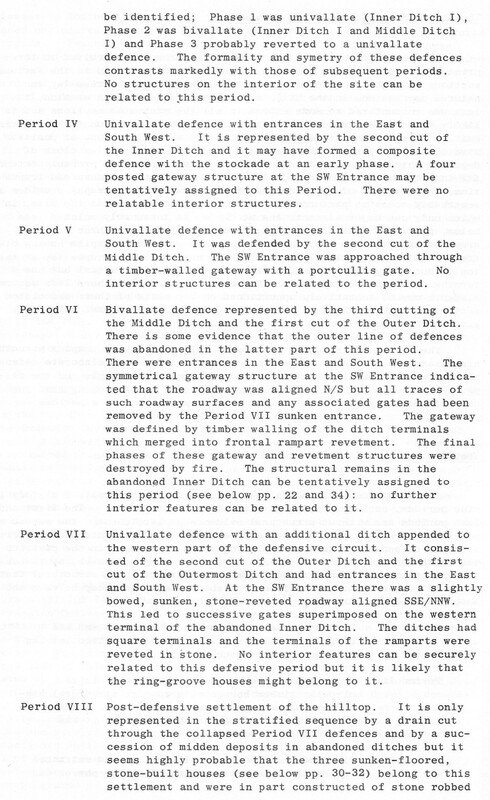 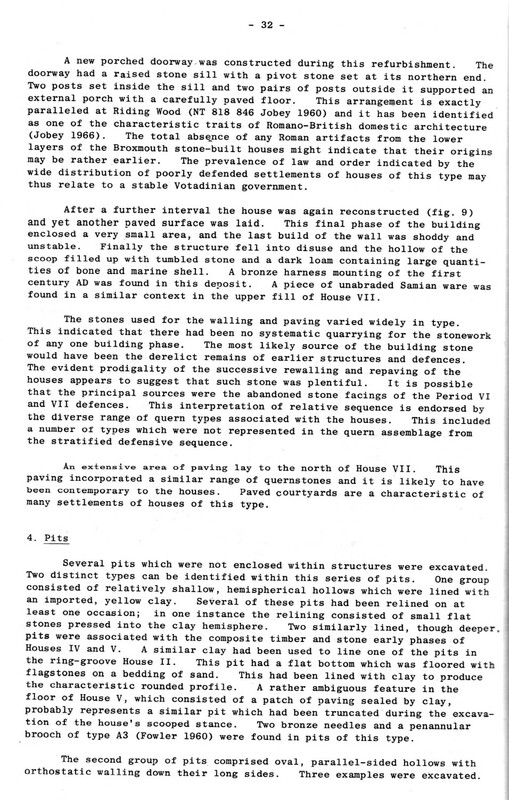 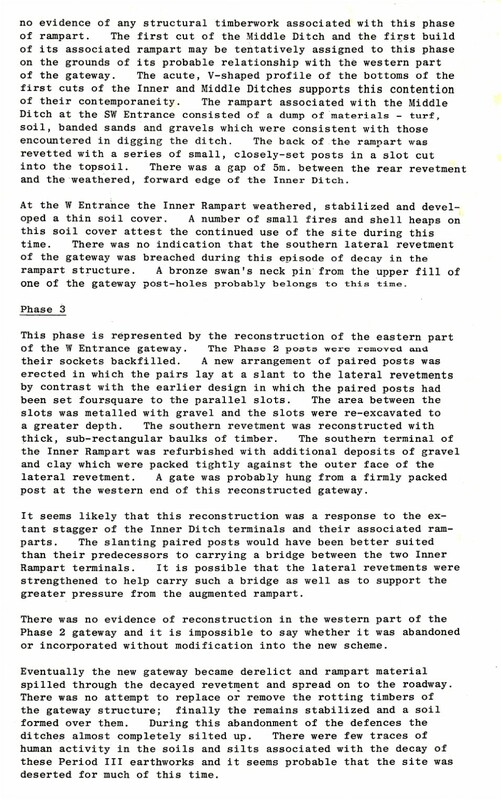 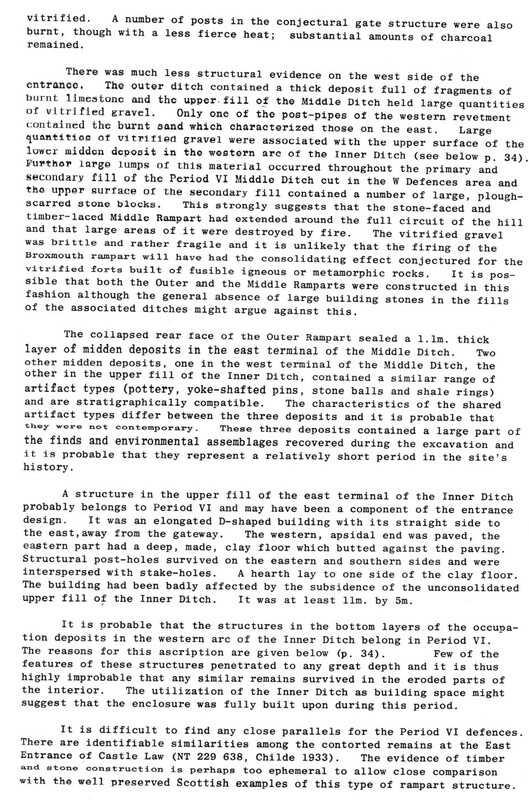 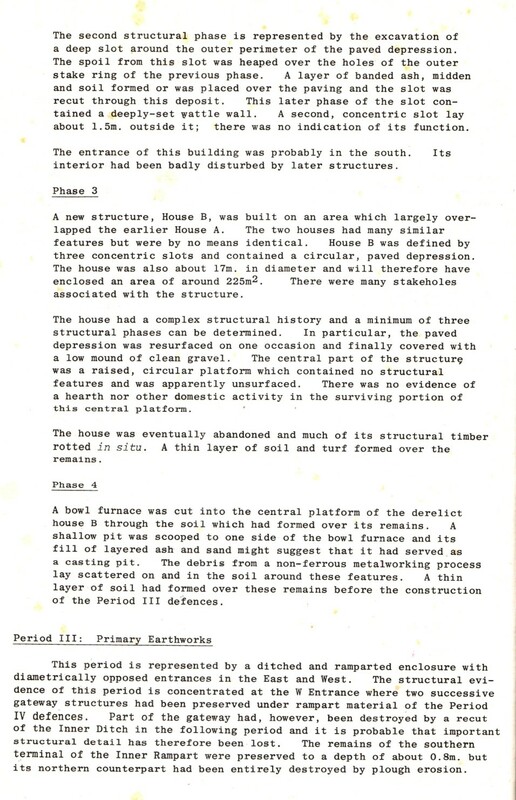 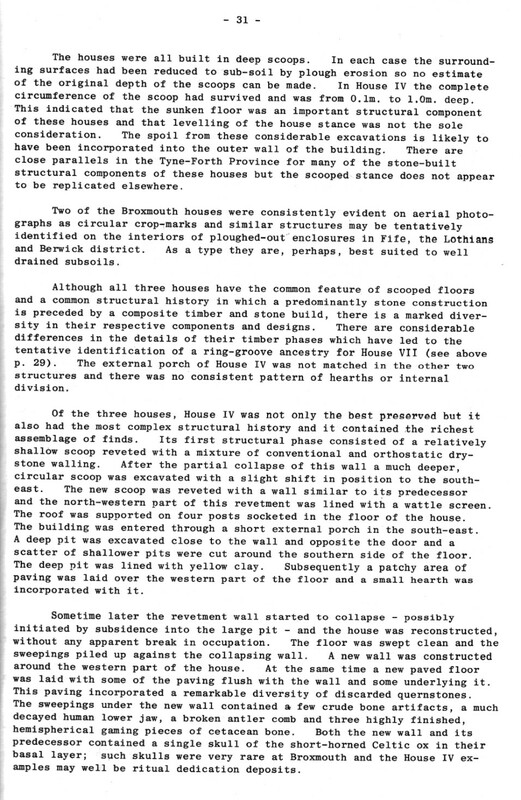 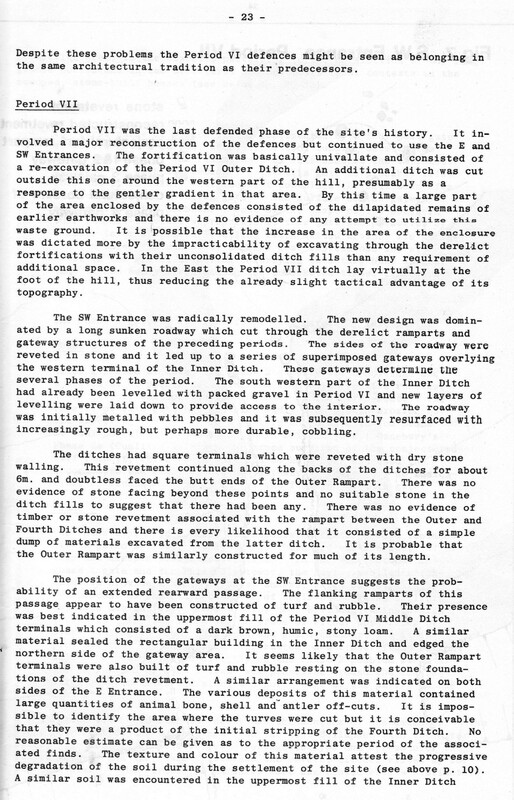 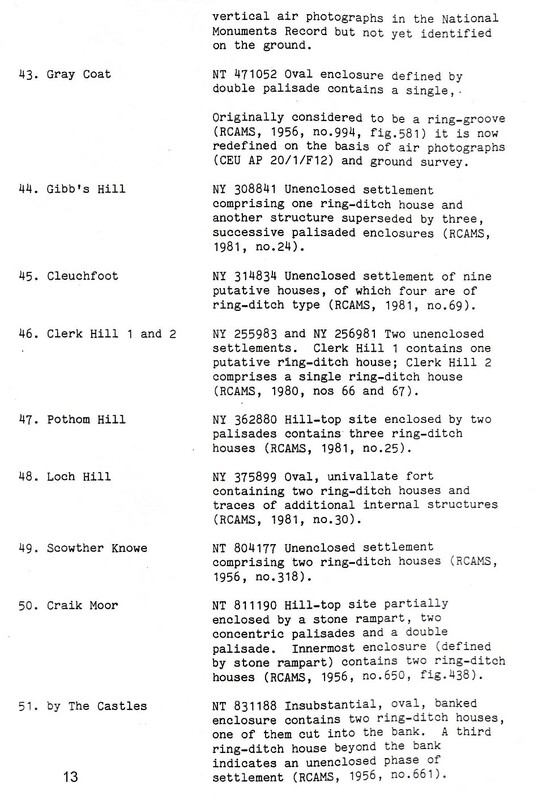 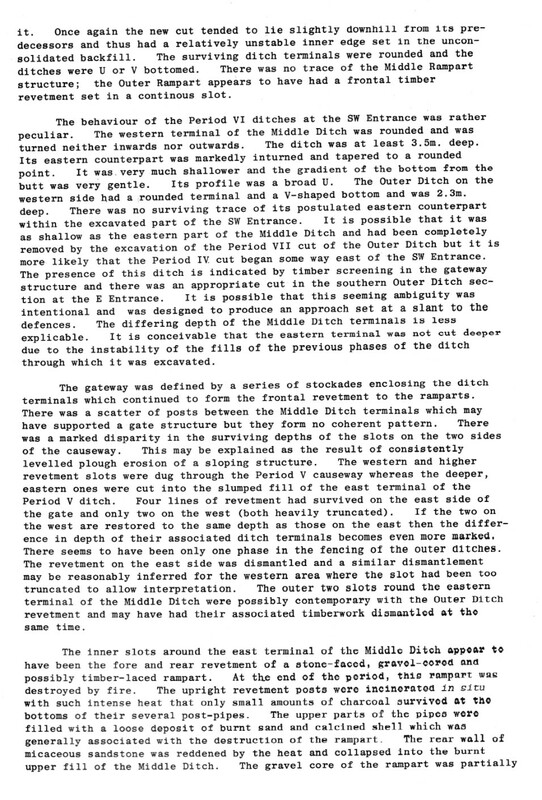 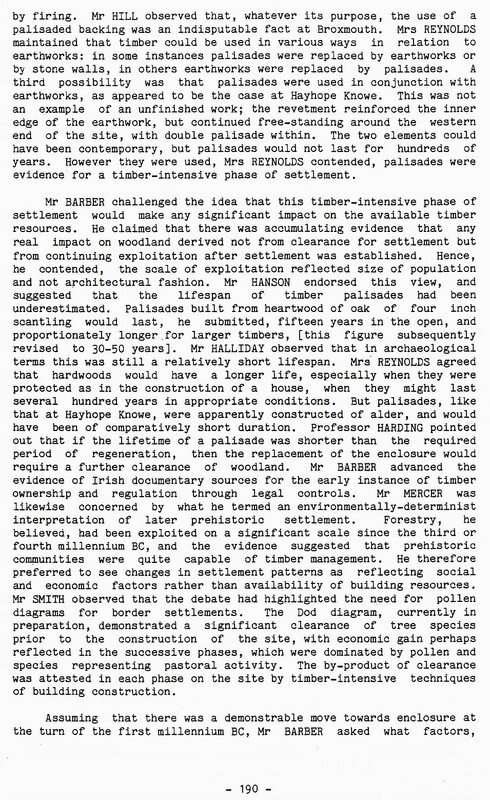 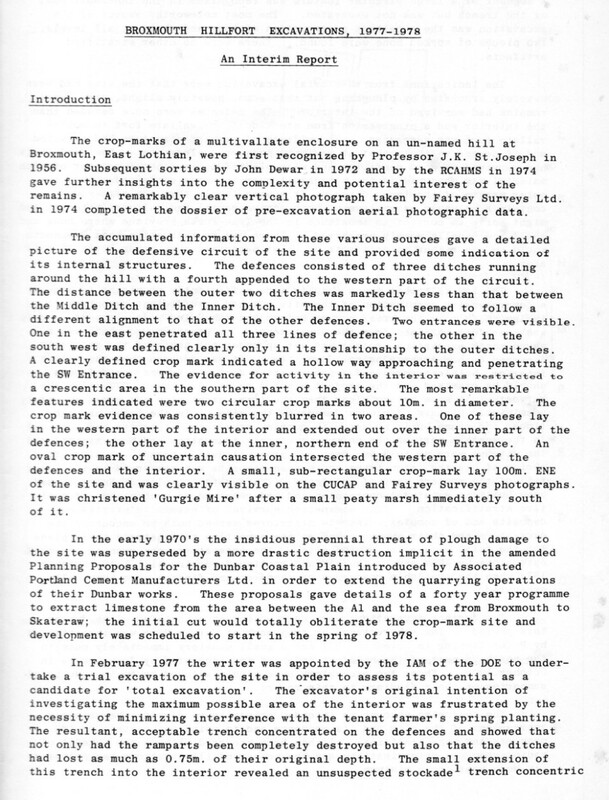 HILLSIDE HOTEL: During the building of the extension along the aforementioned Kirkill banking in the first half of the 20th century cists were detected. 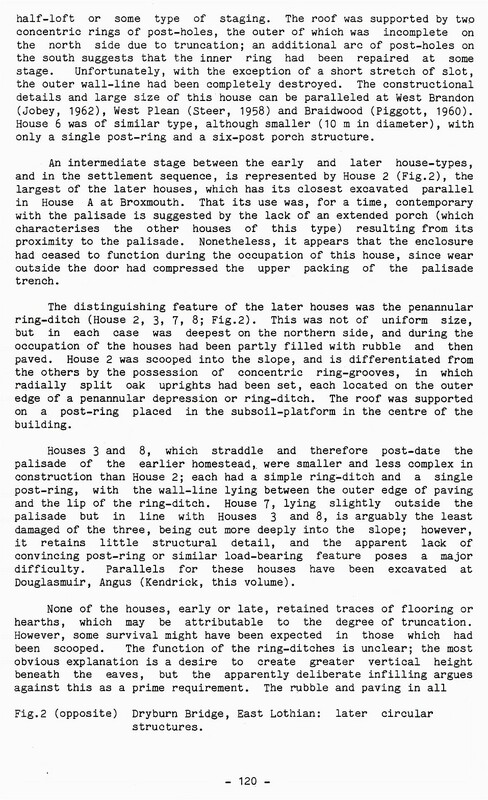 STAFFORD HOUSE: In the early 1900’s a cist was discovered in the grounds of this Bayswell Park residence. 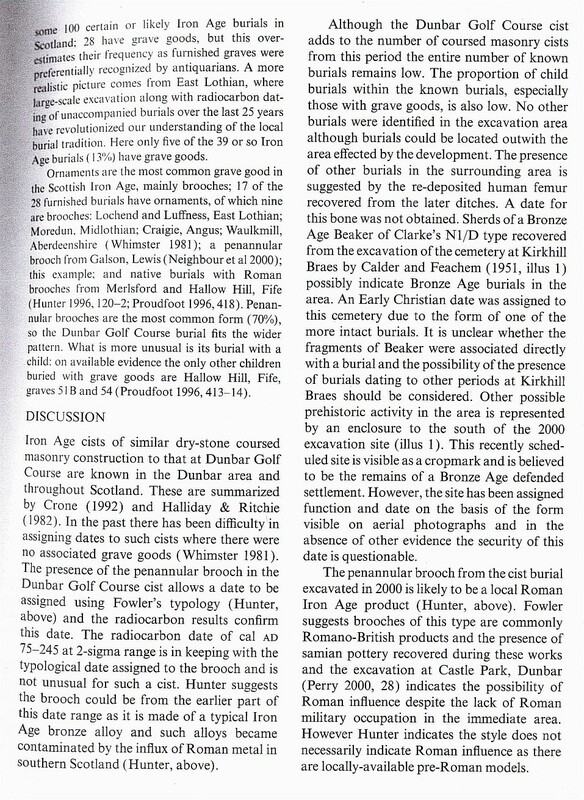 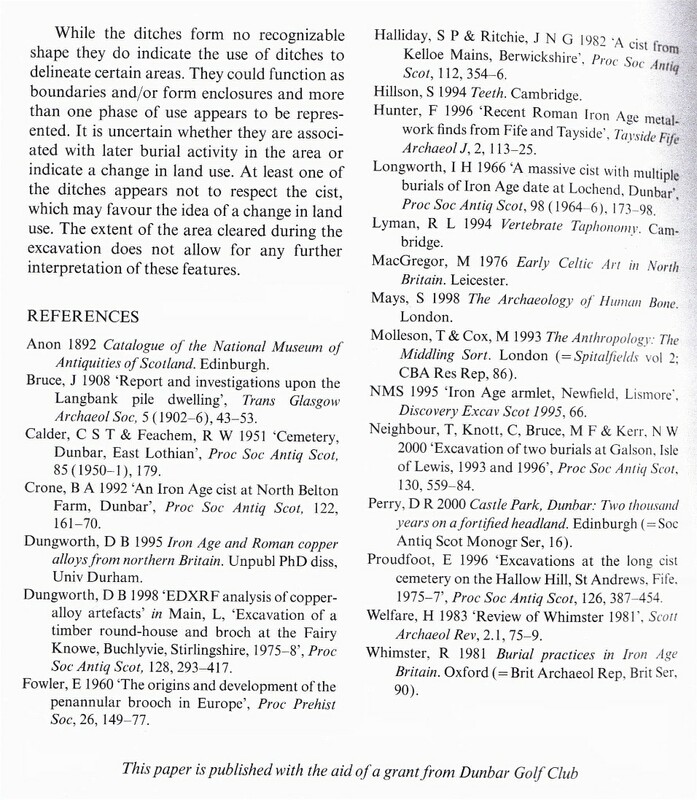 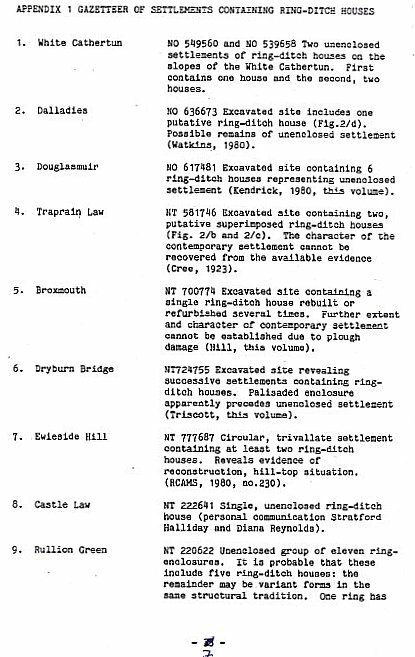 WINTERFIELD: Subsequent to the many listed above more burials were discovered on the point, (14th hole) midway along Clancy’s fairway 12th- during the 1990’s and to the SE of the Whelkie Heugh Near 8th green. 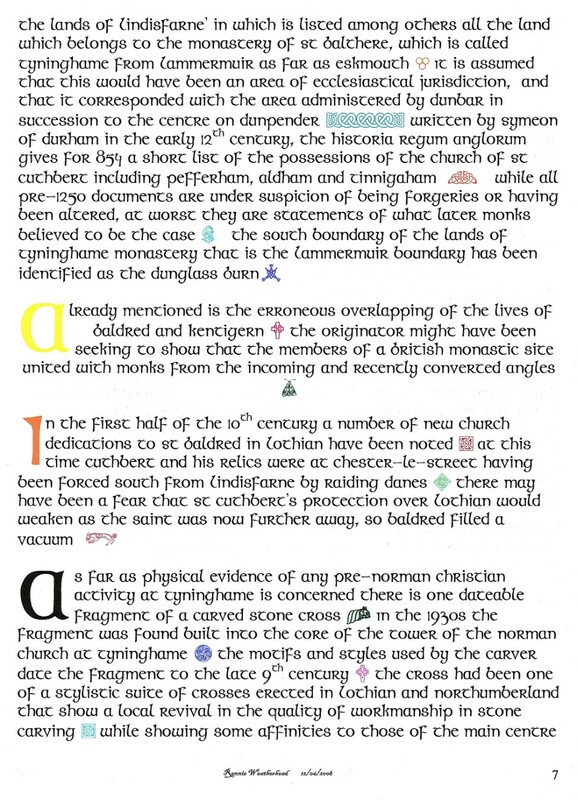 As we draw matters to a close on our History1 pages we are pleased to include some "illuminated" writing by Rennie Weatherhead. 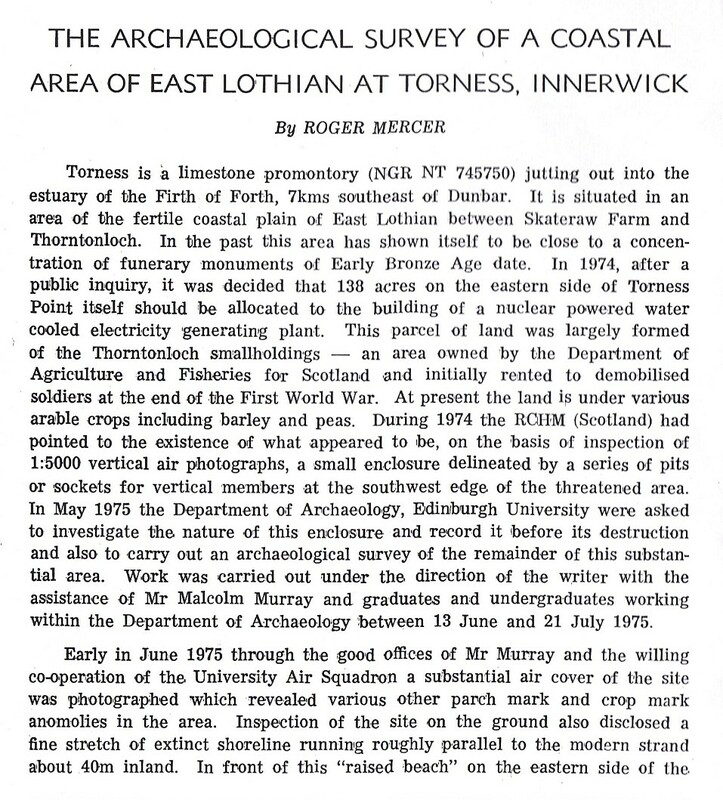 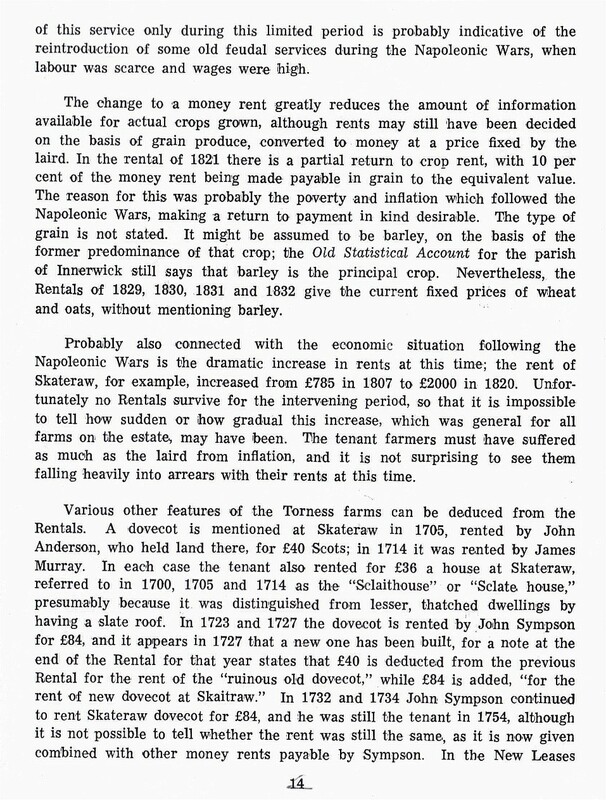 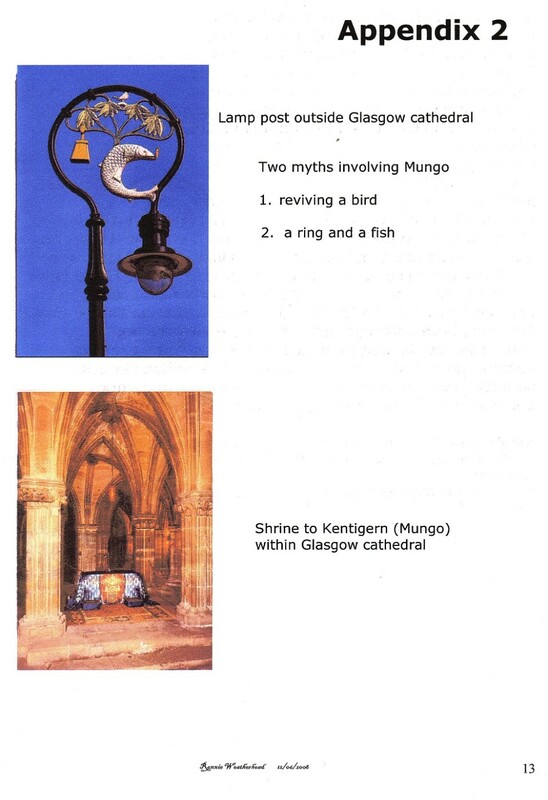 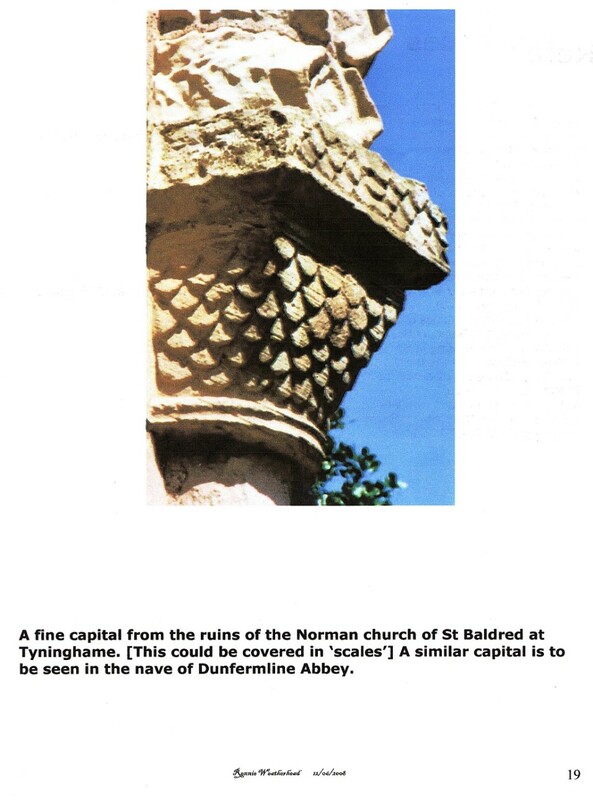 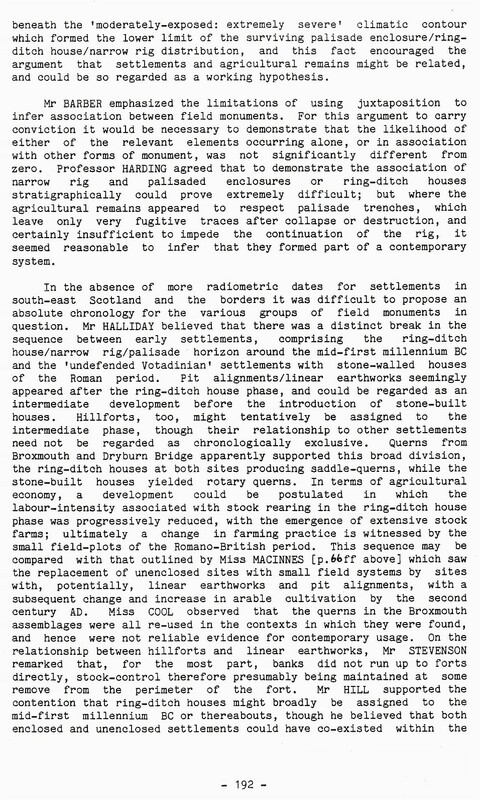 Rennie was a former Principal Teacher of Science at Dunbar Grammar, renowned authority on Coldingham Priory and student of the etymology of the coastal place names of East Lothian and Berwickshire. 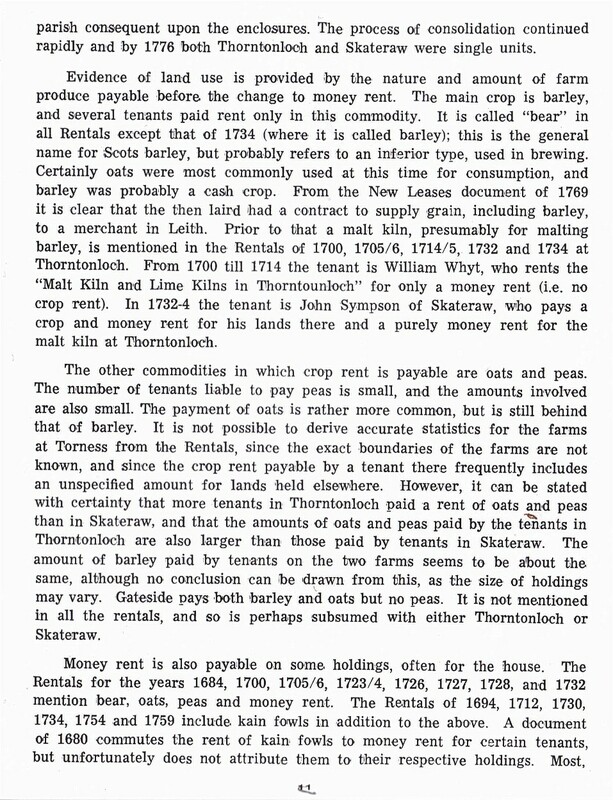 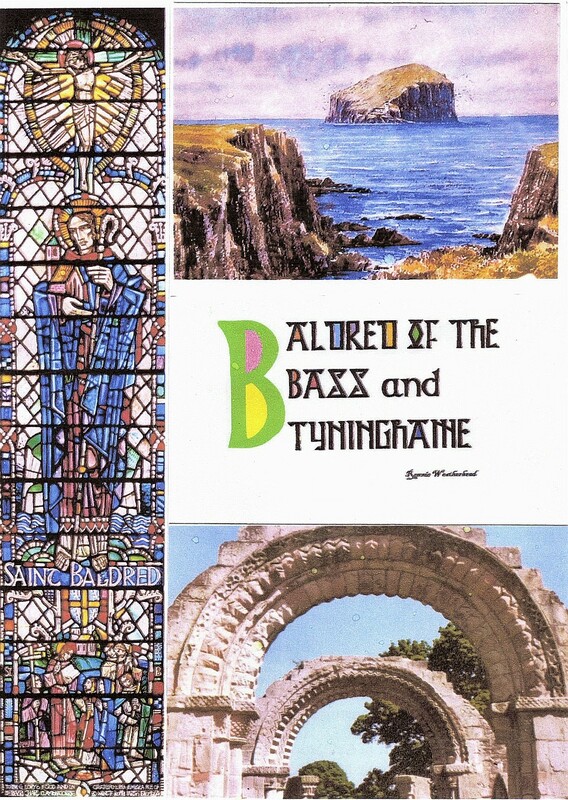 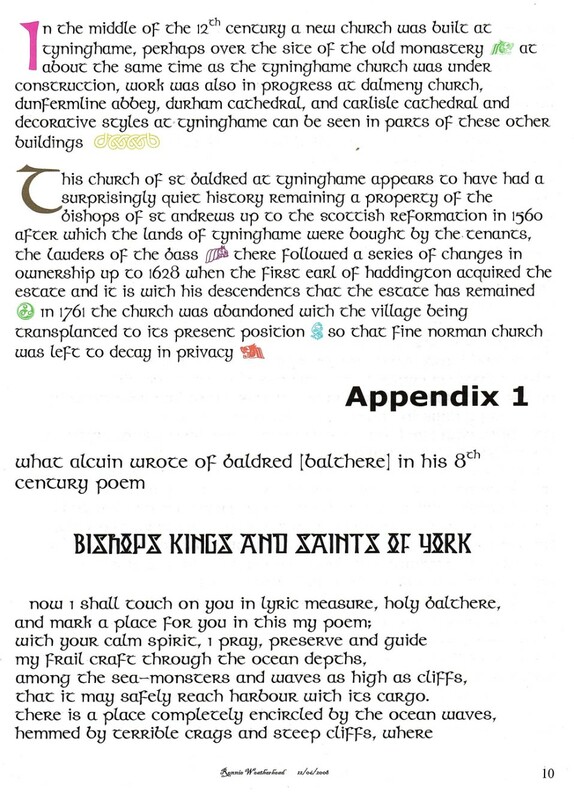 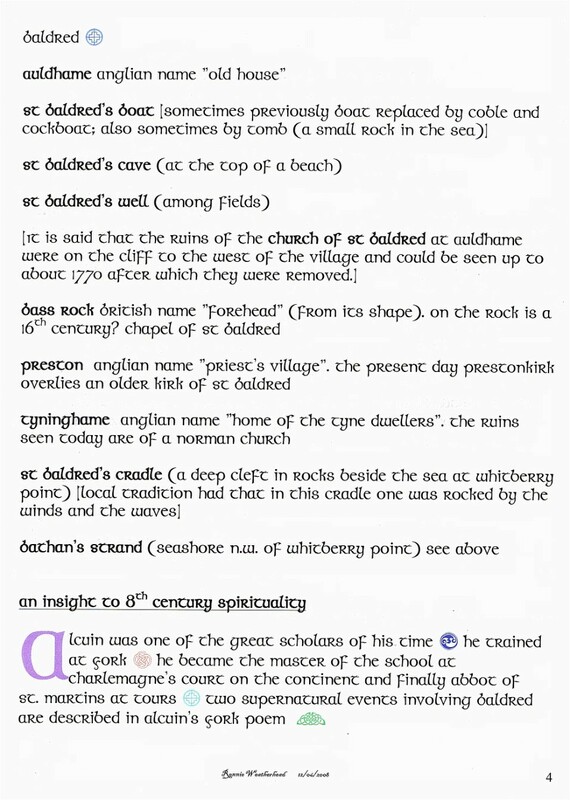 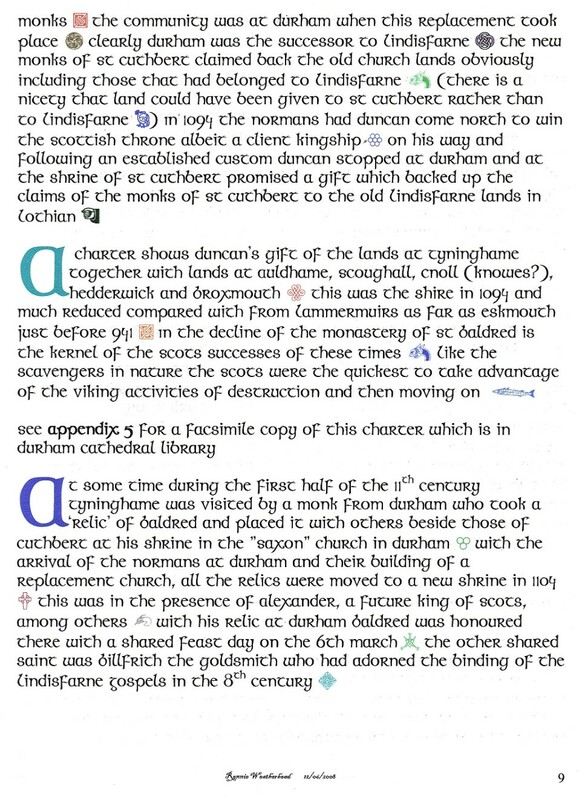 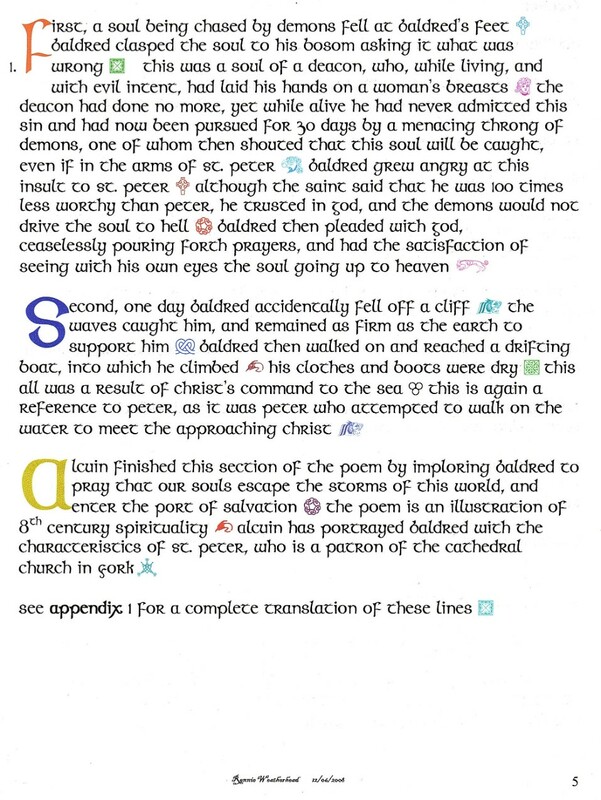 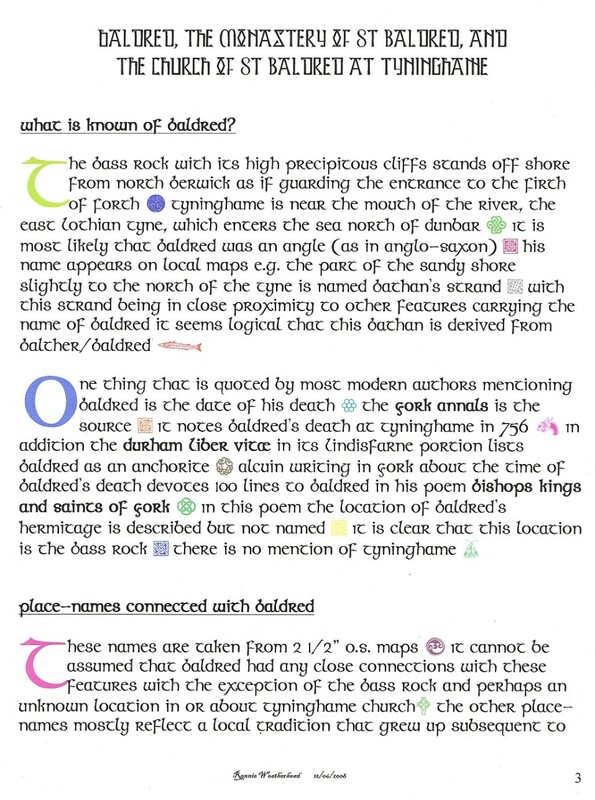 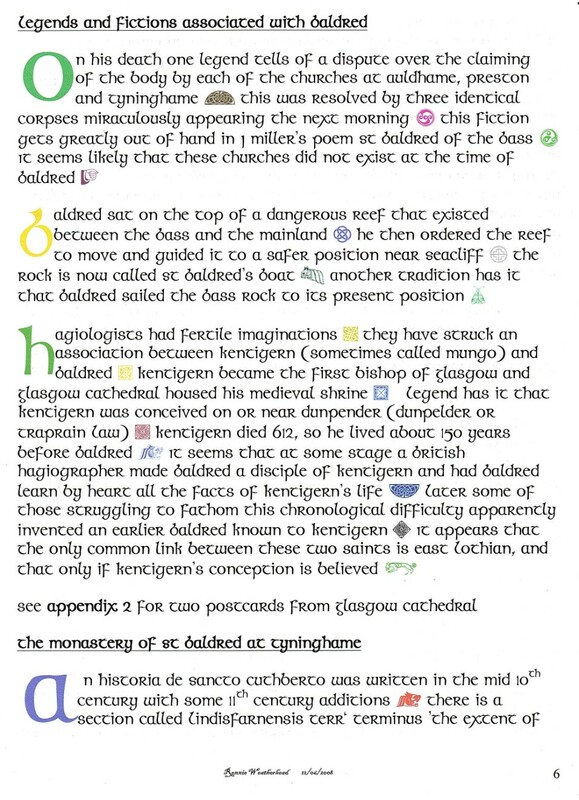 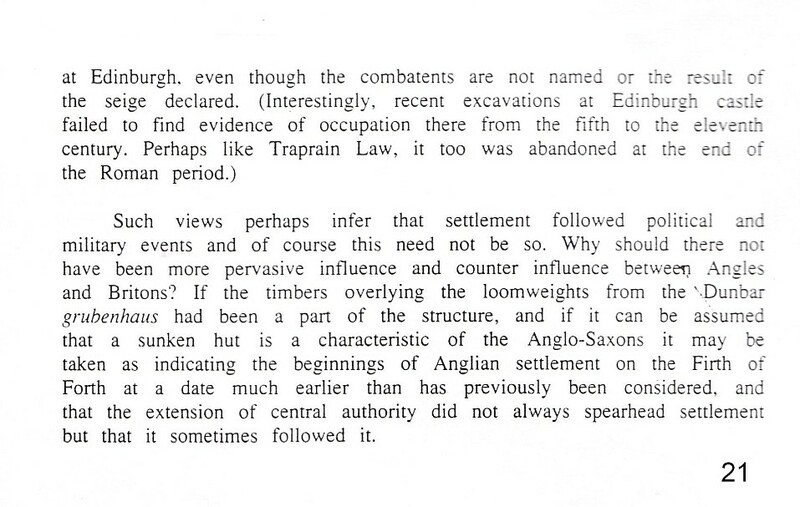 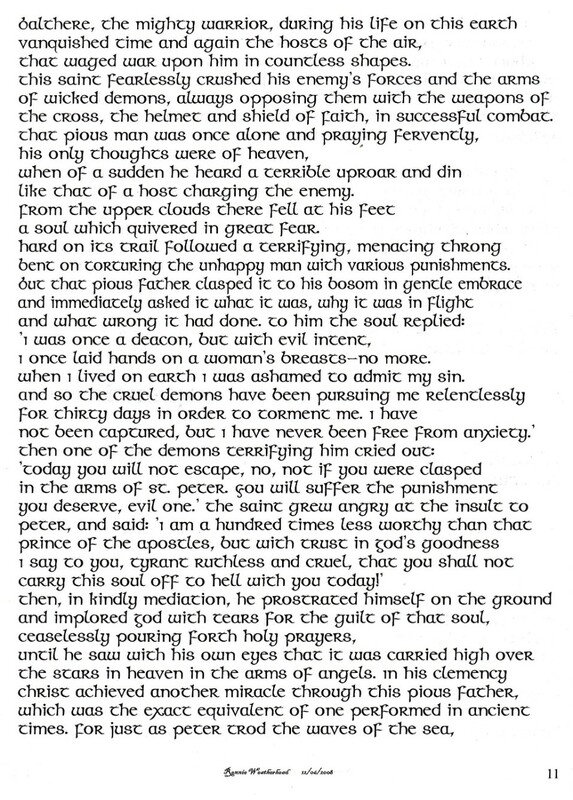 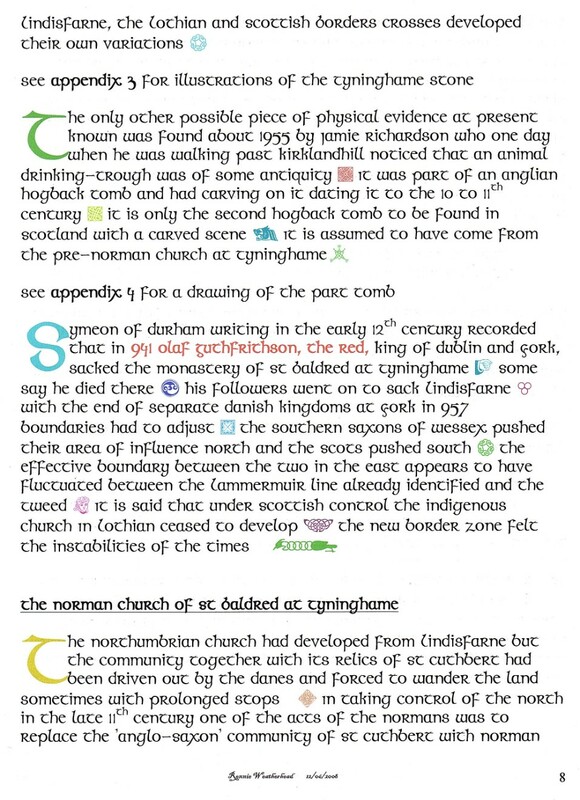 Thanks to Rennie for allowing our uploading of his enlightening 'Baldred of the Bass & Tyninghame' Dark Age/Anglian study on to our website.